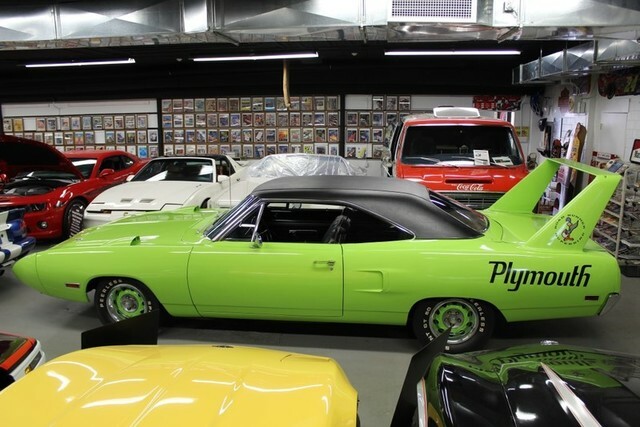 THE EXCITING SEVENTH SESSION OF THE DON SMITH COLLECTION FEATURES HIS VAST COLLECTION OF OVER 170 RARE & HISTORIC RACE CARS, ANTIQUE, MUSCLE & PASSENGER CARS, MOTORCYCLES, AUTO RACING MEMORABILIA & MUCH MORE. THE AUCTION EVENT OF THE YEAR! THE EXCITING SEVENTH SESSION OF THE DON SMITH COLLECTION FEATURES HIS VAST COLLECTION OF OVER 170 RARE & HISTORIC RACE CARS, ANTIQUE, MUSCLE & PASSENGER CARS, MOTORCYCLES, AUTO RACING MEMORABILIA & MUCH MORE. DON’T MISS THIS OPPORTUNITY TO OWN PART OF THIS VERY SPECIAL COLLECTION. THERE WILL BE NO PRE-SALES OF ANY ITEMS. 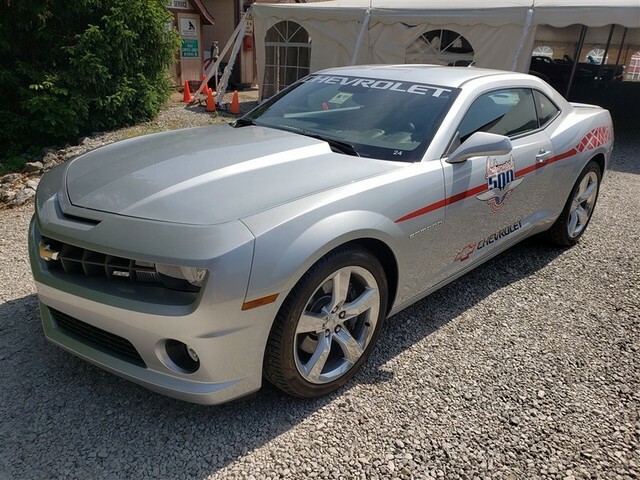 TICKETS ARE $100/PERSON IN ADVANCE FOR JUNE 23RD CAR DAY. TICKET HOLDERS WILL BE CREDITED $50 TOWARDS THEIR PURCHASES ON THAT DAY. NO CHARGE FOR TICKETS TO SESSION VIII ON SUNDAY, JUNE 24TH! WE HAVE 500 SEATS INCLUDING 200 PREFERRED SEATS FOR SALE NOW. THE REMAINING SEATS ARE AVAILABLE TO TICKET HOLDERS ON A FIRST-COME, FIRST-SERVED BASIS. 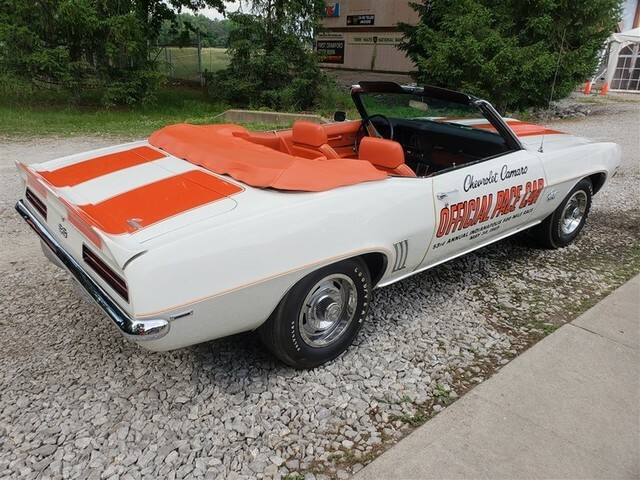 AUCTION & PREVIEW INFORMATION INCLUDING FREE PARKING & SHUTTLE SERVICE. COMPLETE BIDDER TERMS & CONDITIONS OF SALE, BIDDER ACKNOWLEDGEMENT TO TERMS & SAMPLE BANK LETTER OF GUARANTEE. VIEW COMPLETE CATALOG & REGISTER TO BID ONLINE DURING THE LIVE AUCTION. THERE WILL BE NO REMOVAL ON SATURDAYS, SUNDAYS, OR PREVIEW DAYS. ANY VEHICLES REMAINING AFTER JULY 7 WILL BE ASSESSED A $50.00/DAY STORAGE FEE. OR CHOOSE YOUR OWN COMPANY. 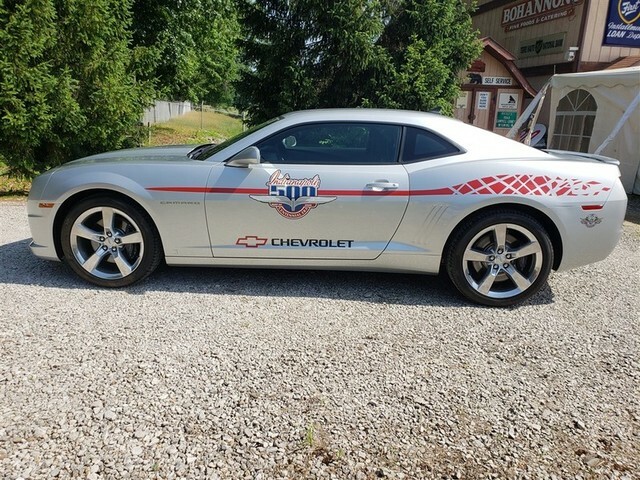 (19) INDY 500 PACE CARS! 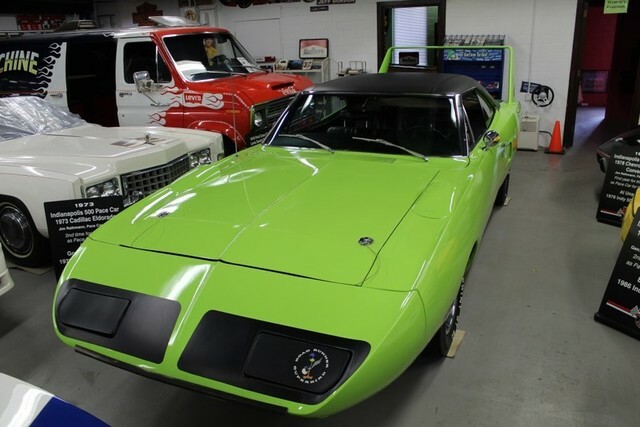 JOHN WEITZ-DESIGNED X-600 ROADSTER – ONE-OF-A-KIND! (19) SPRINT CARS, INCLUDING THE #2 BARDAHL SPECIAL! 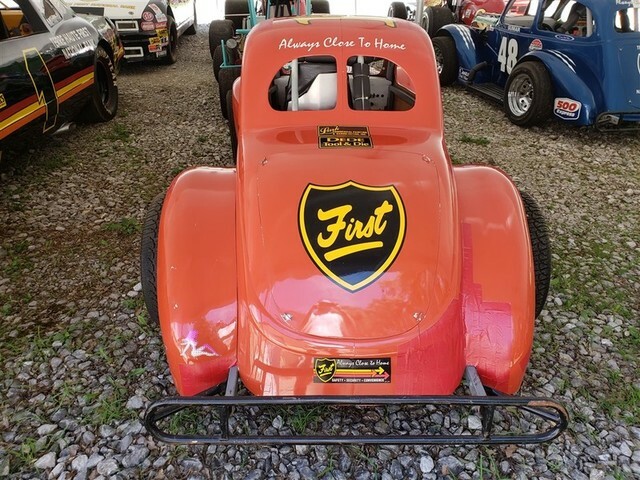 1/4 MIDGET, #8 “JUNE BUG”; DRIVER: PONCHO CARTER; WON RACES IN INDIANA AND ILLINOIS; RESTORED BY JIM BEASLEY; KURTIS KRAFT CHASSIS; CONTINENTAL SINGLE CYL. 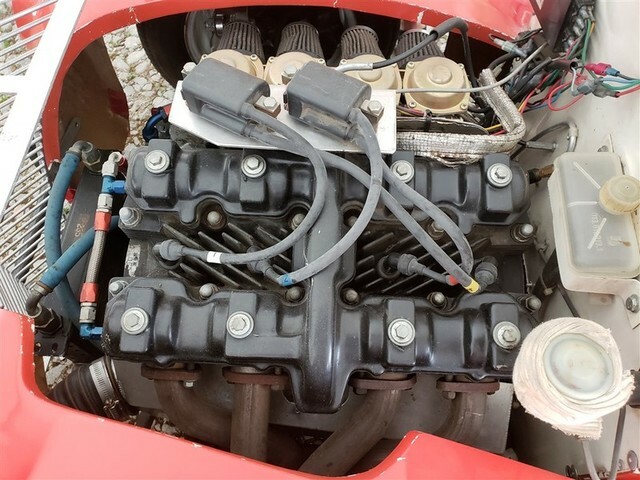 7.5 CID ENGINE; PARALLEL TORSION SUSPENSION; DIRECT STEERING; MODELED AFTER A KURTIS KRAFT INDIANAPOLIS 500 ROADSTER. 1937 MIDGET “MISS PEPSI”, #4 WHITE W/ RED AND BLACK TRIM; RESTORED BY VAN’S METAL CRAFT AND RETIRED INDY DRIVER BOB HARKEY; THIS 1937 MIDGET FEATURING A RAIL FRAME AND ALUMINUM BODY CAME OUT OF THE BILL HARRAH MUSEUM IN RENO, NV. 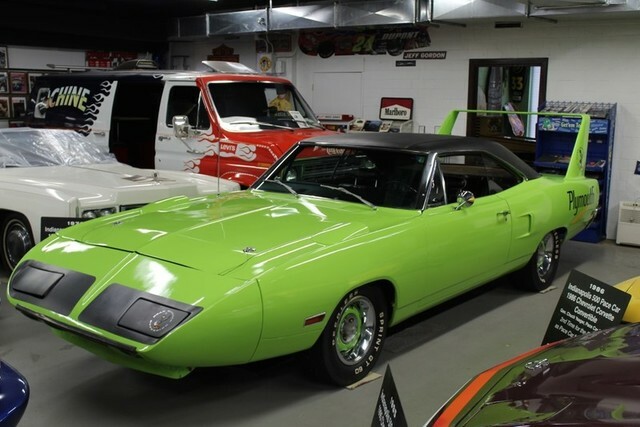 IT RACED EXTENSIVELY AROUND THE USA. 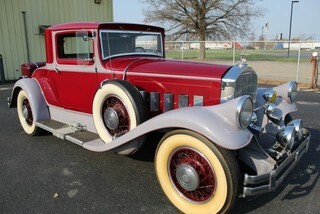 IT IS RESTORED AS IT RAN IN INDY IN THE LATE 1930’S. THESE ARE THE TYPES OF CARS THAT RAN THE GILMORE STADIUM IN L.A. AND THE NUTLEY VELODROME IN NUTLEY, NJ. 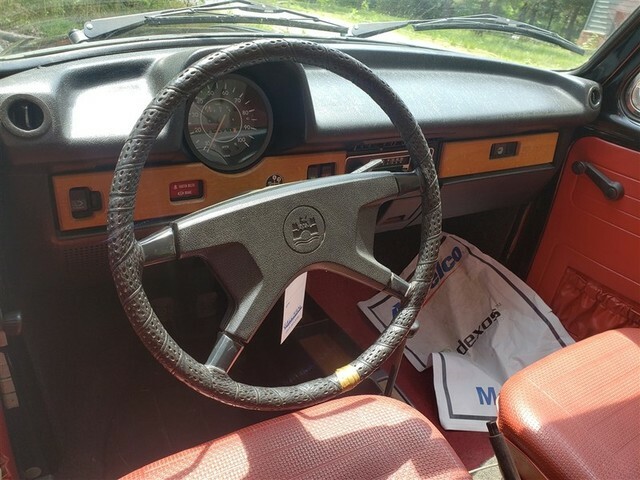 THIS IS A RUNNER AND IS ALL ORIGINAL EXCEPT FOR THE UPHOLSTERY WHICH WAS REPLACED BECAUSE THE ORIGINAL WAS DISINTEGRATING; ELTO OUTBOARD 4 CYL., KICK UPS OVER REAR AXLE, TUBE CROSS SECTIONS, FRICTION SNUBBERS, VERY LIGHT WEIGHT. 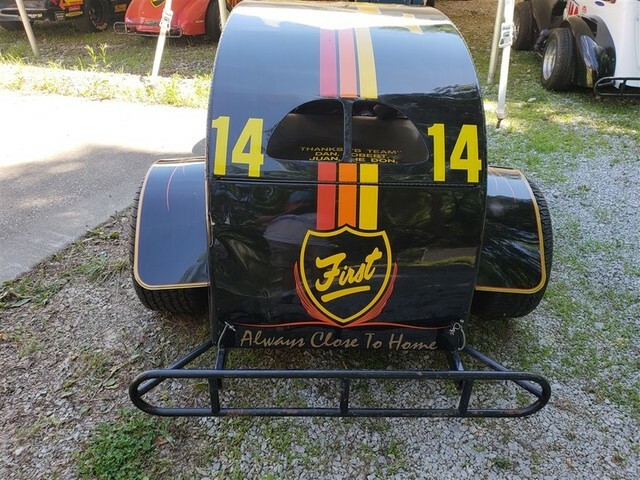 FULL MIDGET, #1″MCNAMARA SPECIAL”; BLACK TERRE HAUTE FIRST NATIONAL BANK, SER# 059-47; BUILT BY FRANK KURTIS IN 1947; RESTORED BY ED HITZE AND JIM ROBBINS; DRIVEN BY ANDY LINDEN, JACK MCGRATH, MIKE NAZARUK, PAT FLAIRITY, BOB WENTE, JIMMY DAVIES, ART CROSS, BOB KARKEY, RONNIE DUMAN, BILL PUTERBOUGH, BOBBY GRIMM AND MANY MORE; RAN AAA AND USAC INDOORS AND OUT IN USA AND CANADA; KURTIS KRAFT CHASSIS, 110 CI OFFENHAUSER D.O. CAMS 4 CYL,, ROLL BAR ADDED 1960, CHROME MOLEY 4130 SPACE FRAME, HUDYHA SHOCKS. 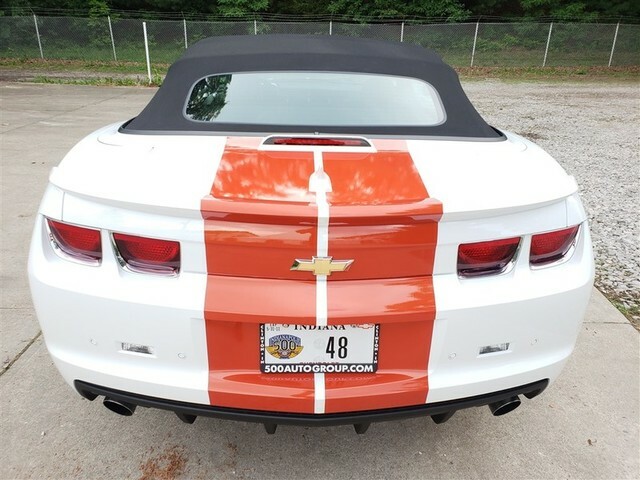 COLOR YELLOW SILVER LEAF W/ RED AND BLACK TRIM. MIDGET CAR, #78. BUILT BY RED CARRUTHERS; DRIVEN BY JOHNNY BENSON, BOBBY OLIVERO AND LONNIE CARRUTHERS; A RADICAL CAR IN ITS DAY, WITH UNUSUAL, LIGHT FRAME. THE ALUMINUM BODY WAS BUILT WITH THE HELP OF DRIVER JOHNNY BENSON AND FEATURED A UNIQUE NOSE THAT PREVENTED MUD FROM PACKING UP. THE CAR WAS QUITE SUCCESSFUL ON SHORT TRACKS. 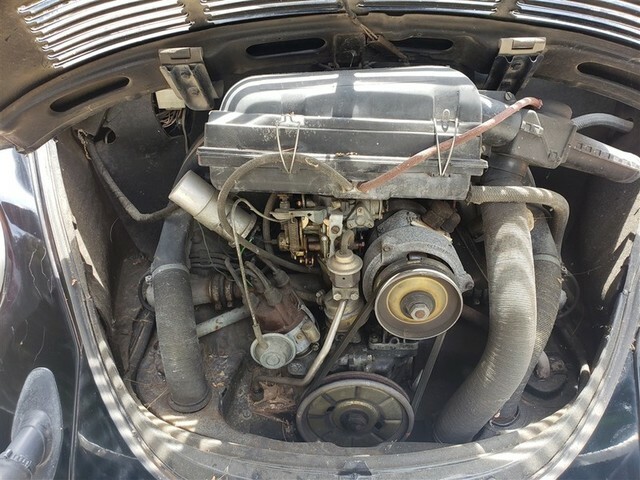 POWERED BY A FLAT FOUR VOLKSWAGEN THE ENGINE. TUBE FRAME, TUBE SHOCKS, AIRHEART DISC BRAKES.RESTORED BY LONNIE CARRUTHERS; ALUMINUM BODY, LTC RESEARCH MIDGET CHASSIS, VW FLAT 4 CYL. 132 CI, 4130 TUBE FRAME, TUBE SHOCKS, AIR HEART DISC BRAKES. 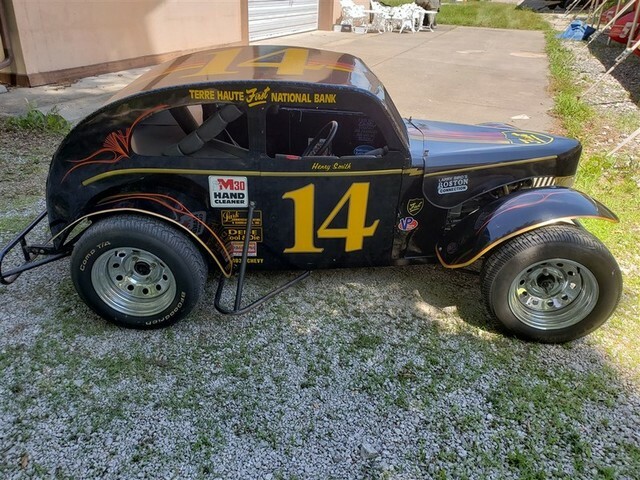 1990’S GAMBLER STYLE MIDGET, #15 WHITE, TRIMMED RED AND BLACK; THIS IS ANOTHER CAR WITH TERRE HAUTE TIES. THIS ONE WAS SPONSORED BY CLABBER GIRL BAKING POWDER OF HULMAN & COMPANY. JASON LYNCH DROVE THIS CAR MOST OF THE TIME. 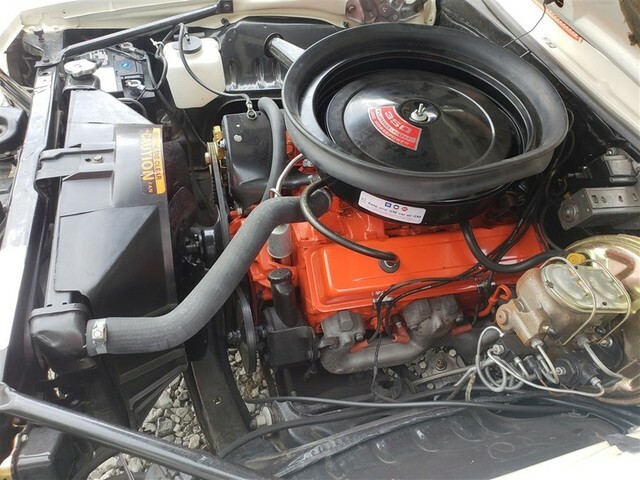 THE CAR WAS MOST SUCCESSFUL ON PAVED TRACK OF 1/2 MILE OR LONGER WITH THE LONG TORQUE CURVE WHEN THESE PONTIAC ENGINES COULD BE USED; PONTIAC 4 CUL 140 CI, SPACE FRAME, STABILIZER BARS FROM COCKPIT CAGE TO FRONT CROSS STRUT, TUBE SHOCKS, OUTBOARD OIL TANK. 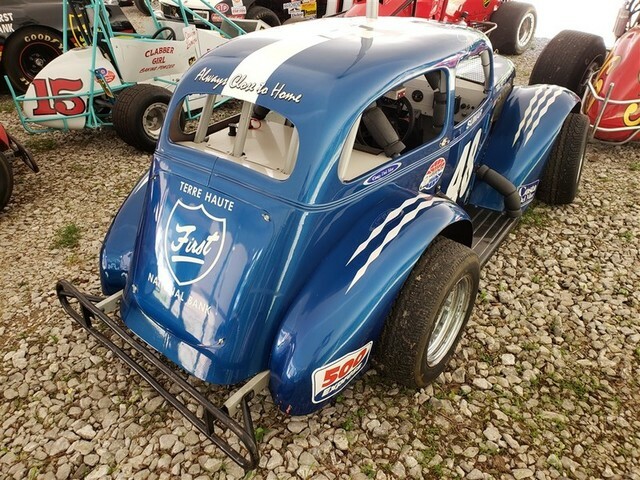 1976 MIDGET CAR, #2M RED, WHITE AND BLUE; BUILT BY GRANT KING; DRIVEN BY RICH VOGLER; BUILT FOR DOUG CARRUTHERS; RICH VOGLER WON THE HUT HUNDRED IN THIS CAR AND MANY OTHER RACES. 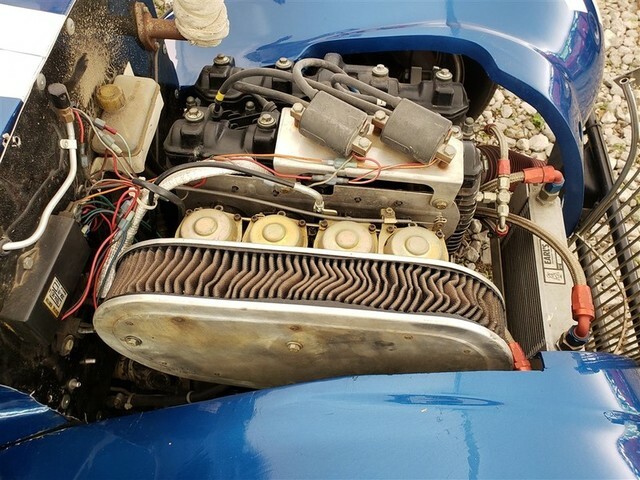 THE CAR HAD MANY INNOVATIONS SUCH AS PORSCHE RODS AND PISTONS IN THE ENGINE; GRANT KING CHASSIS, VW AUTO CRAFT FLAT 4 132 CI, CHROME MOLEY 3140 SPACE FRAME, TUBE SHOCKS, CROSS TORSION, SISSY BARS AROUND THE ENGINE, LONG RADIUS RODS. 1930’S LOOK MIDGET, #23 BLUE AND WHITE; RESTORED BY DENNIE MOORE; THIS CAR HAS AN UNUSUAL HISTORY. 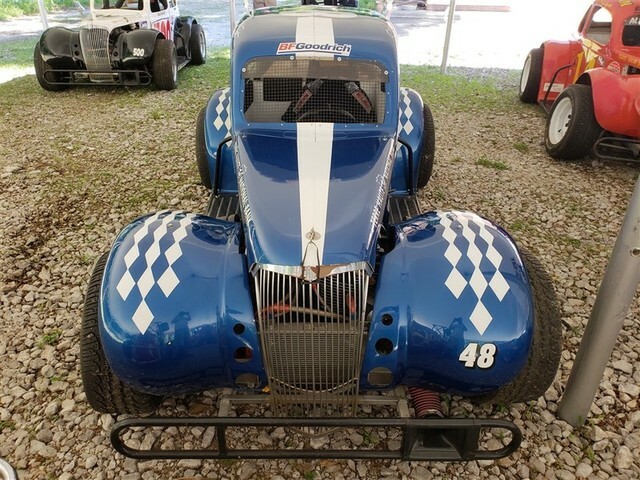 DENNIE MOORE, FORMER MODIFIED DRIVER AND INDY CHIEF MECHANIC FOR JOHN ZINK RACING, FOUND THIS FRAME AND BODY IN A BARN IN KANSAS. 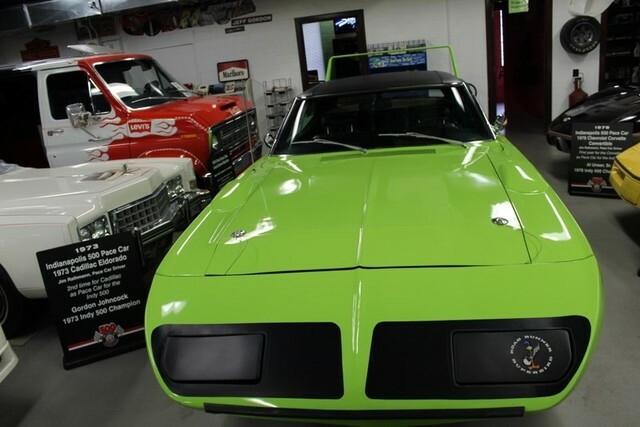 HE PURCHASED IT IN THE 1980’S, TOOK IT HOME TO HIS SHOP IN TULSA. HE BUILT A NEW FRAME RAIL FOR IT AND THEN BUILT UP ALL THE MISSING PARTS. HE DROVE IT HIMSELF IN MANY VINTAGE RACES AT THE CHILI BOWL; FORD 60 V8. 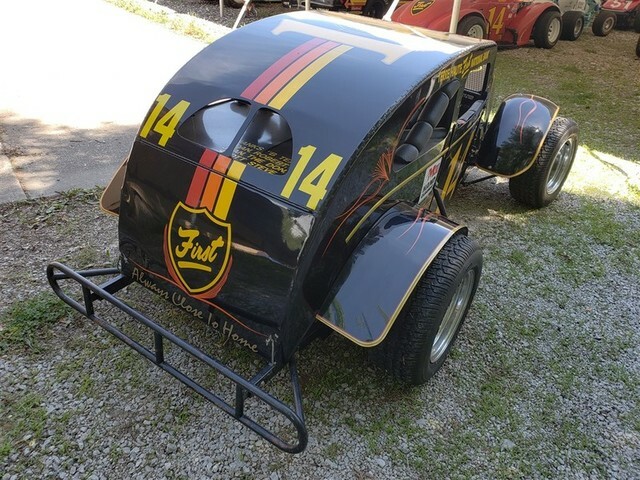 1973 RESEARCH MIDGET, THE ORIGINAL. #78 YELLOW SILVER LEAF; DRIVER SHERMAN ARMSTRONG JR. PURCHASED THIS CAR IN 1979 AND FINISHED 8TH IN 1981 USAC MIDGET STANDINGS AND WON “ROOKIE OF THE YEAR” AWARD. ROBERT LOWE WON 1984-85 INDOOR CHAMPIONSHIP IN FORT WAYNE, IN, 1984 HUT 100, AND 1984 YELLOW CAB 500-LAP RACE AT SPEEDROME, 1985 HUT 100, 1987 INAUGURAL “CHILI BOWL”. DRIVEN BY RICH VOGLER, GARY BETTENHAUSEN, NICK FORNORO, JR., MACK MCLELLEN, GREG LEFFLER, AND SHERMAN ARMSTRONG, JR. 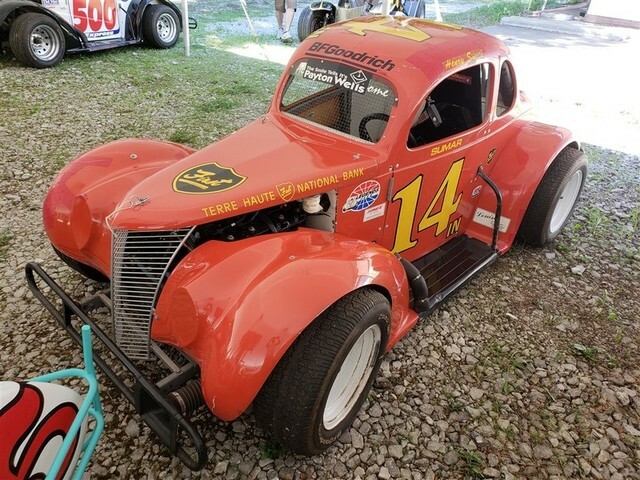 RESTORED BY ED NORTON; THIS CAR WAS RUN IN VINTAGE RACES OFTEN. LAST APPEARING AT RACEWAY PARK IN INDY IN LATE SEPTEMBER 2002. 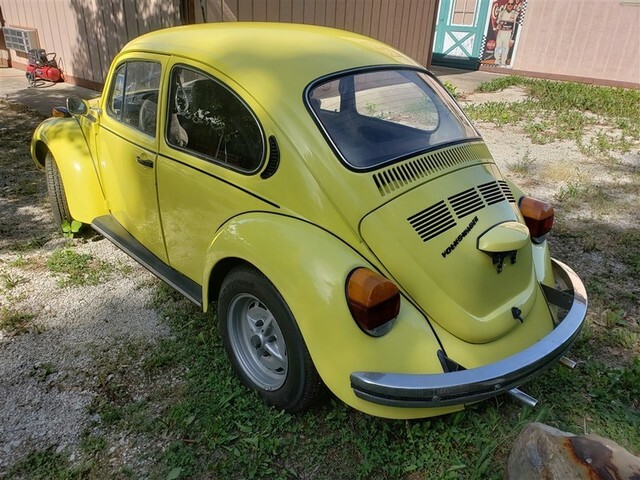 THIS CAR FEATURES A FRESH AUTOCRAFT VW ENGINE; L.T.C. 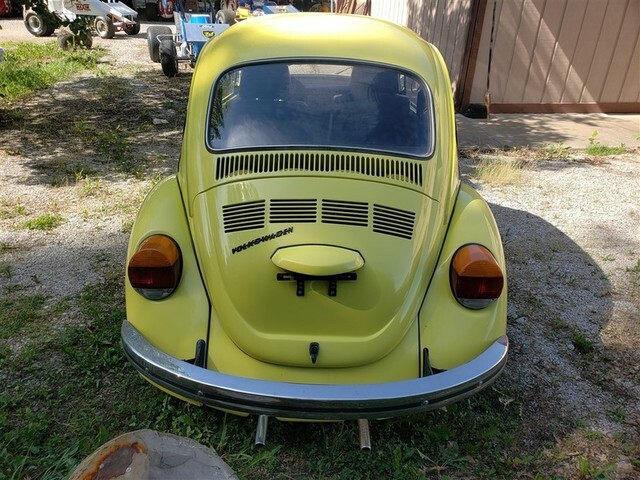 CHASSIS, VW FLAT 4 132 CI. COLOR BLACK/WHITE. 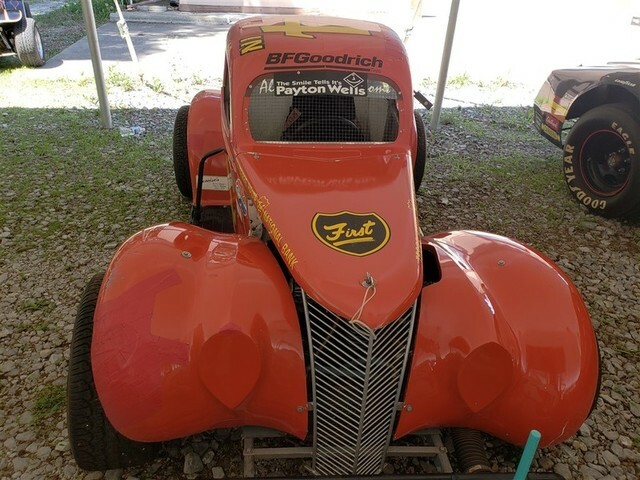 THIS IS A BEN COOK CHASSIS, POWERED BY A FOUR CYLINDER VOLKSWAGEN ENGINE WITH TWIN WEBER CARBURETORS. BUILT BY GRANT KING WITH SOME MODIFICATIONS BY DON VOGLER, FATHER OF RICH VOGLER. DON VOGLER DROVE THE CAR IN OUTLAW EVENTS, AND RICH DROVE IT IN USAC EVENTS. RICH VOGLER EVENTUALLY MOVED UP THE RANKS AND STARTED AT THE INDIANAPOLIS 500. COLOR GREEN & BLACK. 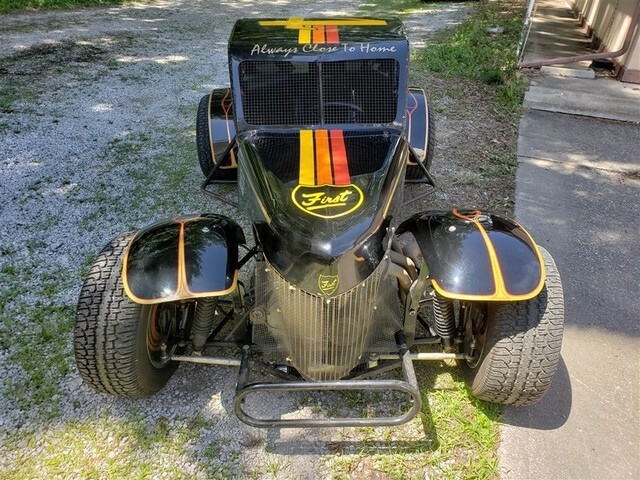 THIS CAR WAS STATE OF THE ART FOR ITS TIME; SMALL TUBE ALL-AROUND ANIMAL III CHASSIS, ROLL CAGE, SISSY BARS, AND NERF BARS. 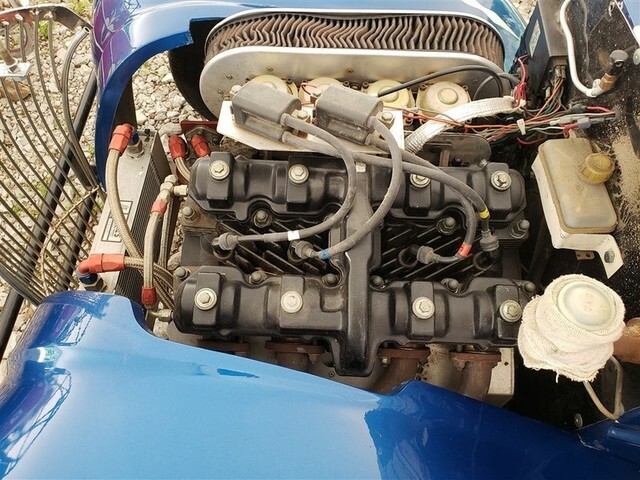 THE CAR WAS POWERED BY A ONE CYLINDER, THREE HORSEPOWER CONTINENTAL MOTOR. TUBE SHOCKS, CROSS TORSION FRONT, PARALLEL REAR SUSPENSION. COMBO CAR, #51 RED WHITE AND BLACK; BUILT BY BOB EAST; DRIVEN BY RUSS GAMESTER & DONNY BEECHER; OWNED BY GAMESTER RACING; IT IS CALLED A DUO CAR BECAUSE THE DESIGN IS A COMPROMISE BETWEEN EXCLUSIVE DIRT MACHINE AND PAVEMENT; JIMMY KEKKER WON SEVERAL RACES BEFORE IT WAS PURCHASED BY GAMESTER RACING; RUSS GAMESTER WON ONE RACE IN SPRINGFIELD AND ONE AT DU QUOIN WITH THIS CAR; BEAST CHASSIS, SILVER CROWN, CHEVROLET V8 355 CI, 4130 CHROME MOLLY FRAME, SINGLE LARGE DISK BRAKE ON REAR AXLE, COIL OVER FRONT SUSPENSION SHOCKS, FUEL TANK AND TAIL ONE PIECE, OFFSET CHASSIS TO THE LEFT. A GREAT DISPLAY CAR WITH A MOCK-UP ENGINE AND STEERING, NO FRONT RIGHT BRAKE. 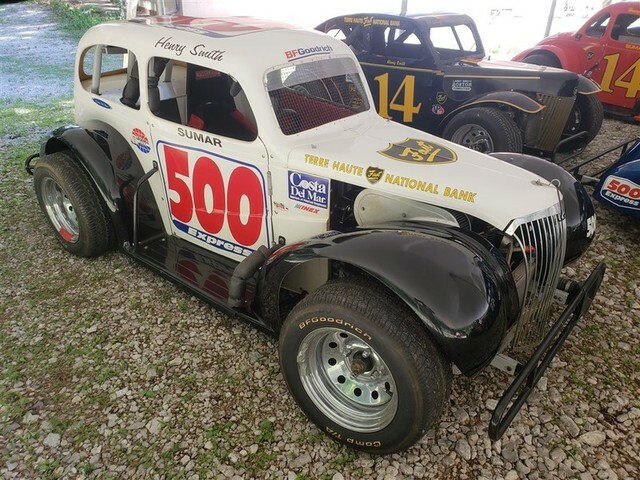 DIRT CAR, #56 DAY GLOW RED; BUILT BY EDDIE KUZMAN; DRIVEN BY JOHNNY THOMPSON AND JIM HURTIBISE; RESTORED BY JIM ROBBINS; THOMPSON WON FIVE USAC BIG CAR FEATURES AND HURTIBISE WON THREE 100 MILE CHAMPIONSHIP RACES, HAND FORMED ALUMINUM BODY, ROLL BAR ADDED IN 1960’S, CHROME MOLEY 4130 SPACE FRAME, TUBE CHASSIS. COLOR RED. OWNER ED & TRUDY GRAF. THIS CAR RACED FOR MANY YEARS, THE LAST BEING 1989. ELEVEN DRIVERS DROVE THIS CAR DURING ITS LONG RUN. 1996 DIRT CAR, #12 USAC SILVER CROWN; BUILT BY ROBERT GALAS; DRIVEN BY KEVIN THOMAS; RESTORED BY ROBERT GALAS; ROBERT GALAS WAS THE FATHER OF INVENTION WHEN IT CAME TO THE COCKPIT OF A DIRT CAR. HE PUT ALL THE WEIGHT JACKERS, POWER STEERING, FIRE BOTTLE AND OTHER GADGETS IN THE COCKPIT THAT CAN GIVE HIS DRIVER THE ADDED ADVANTAGE; THIS CAR WON THE TERRE HAUTE CHAMPIONSHIP DIRT RACE 7/5/1996 WITH THOMAS BEHIND THE WHEEL; GALAS CHASSIS, CHEVROLET V8 350 CI, 4 BAR CROSS TORSION, TUBE SHOCKS ALL AROUND, STABILIZING BARS FROM CAGE TO FRONT SHOCKS. COLOR RED. 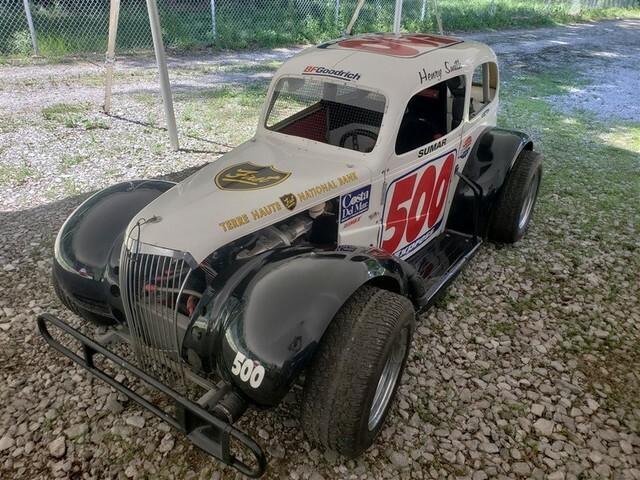 1960’S CHAMP DIRT CAR, #46; OWNED BY EBB ROSE; BUILT BY HERB PORTER AND ROCKY PHILLIPS; RESTORED BY JIM ROBBINS; DRIVEN BY DONNIE DAVIS, JOHNNY RUTHERFORD AND ARNIE KNEPPER; DONNIE DAVIS WAS THE FIRST DRIVER OF THIS CAR. 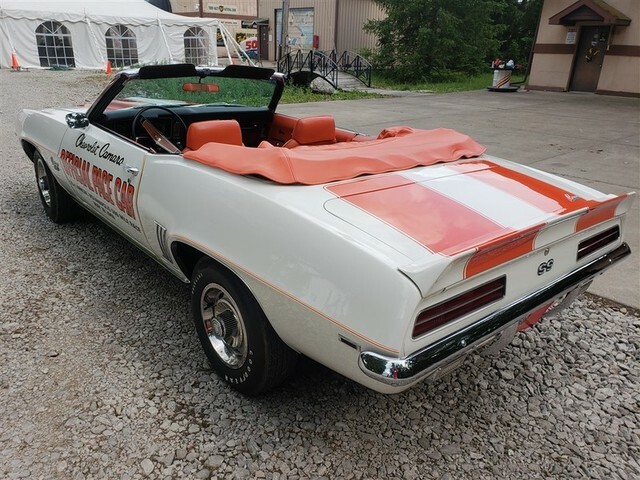 HE ELECTRIFIED THE CROWD AT THE MILWAUKEE CHAMPIONSHIP SHOW LEADING 27 OF THE 100 MILES ONLY TO SPIN INTO THE INFIELD WHEN A TIRE BLEW. DAVIS’ CAREER WAS CUT SHORT BY A SPRINT CAR CRASH THAT TOOK HIS LIFE AT NEW BREMEN, OH. ANOTHER DRIVER WHO HAD CONSIDERABLE SUCCESS WITH THIS CAR WAS JOHNNY RUTHERFORD. ARNIE KNEPPER WAS THE LAST TO DRIVE IT, BLOWING UP THE FUEL TANK DURING A PIT STOP AT THE HOOSIER HUNDRED IN THE LATE 1960’S. 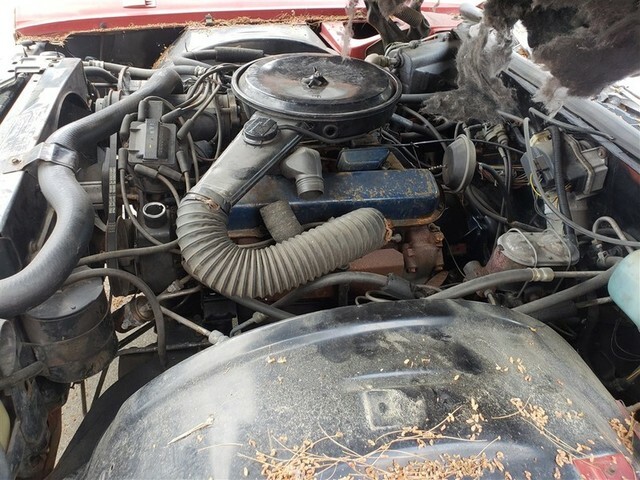 CHEVROLET V8 305 CI, 4 BAR SPACE FRAME, CROSS TORSION, 4 TUBE SHOCKS. WAS ALSO #27 AND #10. COLOR IS WHITE AND BLUE. THIS CAR WAS BUILT BY DRIVER BOB EAST ON STANTON JUGS. 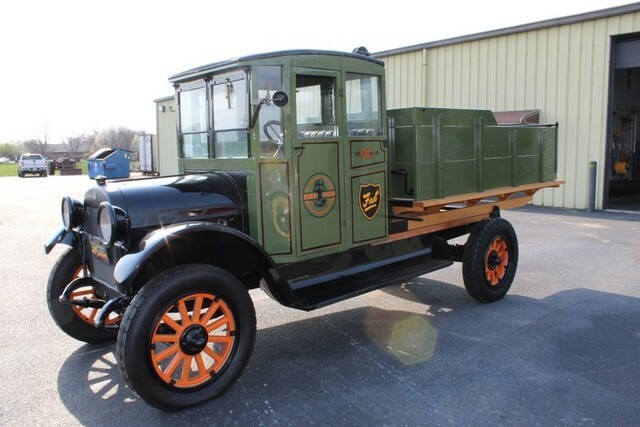 MANY CONSIDER THIS THE FIRST “BEAST” CHASSIS, BUT EAST SAID IT WAS CLOSER TO A STANTON CHASSIS THAN A BEAST. EAST BUILT THE CAR IN EXCHANGE FOR BECOMING ITS DRIVER, BUT WAS FIRED AFTER TWO RACES. THE CAR WITH ANOTHER DRIVER, WHO WENT ON TO WIN THE 1992 HULMAN 100 AT THE INDIANA STATE FAIRGROUNDS. 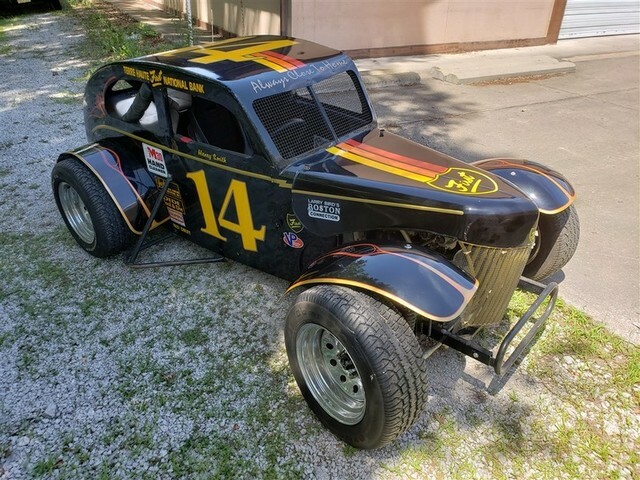 POWERED BY A 350 CHEVROLET V8 WITH STANTON BEAST SPACE FRAME CHROMOLY 4130, COIL OVER SPRING SUSPENSION, FIBERGLASS BODY. 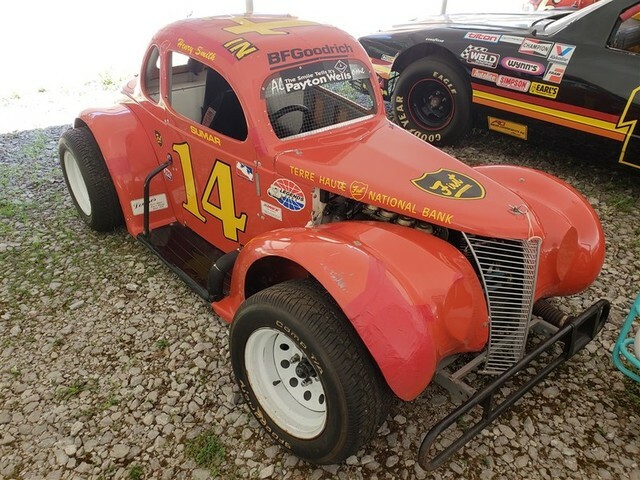 1994 NASCAR STOCK CAR #14, DRIVEN BY HUTCHERSON-PAGAN INC.; DRIVEN BY A.J. FOYT; SPONSORED BY COPENHAGEN; THIS 1994 OLDSMOBILE WAS A.J.’S LAST RIDE AT THE INDIANAPOLIS MOTOR SPEEDWAY. CAR IS COMPLETE AS IT LAST RAN INCLUDING ICE CONTAINER AND FIRE SAFETY EQUIPMENT. THE CAR IS BLACK WHICH IS A.J.’S FAVORITE COLOR; OLDSMOBILE V8 355, NASCAR FRAME. 2000 NASCAR CRAFTSMAN SERIES TRUCK, BUILT BY JACK ROUSH RACING; DRIVEN BY GREG BIFFLE; NASCAR CRAFTSMAN TRUCK SERIES WINNER IN 2000. DRIVEN BY THEN NEWCOMER GREG BIFFLE FROM VANCOUVER, WASHINGTON. THE TRUCK WON 5 FEATURE EVENTS ON ITS WAY TO THE CHAMPIONSHIP. GREG BIFFLE WAS 30 YEARS OLD WHEN HE WON THE SERIES AND ONLY STARTED RACING WHEN HE WAS 19. BENNY PARSONS SAW BIFFLE RACE IN TUSCON, AZ AND RECOMMENDED HIM TO JACK ROUSH. 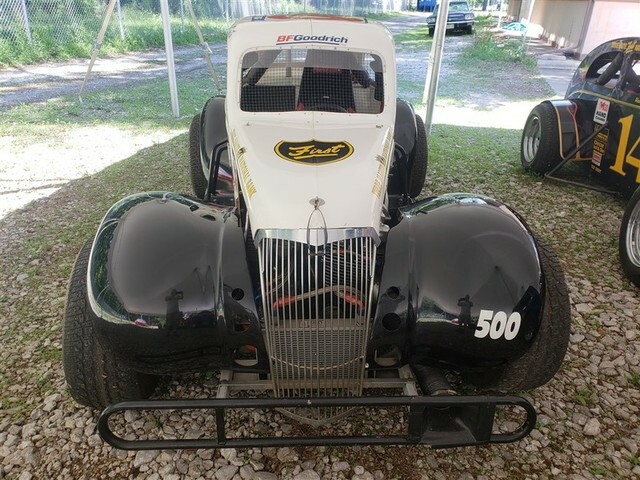 THE TRUCK ARRIVED LESS ENGINE AND TRANSMISSION; JACK ROUSH CHASSIS, FORD V8 358 CI, STANDARD NASCAR CONSTRUCTION. 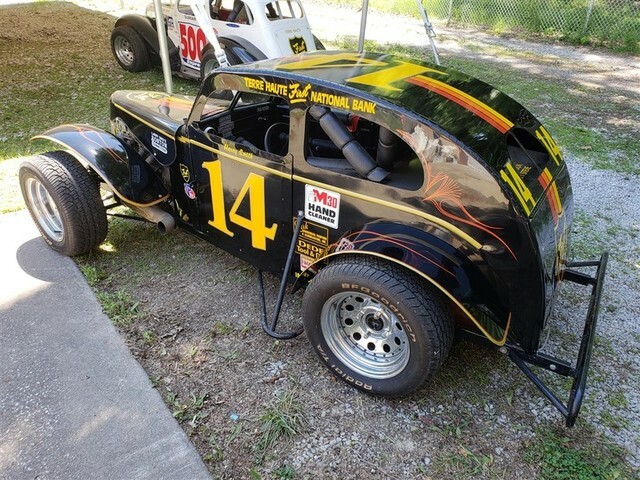 LEGENDS CAR, #48 RED AND YELLOW; DRIVEN BY JEFF SMITH; BUILT BY HAROLD “HUMPY” WHEELER, FORMER CHARLOTTE MOTOR SPEEDWAY PRESIDENT; THE CARS RUN 1200 C.C. 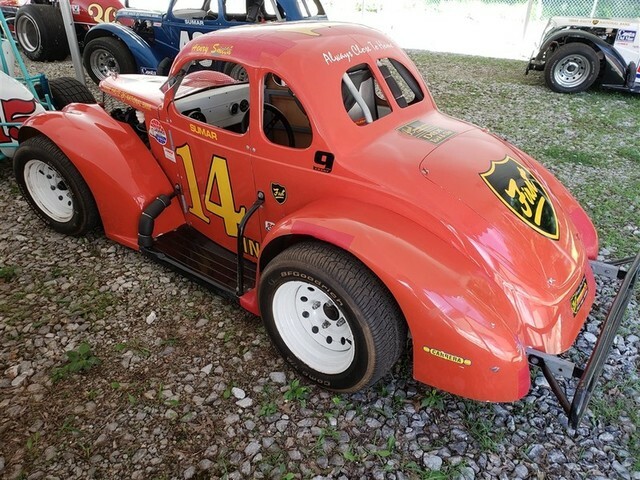 ENGINES; THESE CARS RACE ON DIRT OR ASPHALT TRACKS 1/10 TO 1/4 MILES; COUPE BODY; YAMAHA 4 CYL. 1200 C.C. 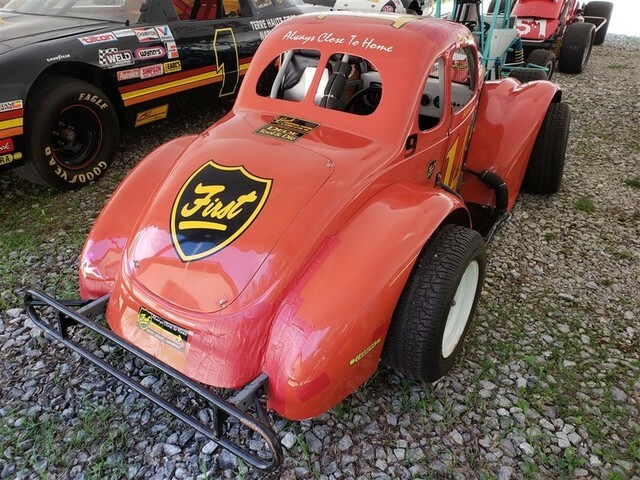 ; HAS TERRE HAUTE FIRST FINANCIAL AND LARRY BIRD’S BOSTON CONNECTION ON IT; AS IT WAS LAST TIME IT RACED; VW SUSPENSION, FRONT AND REAR SQUARE TUBE FRAME; ROLL CAGE SCALED DOWN FROM A NASCAR STOCK CAR. 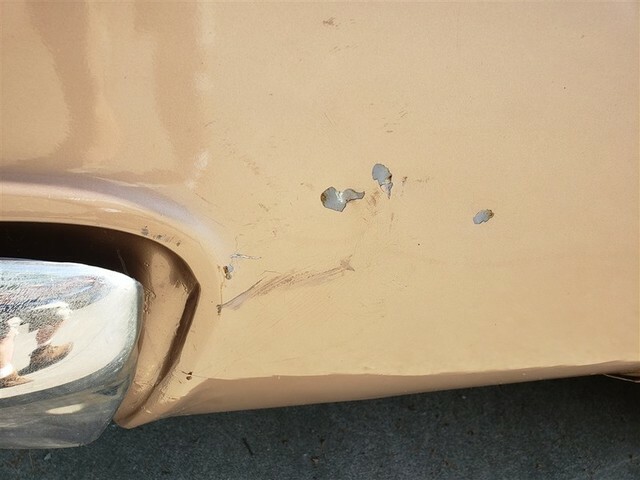 ONLY THE FIRST 60 LEGEND CARS HAD METAL BODIES. THE REST ARE FIBERGLASS. THIS IS A METAL BODY. 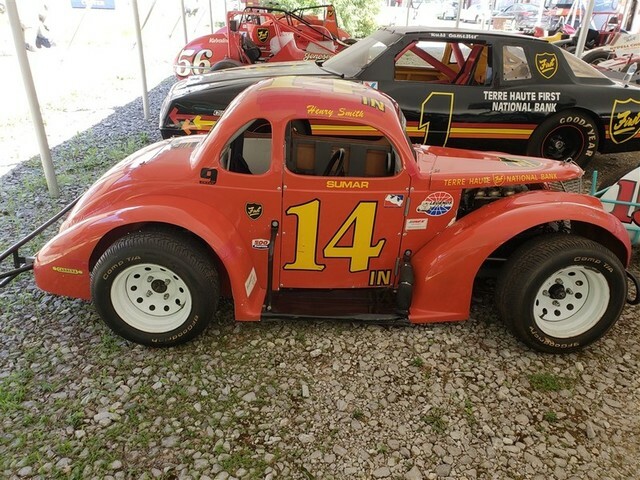 LEGENDS CAR, #14 RED AND YELLOW; DRIVEN BY HENRY SMITH; BUILT BY HAROLD “HUMPY” WHEELER, FORMER CHARLOTTE MOTOR SPEEDWAY PRESIDENT; THE CARS RUN 1200 C.C. 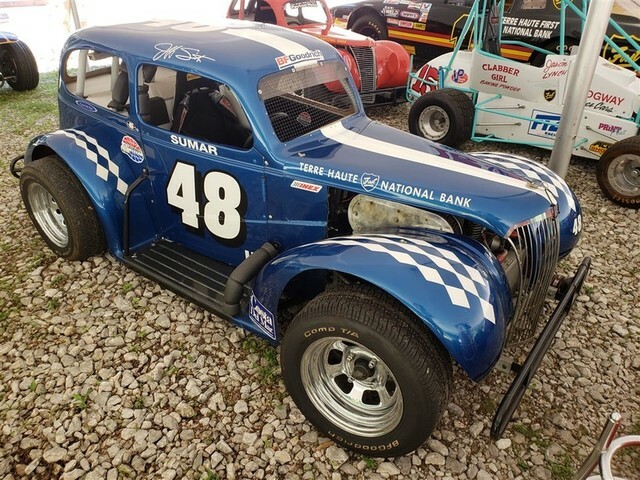 ENGINES; THESE CARS RACE ON DIRT OR ASPHALT TRACKS 1/10 TO 1/4 MILES; COUPE B, YAMAHA 4 CYL. 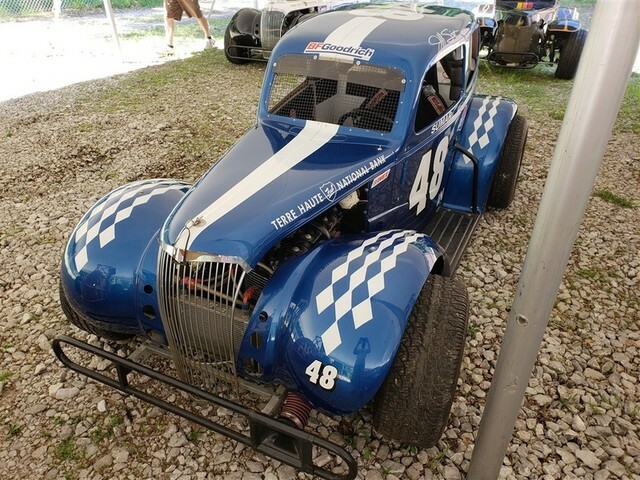 1200 CC, AS IT WAS LAST TIME IT RACED; VW SUSPENSION, FRONT AND REAR SQUARE TUBE FRAME; ROLL CAGE SCALED DOWN FROM A NASCAR STOCK CAR. 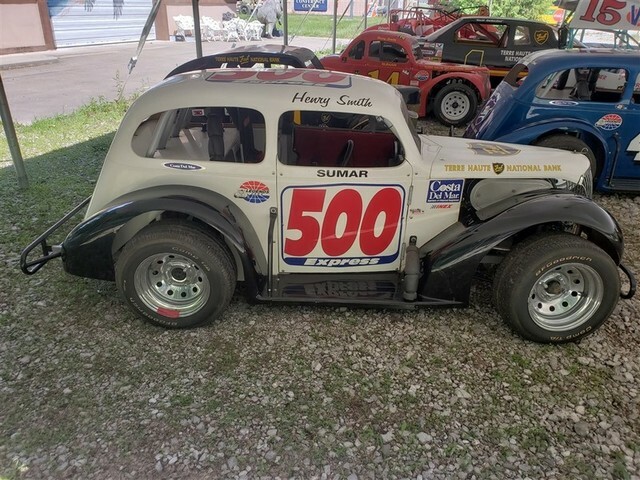 LEGENDS CAR, #500 SUMAR. 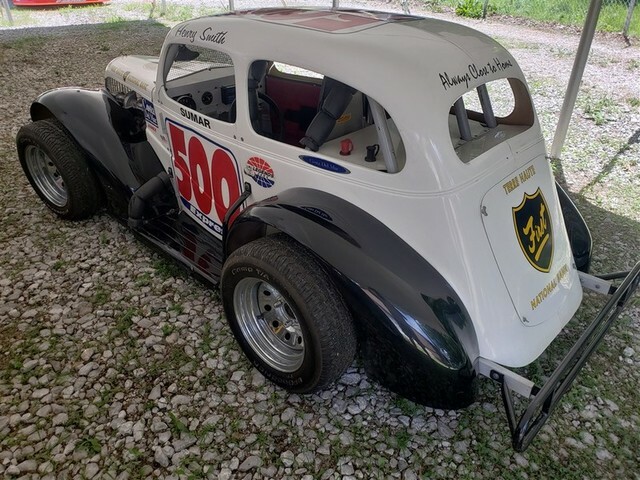 RED WHITE AND BLUE PLATOLINE; DRIVEN BY HENRY SMITH; BUILT BY HAROLD “HUMPY” WHEELER FORMER CHARLOTTE MOTOR SPEEDWAY PRESIDENT; THE CARS RUN 1200 C.C. 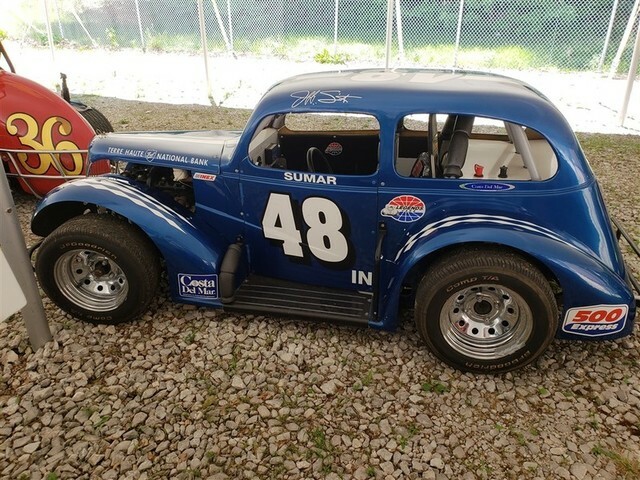 ENGINES; THESE CARS RACE ON DIRT OR ASPHALT TRACKS 1/10 TO 1/4 MILES; COUPE B, YAMAHA 4 CYL. 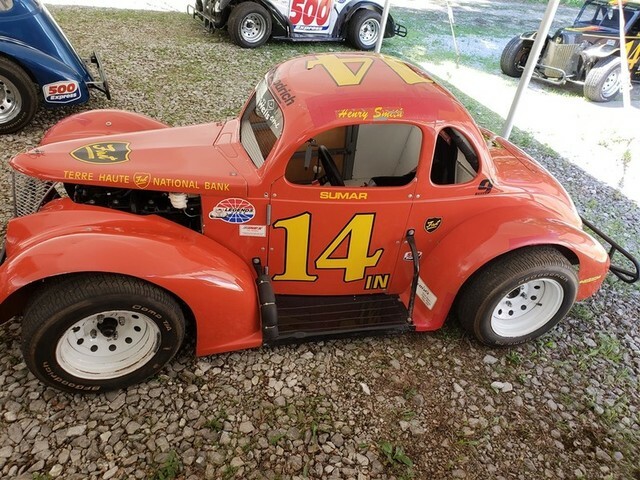 1200 CC; AS IT WAS LAST TIME IT RACED; VW SUSPENSION, FRONT AND REAR SQUARE TUBE FRAME; ROLL CAGE SCALED DOWN FROM A NASCAR STOCK CAR. 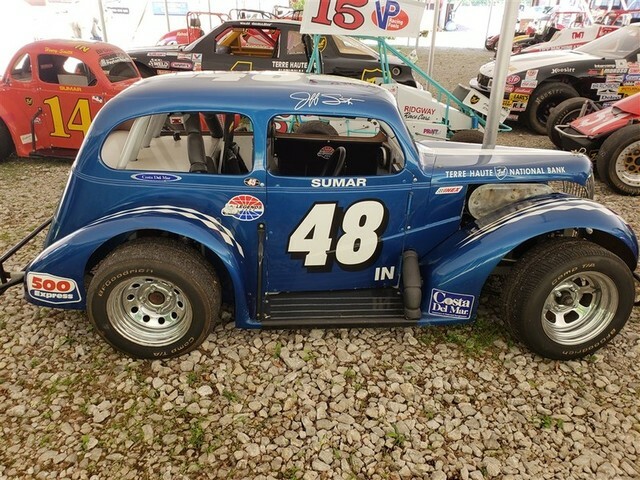 LEGENDS CAR, #48 BLUE AND WHITE SUMAR; DRIVEN BY JEFF SMITH; BUILT BY HAROLD “HUMPY” WHEELER FORMER CHARLOTTE MOTOR SPEEDWAY PRESIDENT; THE CARS RUN 1200 C.C. 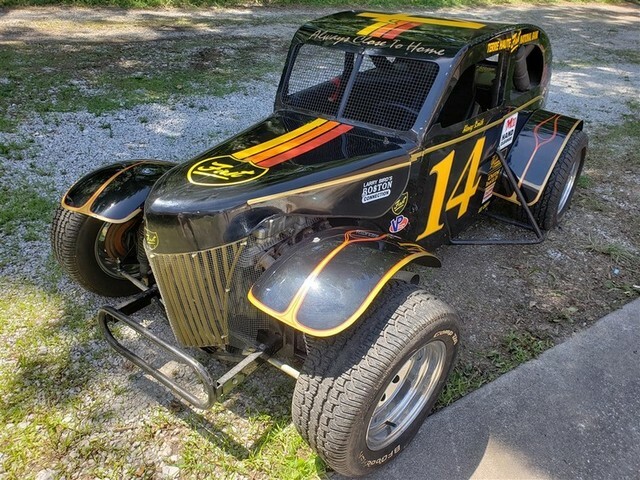 ENGINES; THESE CARS RACE ON DIRT OR ASPHALT TRACKS 1/10 TO 1/4 MILES; COUPE BODY; YAMAHA 4 CYL. 1200 C.C. 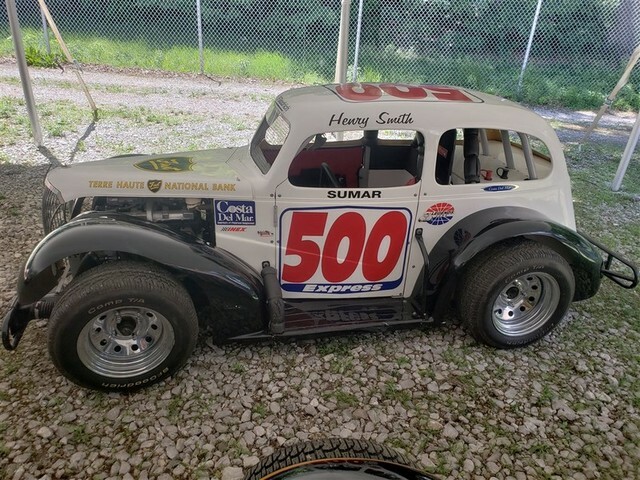 ; HAS TERRE HAUTE FIRST FINANCIAL AND LARRY BIRD’S BOSTON CONNECTION ON IT; AS IT WAS LAST TIME IT RACED; VW SUSPENSION, FRONT AND REAR SQUARE TUBE FRAME; ROLL CAGE SCALED DOWN FROM A NASCAR STOCK CAR. 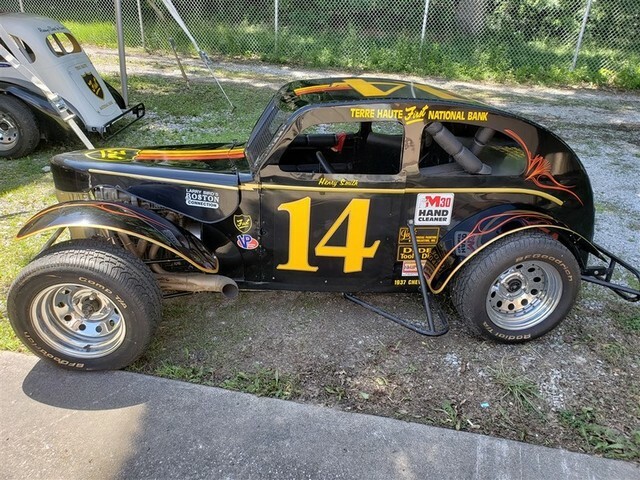 LEGENDS CAR, #14 BLACK. 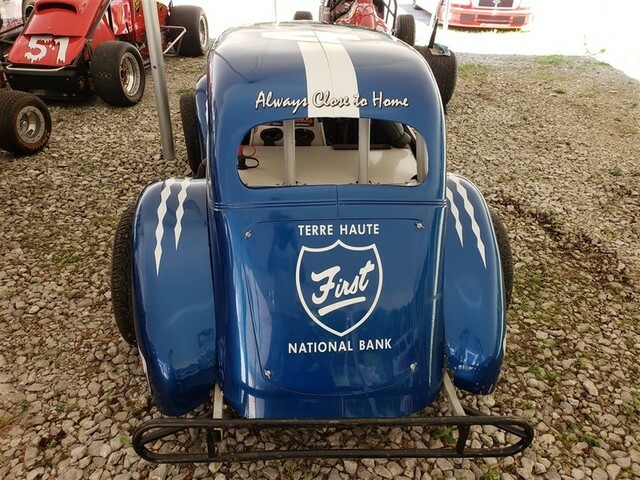 TERRE HAUTE FIRST NATIONAL COLORS; DRIVEN BY HENRY SMITH; BUILT BY HAROLD “HUMPY” WHEELER, FORMER CHARLOTTE MOTOR SPEEDWAY PRESIDENT. THE CAR MAKER IS THE CARS RUN 1200 C.C. 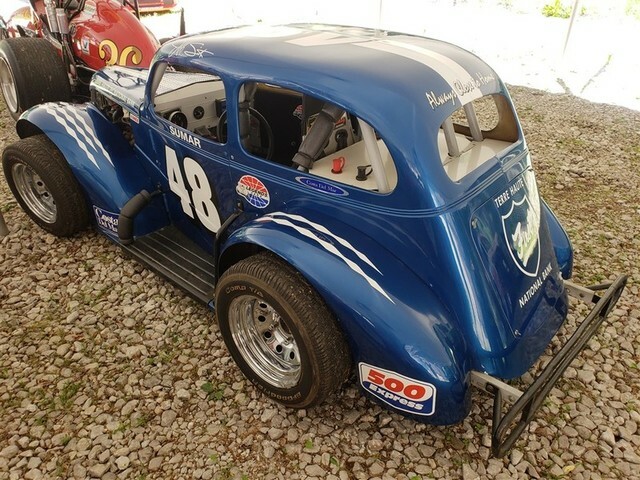 ENGINES; THESE CARS RACE ON DIRT OR ASPHALT TRACKS 1/10 TO 1/4 MILES; COUPE B, YAMAHA 4 CYL. 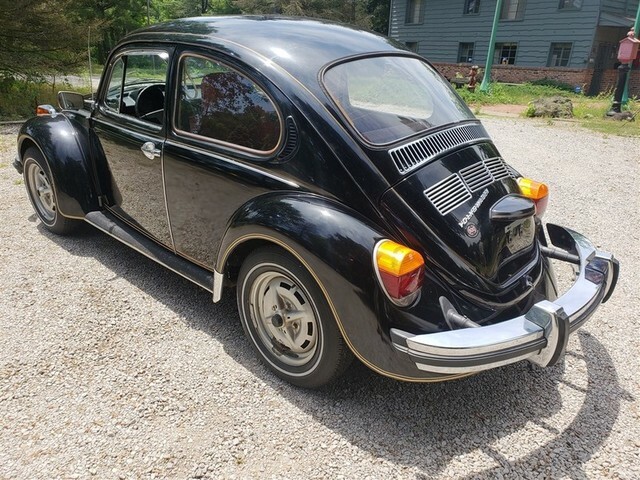 1200 CC; AS IT WAS LAST TIME IT RACED; VW SUSPENSION, FRONT AND REAR SQUARE TUBE FRAME; ROLL CAGE SCALED DOWN FROM A NASCAR STOCK CAR. 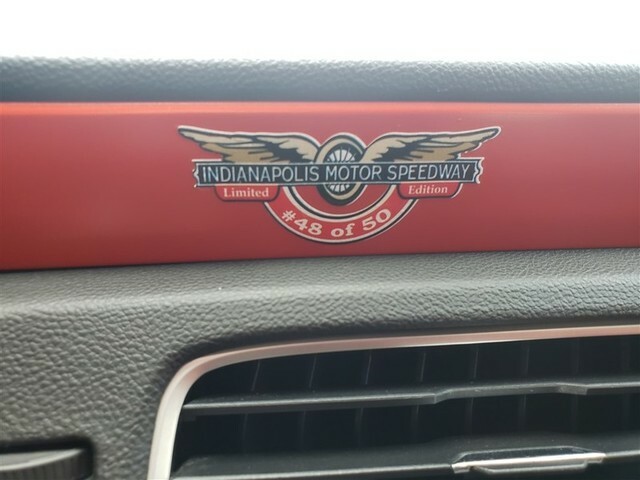 ONLY THE FIRST 60 LEGEND CARS HAD METAL BODIES. THE REST ARE FIBERGLASS. THIS IS A METAL BODY. THUNDER ROADSTER, #1 RED, WHITE AND BLUE; OWNED BY TONY GEORGE; BUILT BY HAROLD “HUMPY” WHEELER; THIS IS ANOTHER BRAIN CHILD OF WHEELER. 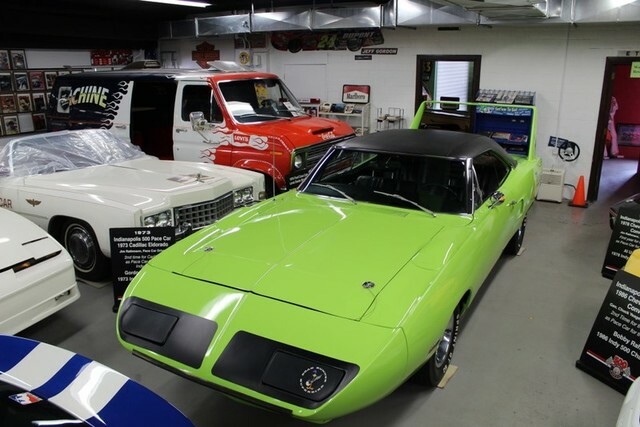 ALL OF THE SUSPENSION COMPONENTS ARE LIKE ONES USED IN THE LEGEND CARS OR DWARF RACE CARS. THE ENGINE RUNNING GEARS ARE LIKE THE LEGENDS VW. IT HAS A TUBE FRAME CHASSIS AND AN A.J. WATSON LOOKING FIBERGLASS BODY. THESE CARS ARE REALLY FAST, BUT STILL HAVE NOT CAUGHT ON NEARLY AS BIG AS THE LEGEND CARS DID. 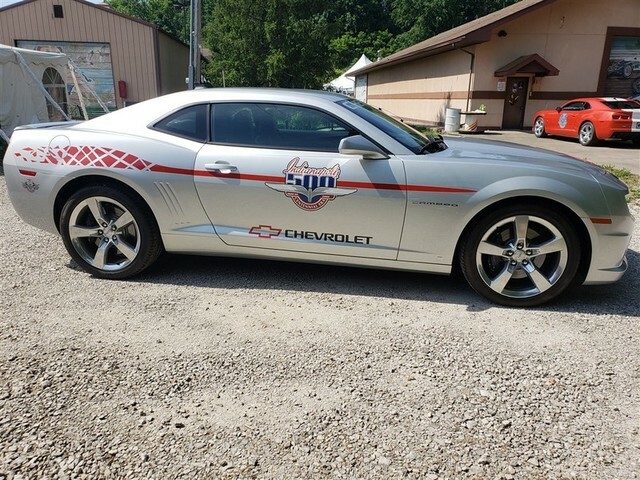 THE CARS RACED EVERY WEEKEND IN THE SUMMER IN ANDERSON, IN. 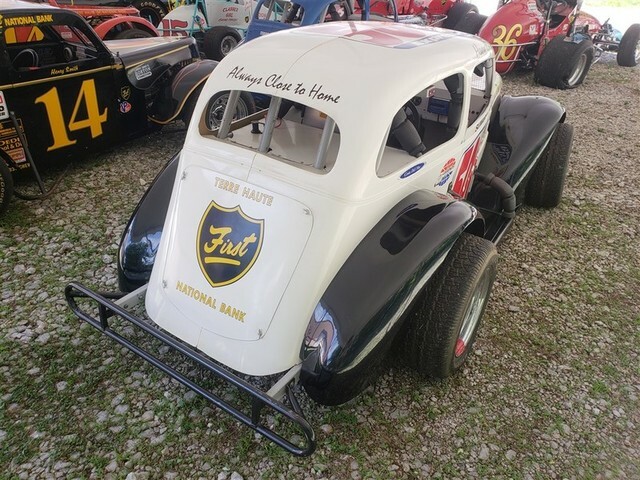 AL UNSER, SR. AND PARNELLI JONES RAN TWO OF THESE AROUND THE INDIANA STATE FAIR MILE IN 2002 TO SHOW THEM OFF; HONDA OR KAWASAKI 4 CYL 1200 CC, CHROME MOLLY 4130 SPACE FRAME, VW RUNNING GEAR, FIBERGLASS BODY. VIN 11134571, COLOR BLACK. ROUGH RESTORATION, NEEDS PAINT. 21” WOODEN WHEELS, CONDITION 3. THE TRUCK IS TITLED AS A 1927. HOWEVER, WE BELIEVE IT MAY BE A 1925. BUYER SHOULD INVESTIGATE BEFORE PURCHASING THIS TRUCK. 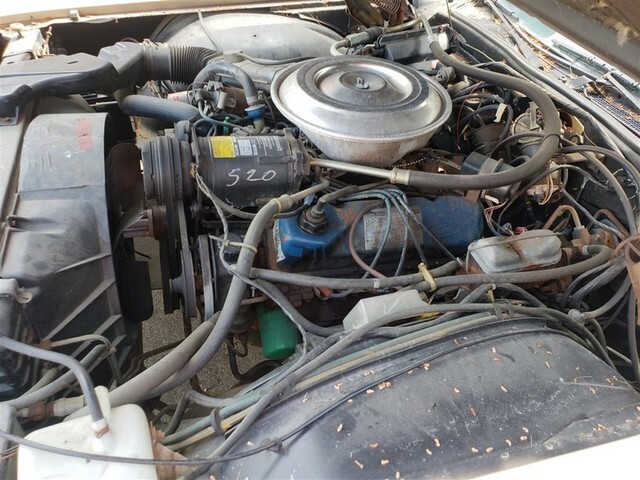 VIN# A3197823, COLOR GREEN/TAN TOP. GREAT RESTORATION ON THIS ROADSTER. ALL LOOKS CORRECT. ADDED A FLOAT A MOTOR, FOR BETTER RIDE. NICE WHITEWALL TIRES. 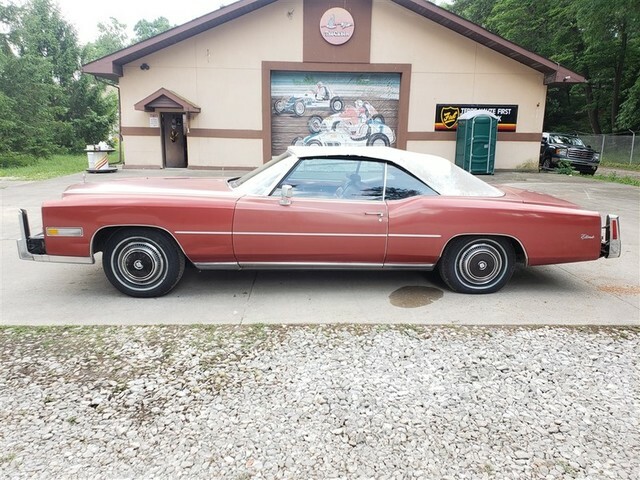 VIN 1025113, COLOR IS RED/TAN, MODEL 43, 134” WHEELBASE. GOOD RESTORATION. 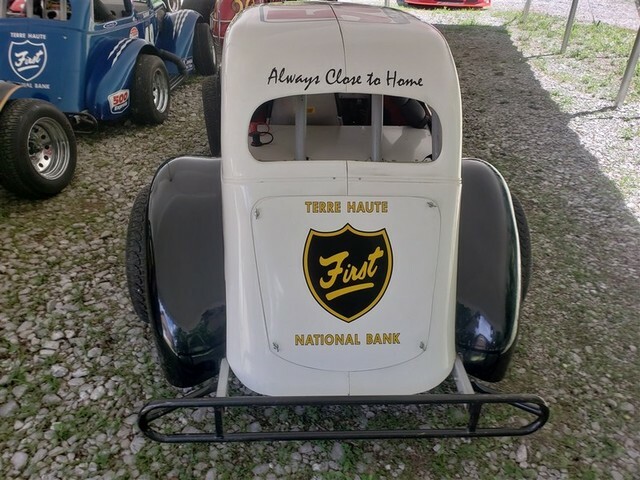 THIS BEAUTIFUL STREET ROD WAS BUILT BY CHARLES “CHUCK” BOWEN OF WEST TERRE HAUTE, INDIANA. IT TOOK 15 YEARS TO COMPLETE THIS GREAT RESTORATION. IT WON THE FAT FENDERED AWARD AT GOOD GUYS IN 2008, AND WAS FEATURED IN STREET ROD MAGAZINE IN 2007. 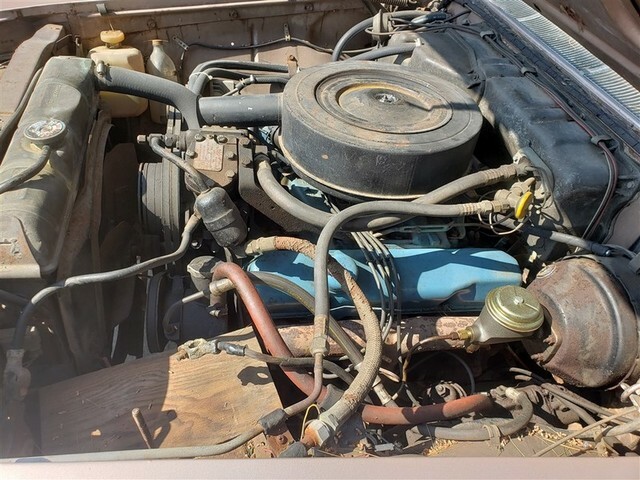 IT FEATURES A 1978 454 CHEVY ENGINE BORED .030”, A TURBO 400 CIRCLE TRACK TRANSMISSION, CHEVY 10-BOLT POSI-TRACTION REAR END, AIR RIDE SUSPENSION, VINTAGE A/C, AND FAT MAN FABRICATORS FRONT STUB. 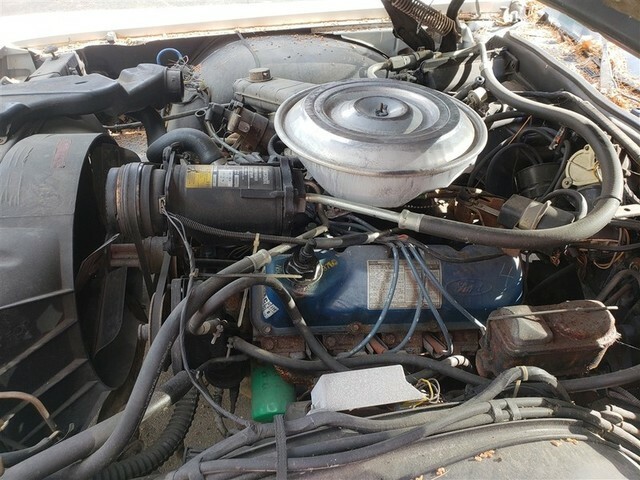 ALUMINUM RADIATOR, CORVETTE WATER PUMP (ELIMINATED NEED FOR IDLER ON SERPENTINE BELT), AND MUCH MORE! VIN 61F017839, 10,745 MILES. 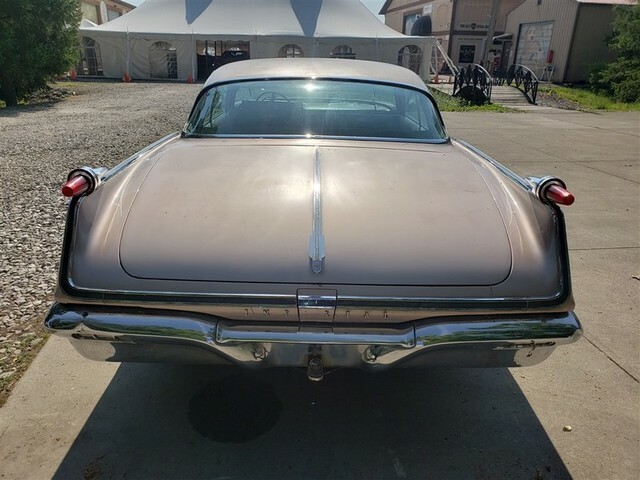 THE 1961 CADILLACS FEATURED A NEW LOOK AND A RE-ENGINEERED CHASSIS. 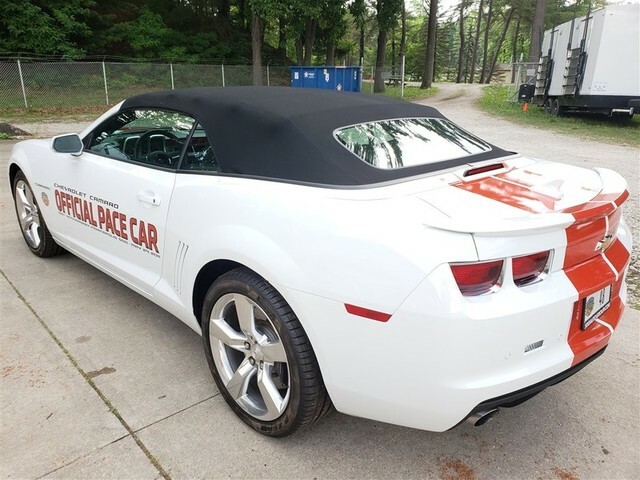 BASE FACTORY PRICE FOR THE CONVERTIBLE WAS $5,455.00. TOTAL PRODUCTION OF CONVERTIBLES WAS 15,500. 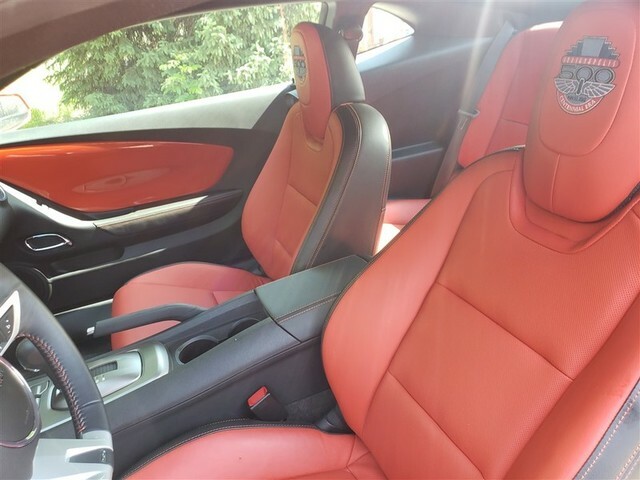 FITTED WITH WHITE CONVERTIBLE TOP AND RED LEATHER INTERIOR. 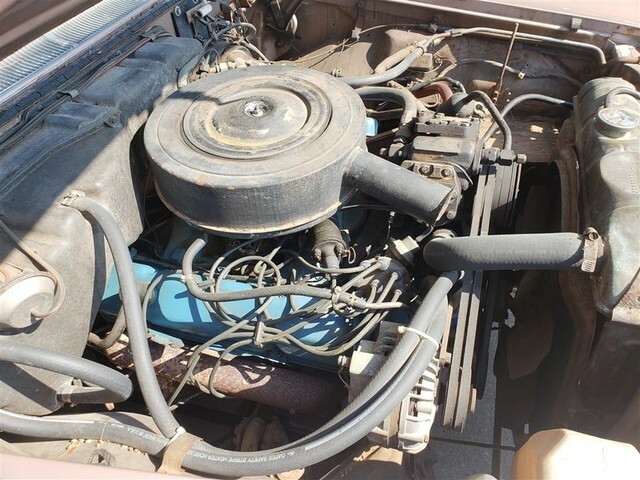 THE ENGINE WAS A CADILLAC V8 THAT DISPLACED 390 CUBIC INCHES AND DEVELOP 325 HORSEPOWER. 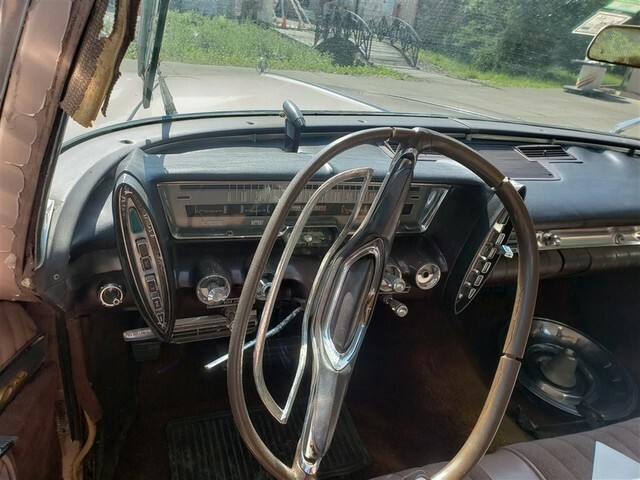 NUMEROUS ACCESSORIES WERE AVAILABLE, INCLUDING FACTORY AIR, POWER STEERING, POWER BRAKES, POWER WINDOWS, AND FENDER SKIRTS. VIN# 8J4011537, COLOR IS WHITE. 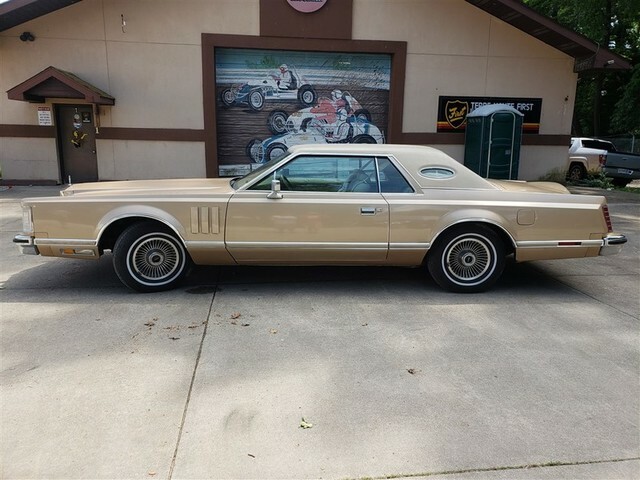 V8, AUTO TRANS, 49,089 MILES, LEATHER, POWER WINDOWS. VIN# 839369, COLOR IS RED. 231 C.I. 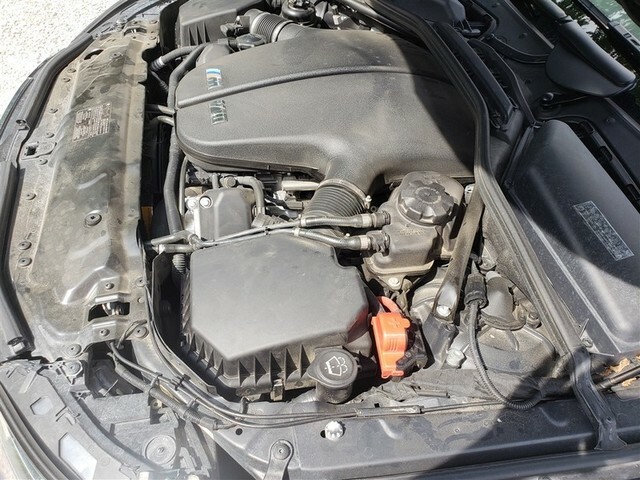 6-CYLINDER ENGINE, ADVERTISED 266 HP. 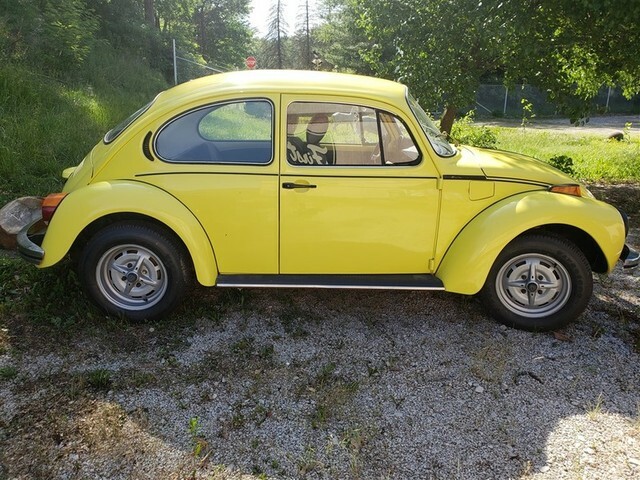 MANUAL TRANS, READS 4 MILES, NEWER LEATHER SEATS, AC/HEAT. VIN# 107376W121410, COLOR IS RED. 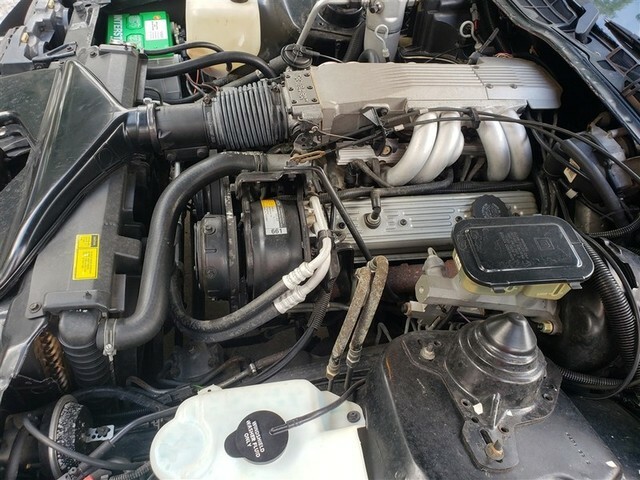 2.7L FLAT 6, 4 SPEED MANUAL TRANS, READS 45,593 MILES. VIN# 6Y872158048, 15,765 MILES. COLOR BLACK WITH GOLD INTERIOR. 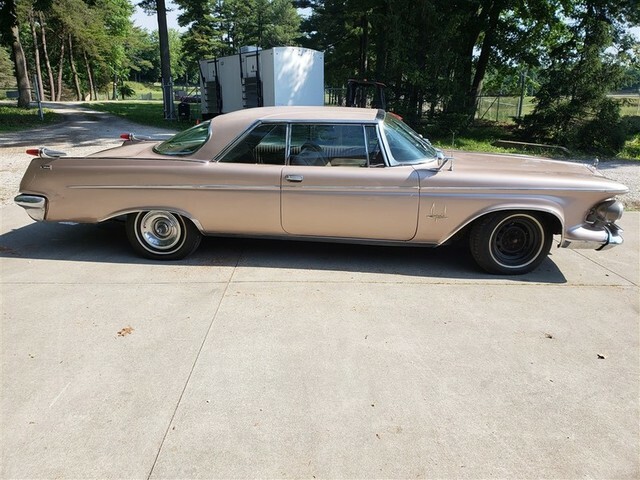 ALTHOUGH THE 1966 THUNDERBIRD USED THE PREVIOUS YEAR’S BODY SHELL, IT LOOKED QUITE DIFFERENT. 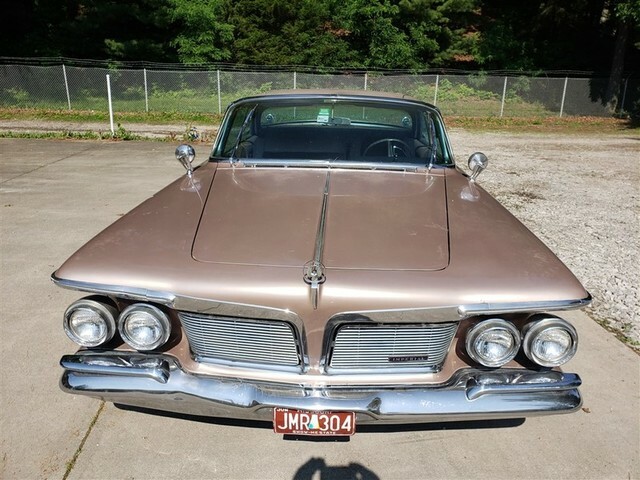 FOUR BODY STYLES WERE AVAILABLE WITHIN THE THUNDERBIRD LINE: HARDTOP COUPE, HARDTOP TOWN SEDAN, LANDAU COUPE, AND CONVERTIBLE. THE LANDAU COUPE WAS THE BESTSELLER FOR 1966, WITH A TOTAL OF 35,105. 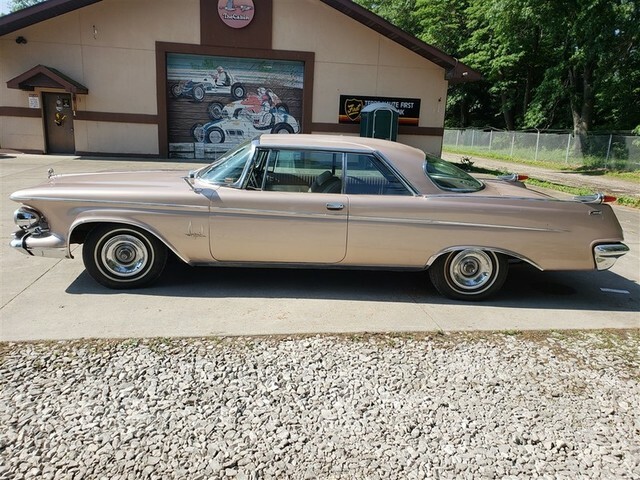 TOTAL THUNDERBIRD SALES FOR 1966 OF ALL STYLES WERE 69,176. 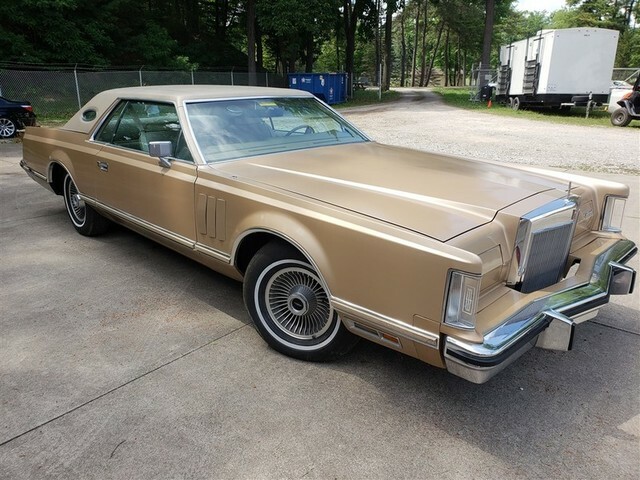 V8, AUTO TRANS, POWER WINDOWS, LOCKS, MIRRORS, LEATHER, WOOD GRAIN. 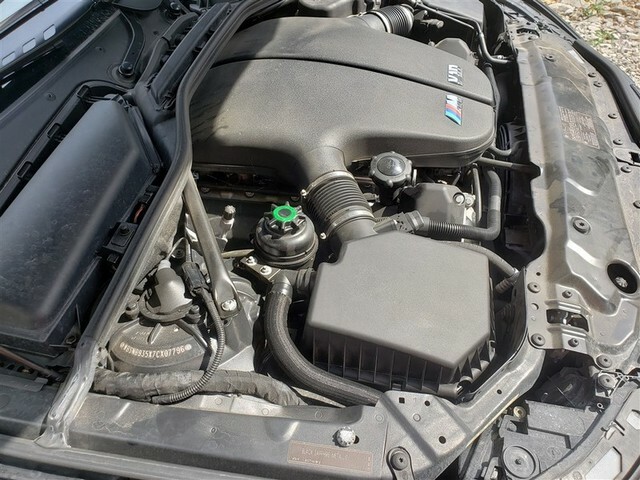 VIN# F8117956, 68-68367FWD127942, 53,289 MILES. COLOR CREAM WITH BROWN INTERIOR. 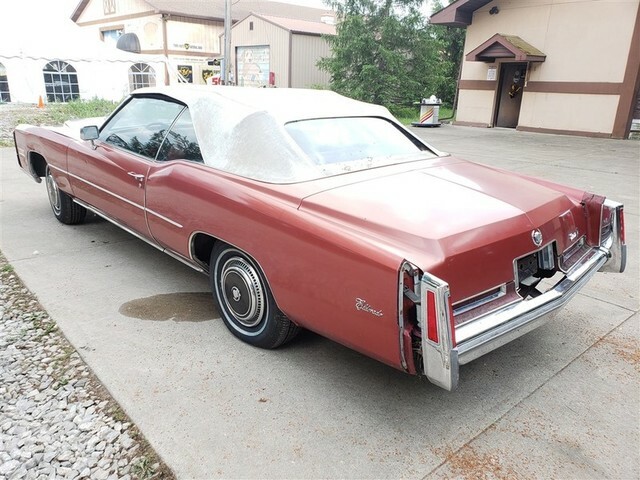 FOR 1968, CADILLAC OFFERED FOUR MODELS IN THE DEVILLE SERIES, INCLUDING THE CONVERTIBLE, WHICH SOLD FOR A BASE PRICE OF $5736.00. A TOTAL OF 16,025 WERE BUILT. 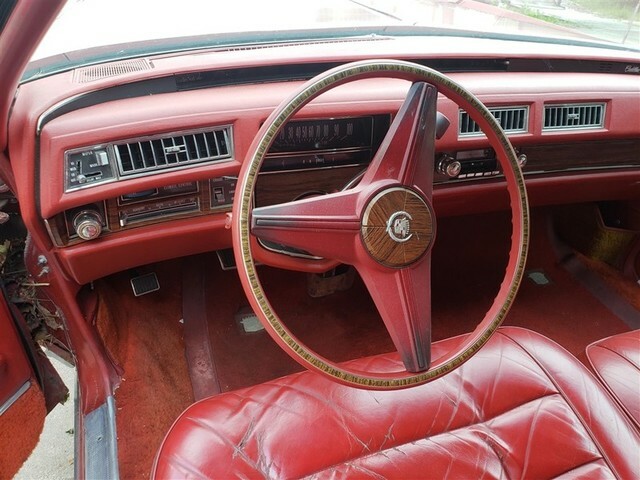 THE DEVILLE OFFERED RICHER APPOINTMENTS INTERIOR AND OUT FOR 1968. 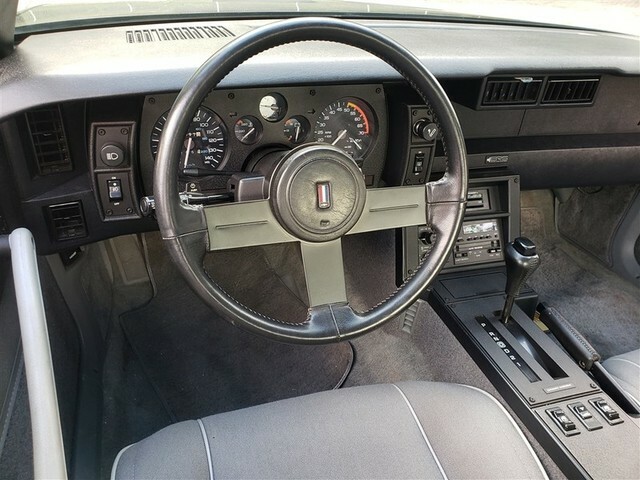 CADILLAC ALSO FEATURED A NEW DASHBOARD DESIGN. 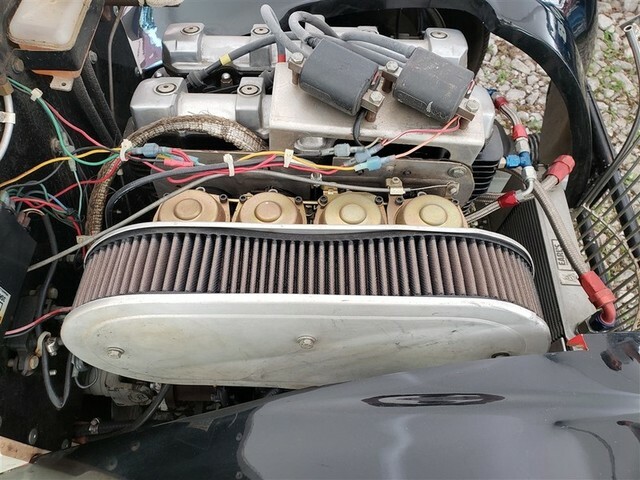 POWER CAME FROM A 472 C.I., OHV CADILLAC V-8, WHICH DEVELOPED 375 HP. 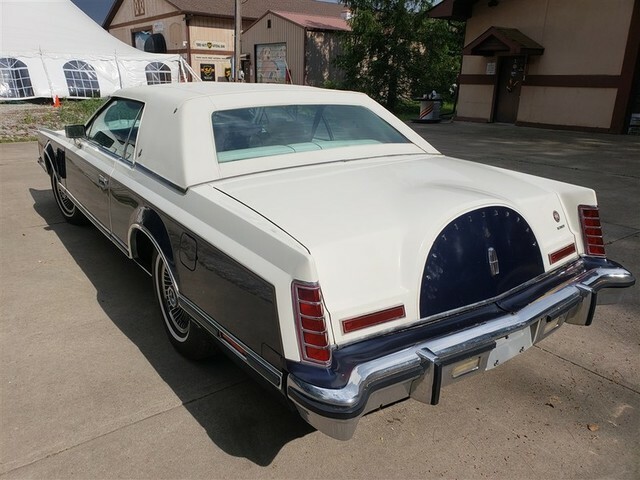 CREAM EXTERIOR WITH A BLACK CONVERTIBLE TOP. 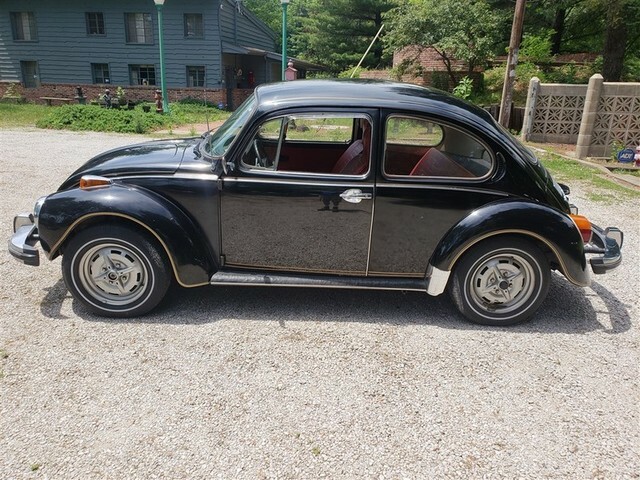 LEATHER, POWER WINDOWS, LOCKS, MIRRORS. 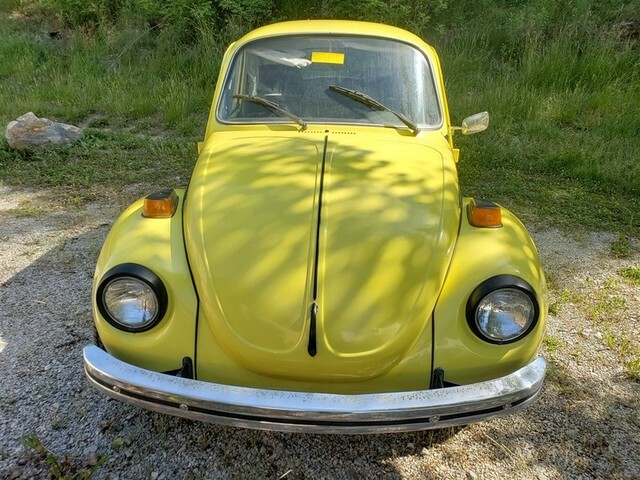 VIN #124379N704328, COLOR YELLOW WITH BLACK ACCENTS. 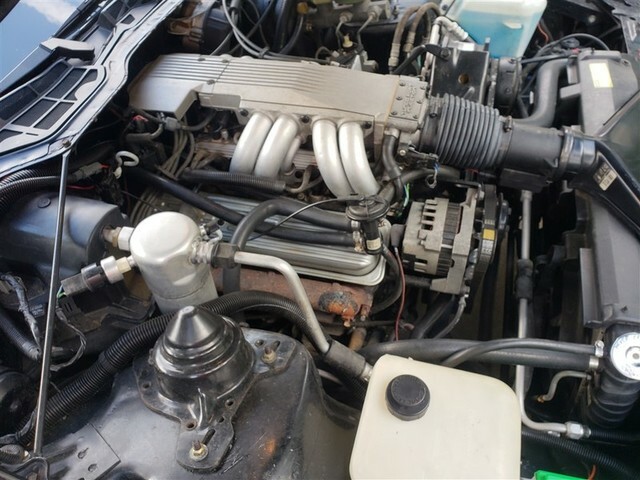 V8 350, MANUAL TRANS, READS 67,408 MILES, YELLOW & BLACK INTERIOR, FUEL CELL LOCATED IN TRUNK. VIN# 9Y89A562446, 87,100 MILES. COLOR BLACK WITH GOLD INTERIOR. BODY STYLE COUPE HT. 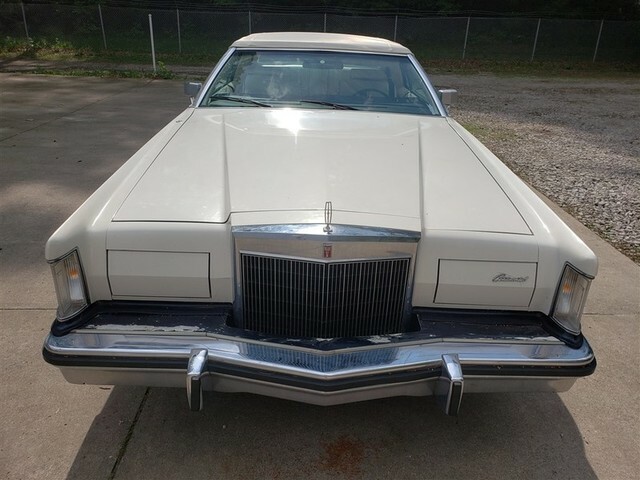 THE CONTINENTAL MARK III WAS ALL NEW FOR 1969. 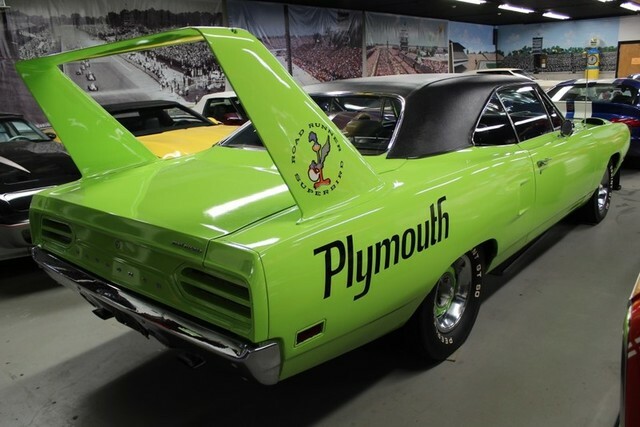 PRODUCTION BEGAN IN APRIL, 1968, AND CONTINUED UNTIL THE 1970 VERSION WAS INTRODUCED IN THE FALL OF 1969. 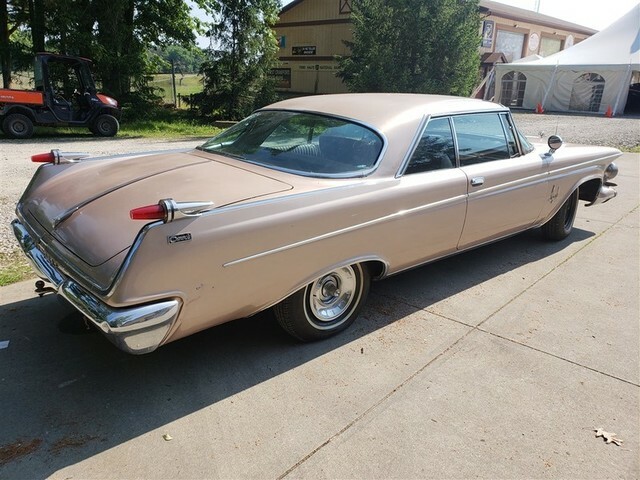 THE MARK III THREE WAS REMINISCENT OF THE MARK II THAT WAS BUILT IN THE MID FIFTIES. 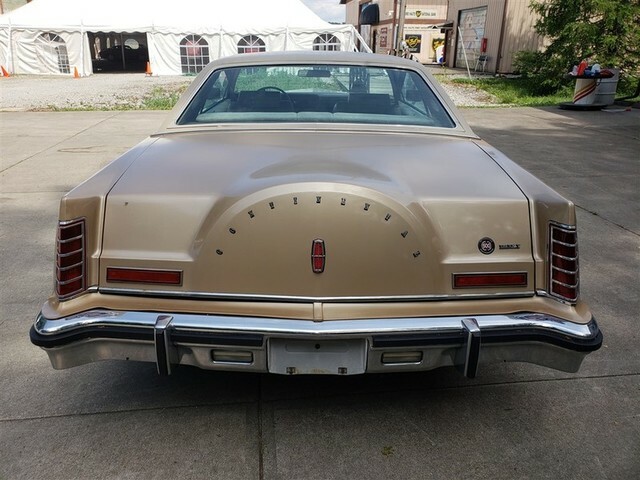 THE MAJORITY OF MARK III’S HAD VINYL ROOFS, AND NEARLY ALL HAD AIR CONDITIONING. 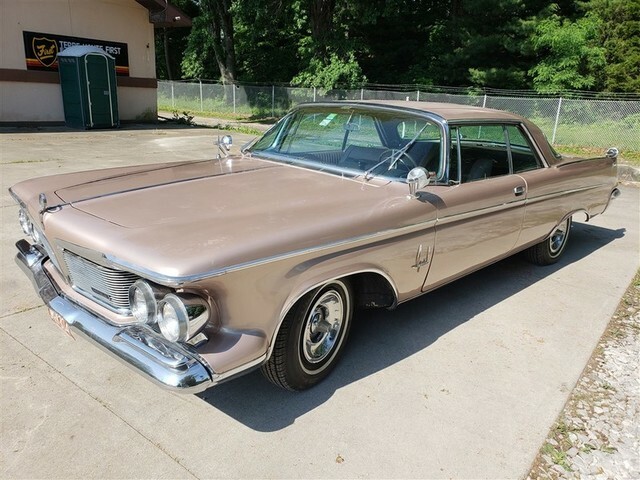 THE MARK III ENGINE WAS A 460 CUBIC INCH V-8 THAT DEVELOPS 365 HORSEPOWER. FACTORY PRICE WAS $6,741.00, WITHOUT OPTIONS, AND THERE WERE MANY. TOTAL PRODUCTION FOR 1969 WAS 30,858. 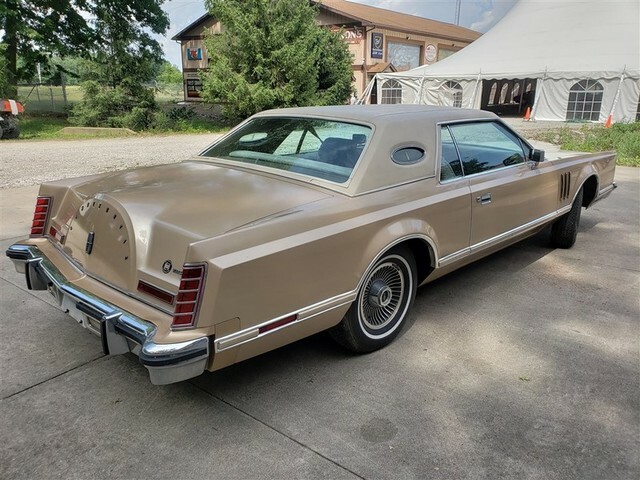 POWER WINDOWS, LOCKS, MIRRORS, LEATHER. VIN# 1R43522BW, COLOR IS WHITE. 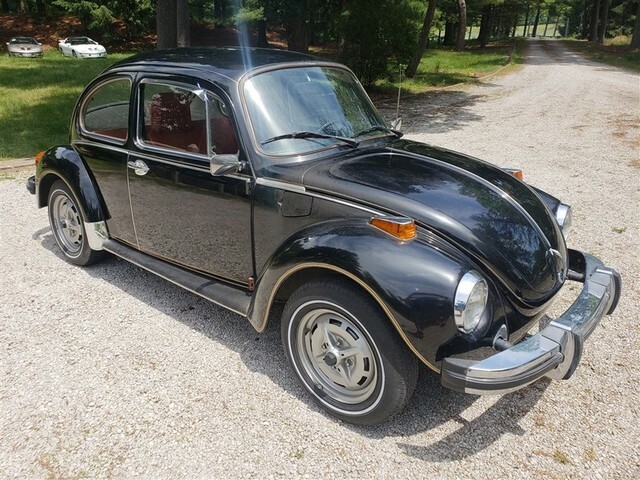 4.2L, AUTO, 23,783 MILES, AC/HEAT, LEATHER. 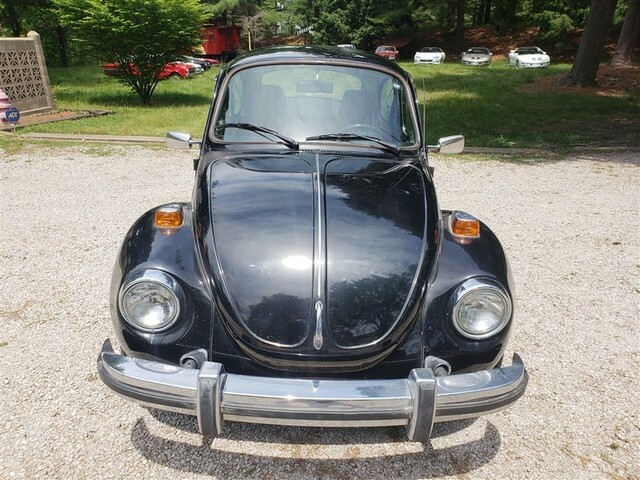 VIN# 6L6755Q196545, 48,588 MILES. 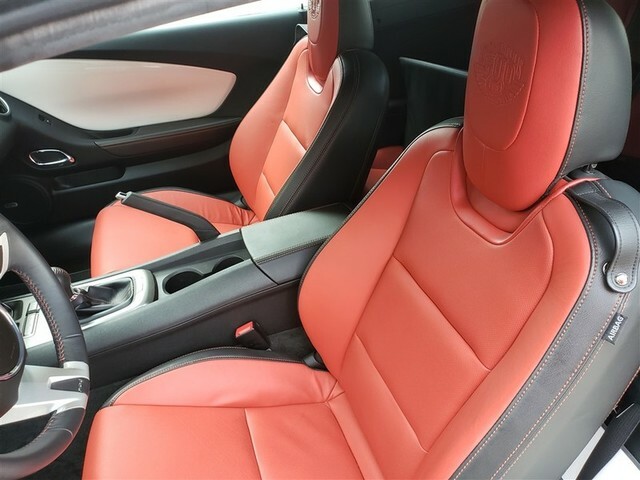 COLOR RED WITH WHITE TOP, WHITE INTERIOR. 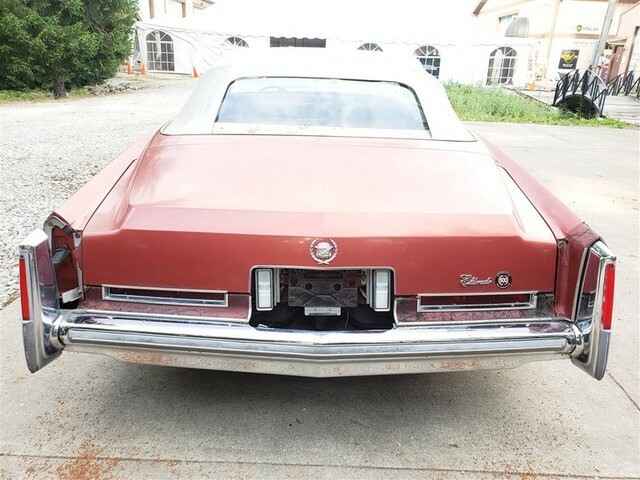 FOR 1975, THE CADILLAC ELDORADO UNDERWENT A FACELIFT, ALTHOUGH FRONT WHEEL DRIVE WAS RETAINED FOR ANOTHER YEAR. 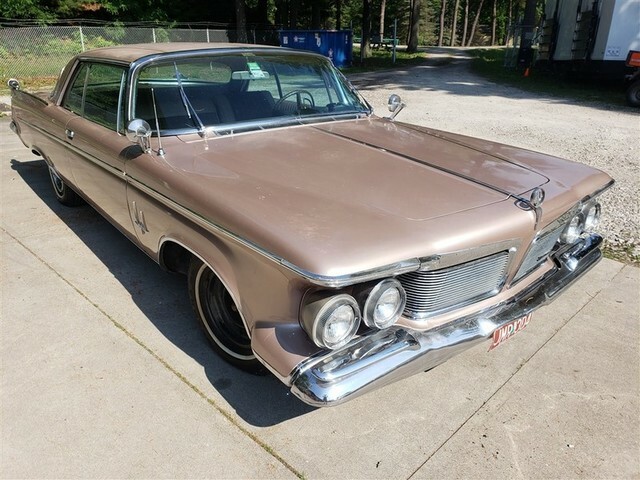 AMONG THE CHANGES WERE SQUARE HEADLIGHTS, ABSENCE OF FENDER SKIRTS, AND A NEW CROSSHATCH GRILL. POWERED BY CADILLAC’S OVERHEAD VALVE 500 CUBIC INCH ENGINE THAT PRODUCED 190 HORSEPOWER. LOADED WITH OPTIONS. FACTORY PRICE 10,000 $354. 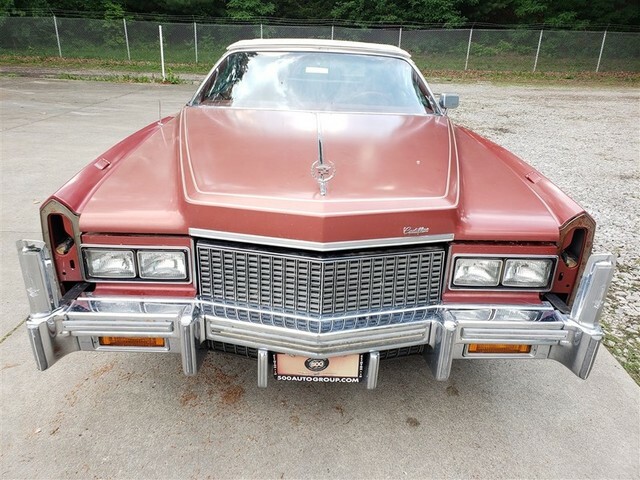 TOTAL PRODUCTION OF FLEETWOOD EL DORADO CONVERTIBLES IN 1975 WAS 8,950., LEATHER, POWER WINDOWS, LOCKS, MIRRORS. VIN# 5Y89A895461, 30,758 MILES. COLOR SILVER WITH SILVER INTERIOR. 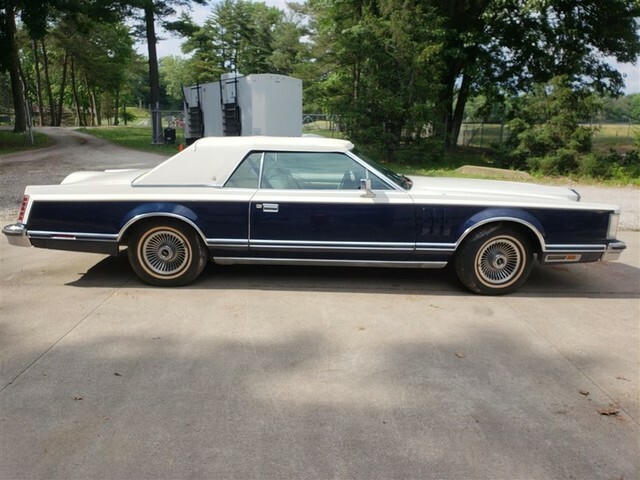 THE 1975 CONTINENTAL MARK IV WAS NEARLY IDENTICAL TO ITS 1974 COUNTERPART. 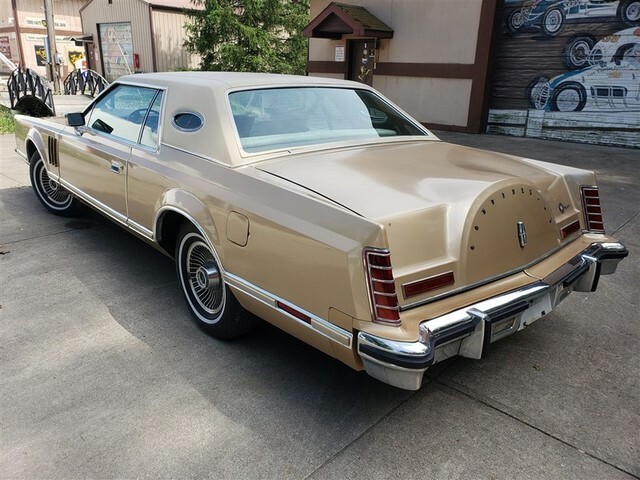 ONE CHANGE WAS THE VINYL ROOF OPTION, WHICH THIS CAR HAS. 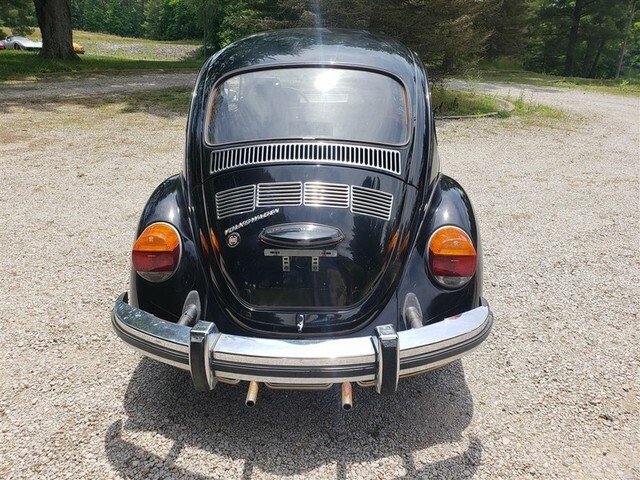 STANDARD FEATURES INCLUDED DISC BRAKES, SPEED CONTROL, WIPER MOUNTED WINDSHIELD WASHERS, AND SIX-WAY TWIN COMFORT POWER SEATS. 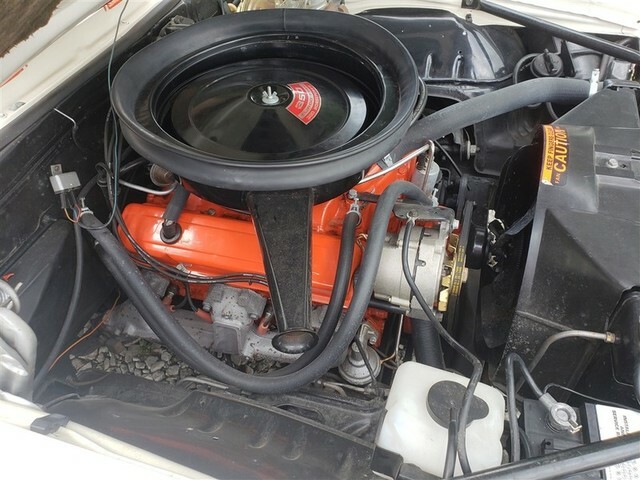 THE MARK IV ENGINE WAS AS 460 CUBIC INCH V8 THAT DEVELOPED 220 HORSEPOWER. FACTORY PRICE WAS $11,083 WITHOUT OPTIONS, AND THERE WERE MANY. TOTAL MARK IV PRODUCTION WAS 47,145. 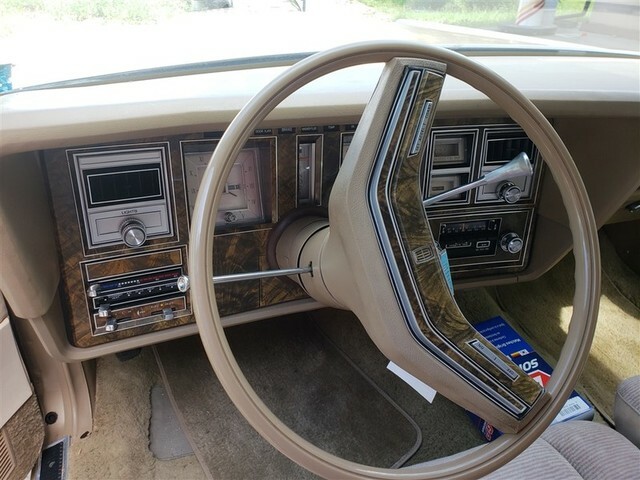 POWER WINDOWS, LOCKS, MIRRORS, WOOD GRAIN, LEATHER. 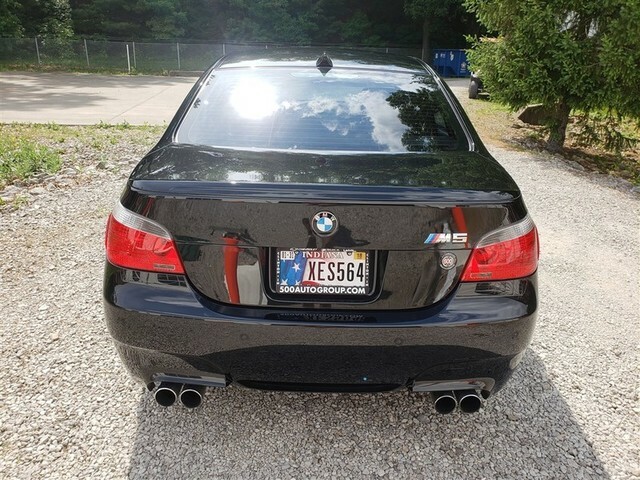 VIN# 5Y89AB74102, 34,758 MILES. 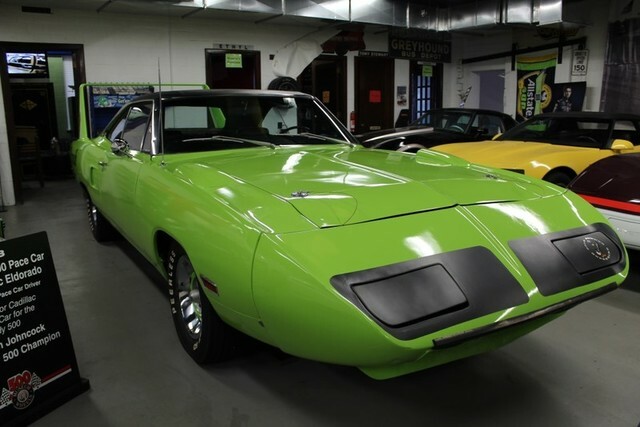 COLOR GREEN WITH GREEN INTERIOR. 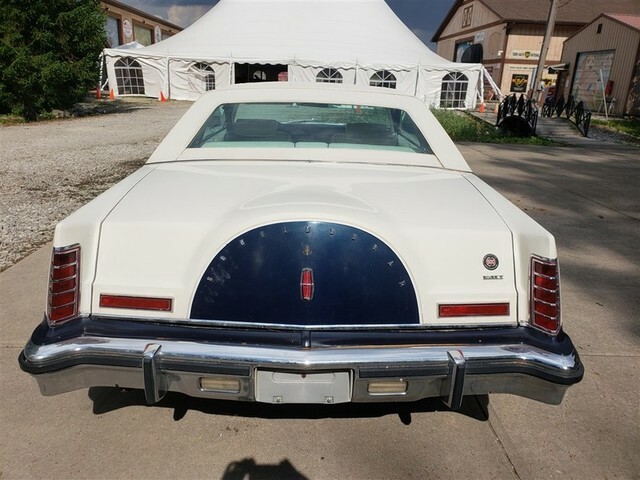 THE 1975 CONTINENTAL MARK IV WAS NEARLY IDENTICAL TO ITS 1974 COUNTERPART. 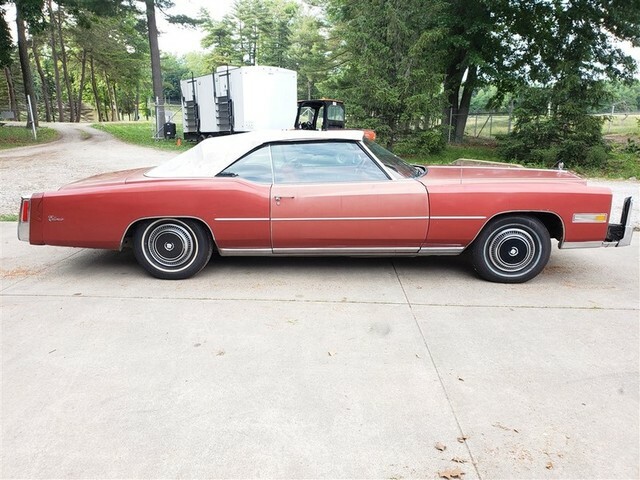 ONE CHANGE WAS THE VINYL ROOF OPTION, WHICH THIS CAR HAS. 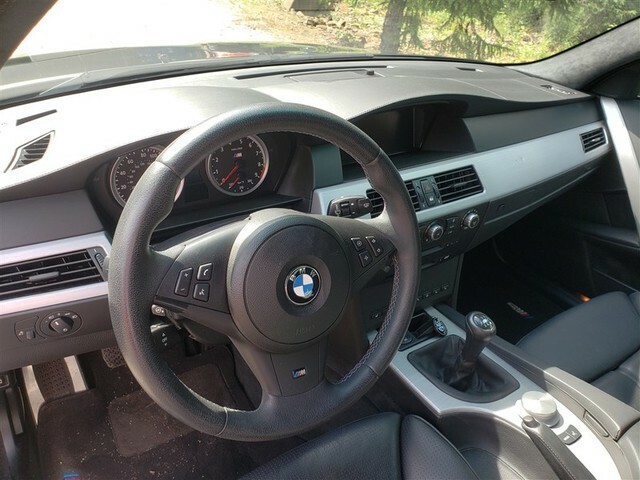 STANDARD FEATURES INCLUDE DISC BRAKES, SPEED CONTROL, WIPER MOUNTED WINDSHIELD WASHERS, AND SIX WAY COMFORT POWER SEATS. 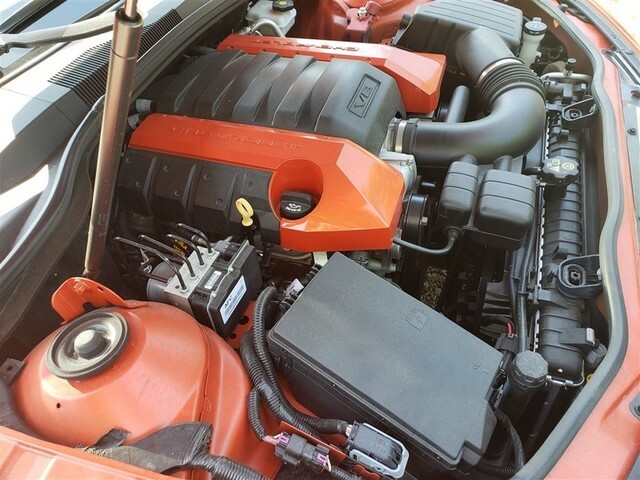 THE MARK IV ENGINE WAS A 460 CUBIC INCH V8 THAT DEVELOPS 220 HORSEPOWER. FACTORY PRICE WAS $11,083 WITHOUT OPTIONS, AND THERE WERE MANY. TOTAL MARK FOR PRODUCTION WAS 47,145. 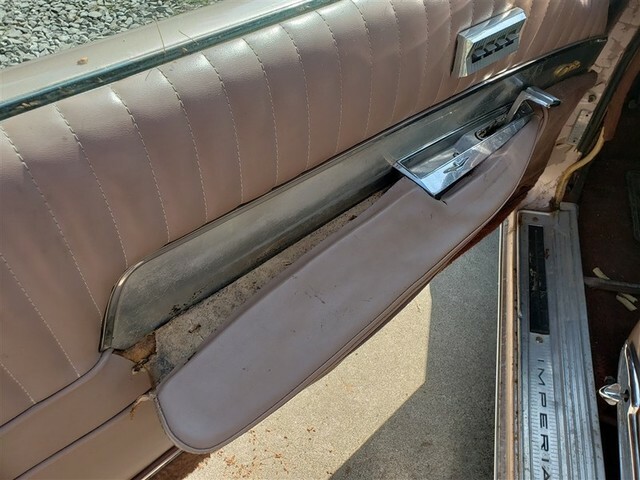 POWER WINDOWS, LOCKS, MIRRORS, LEATHER, WOOD GRAIN, POOR PAINT. VIN# 10704412028867, 50,068 MILES. 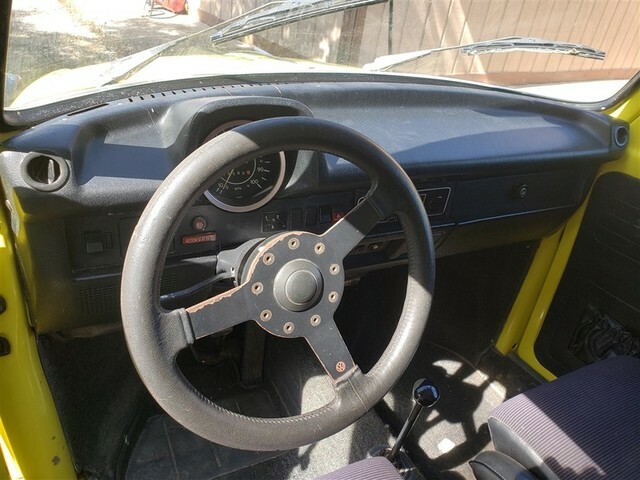 COLOR YELLOW WITH BLACK INTERIOR. PRODUCTION CONTINUED ON THE 450 SL SERIES WITH LITTLE CHANGE. 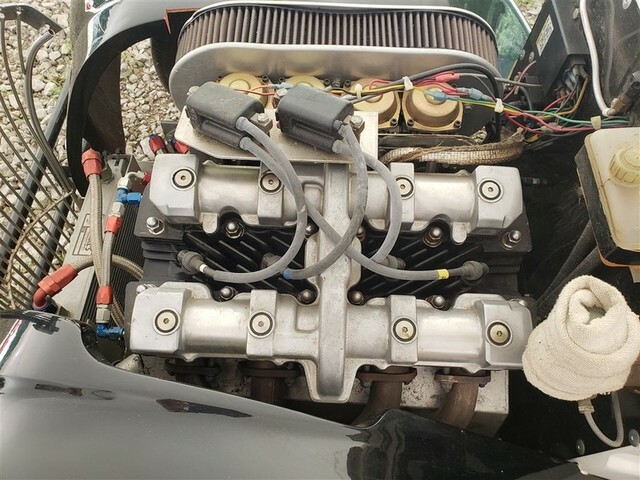 THE CAR WAS POWERED BY A MERCEDES BENZ OVERHEAD VALVE 275.8 CUBIC INCH V8 MOTOR THAT DEVELOPED 180 HORSEPOWER. 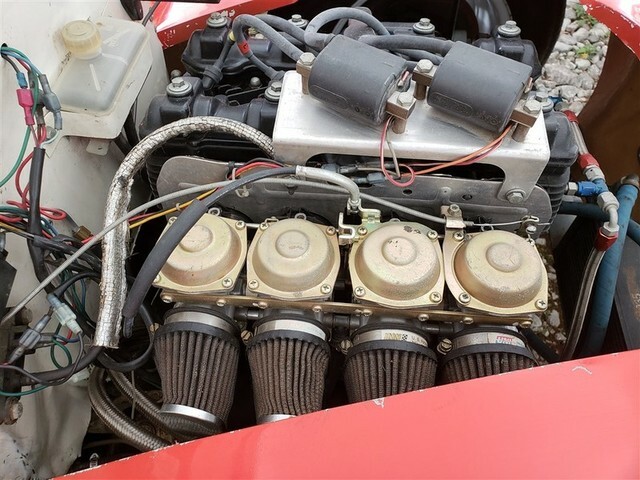 FOR 1976, THE MOTOR’S FUEL INJECTION SYSTEM WAS CHANGED TO A BOSCH K-JETRONIC. BASE PRICE OF THE 450 SL WAS $17,653. 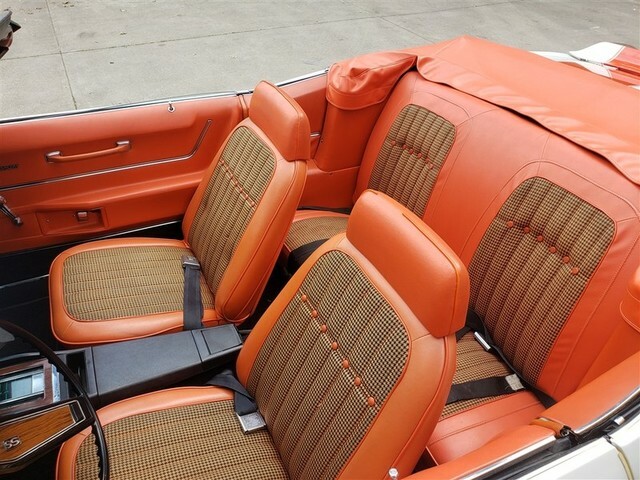 A TOTAL OF 66,298 450 SL MODELS WERE BUILT DURING THE MODEL RUN FOR 1971 TO 1980. 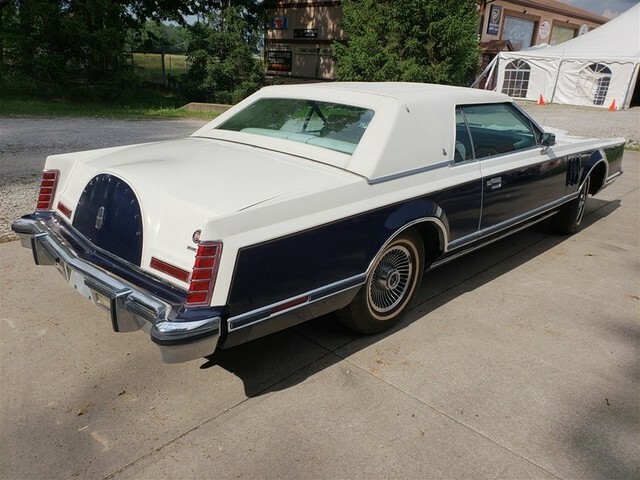 AUTO TRANS, LEATHER, BLAUPUNKT RADIO, POWER WINDOWS, LOCKS, CRUISE. VIN# 6L67S6Q251757, COLOR BLUE. 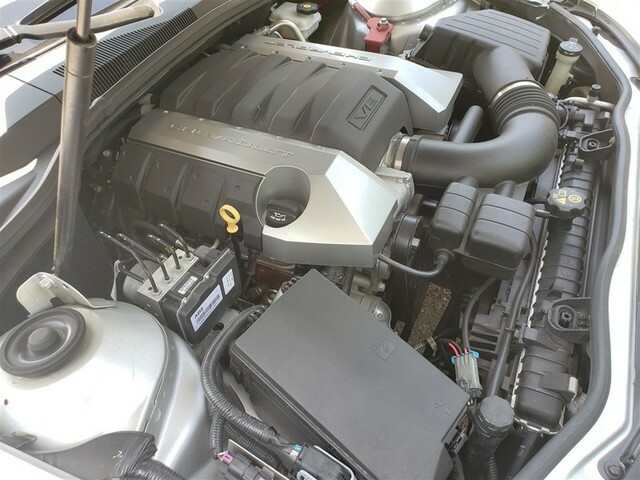 V8, AUTO TRANS, READS ????? 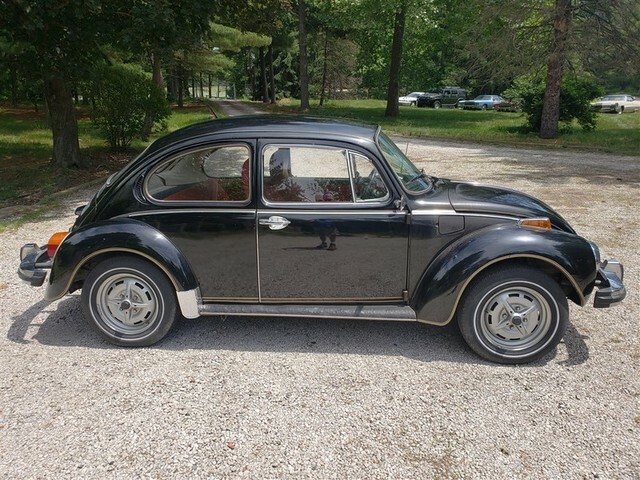 MILES POWER WINDOWS, LOCKS, MIRRORS, LEATHER. VIN# 6L67S6Q205707, COLOR RED. 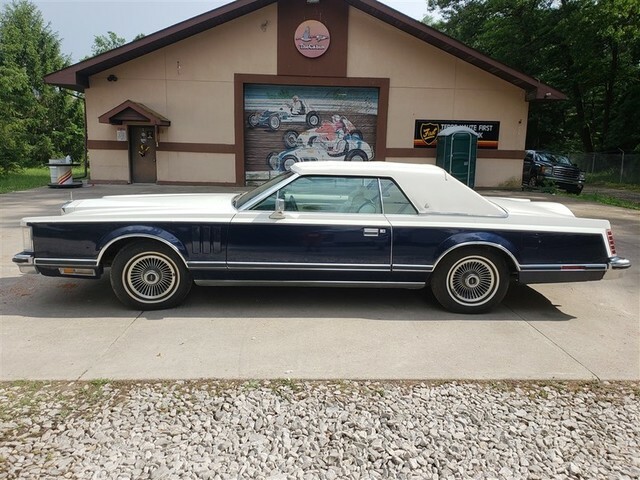 V8, AUTO TRANS, 67,734 MILES, POWER WINDOWS, LOCKS, MIRRORS, SEATS, LEATHER. VIN# 1Z8749S447647, 28,465 MILES. 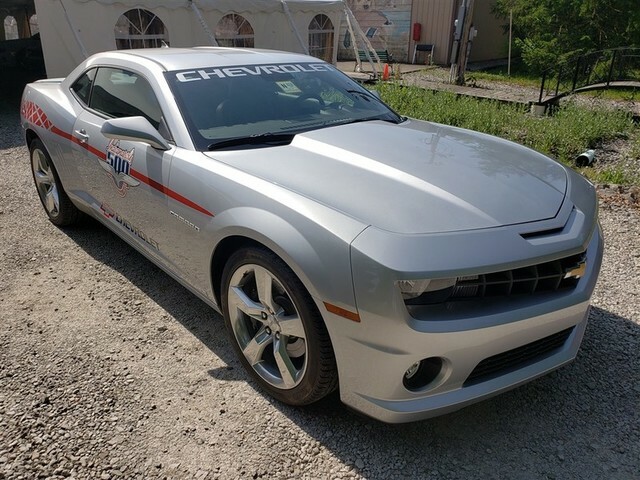 COLOR GREY METALLIC WITH RED INTERIOR. 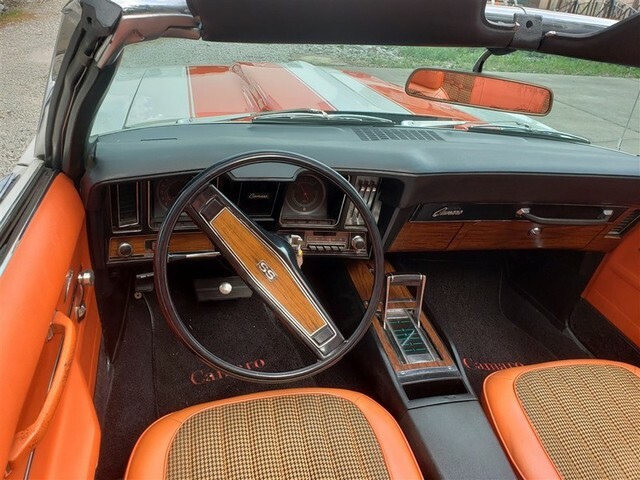 THE 1979 CORVETTE WAS NEARLY IDENTICAL TO ITS PREDECESSOR. FACTORY PRICE WAS $10,220. TOTAL 1979 PRODUCTION WAS 53,807. OF THAT NUMBER, 56,960 WERE PAINTED SILVER. 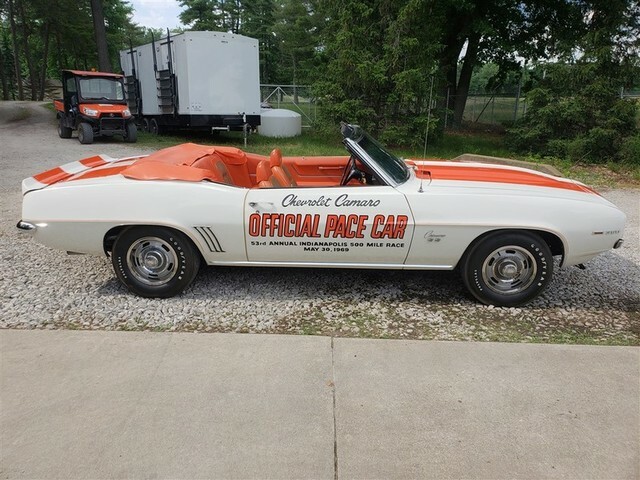 THIS CORVETTE IS EQUIPPED WITH THE OPTIONAL 225 HORSEPOWER L 82 ENGINE, AN AUTOMATIC TRANSMISSION, T TOP, ALLOY WHEELS AND SUN SHIELD., T-TOPS. 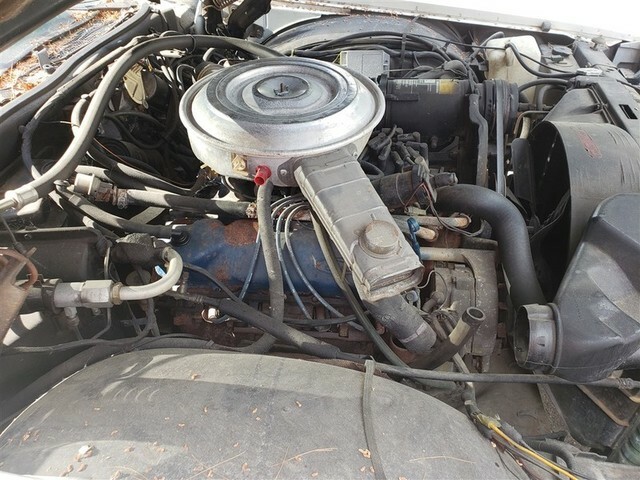 A/C, POWER WINDOWS, 5.7 350, AUTOTRANS. VIN# 9Y89S709989, COLOR TAN. 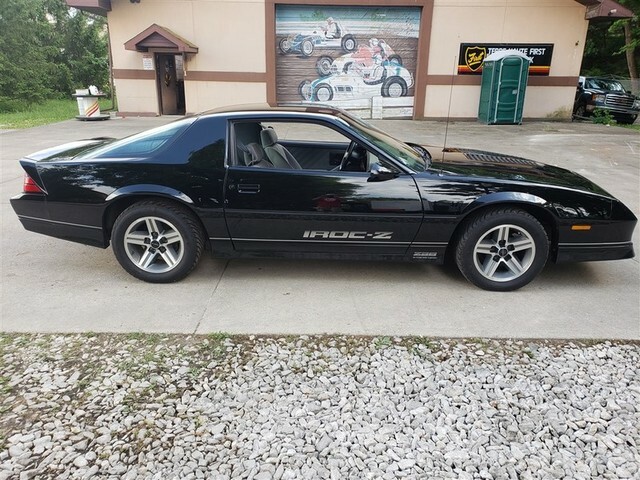 V8, AUTO TRANS, 17,578 MILES, POWER WINDOWS, LOCKS, MIRRORS, CRUISE. VIN# 9Y89S725557, 85,622 MILES. COLOR WHITE/BLUE WITH WHITE INTERIOR. 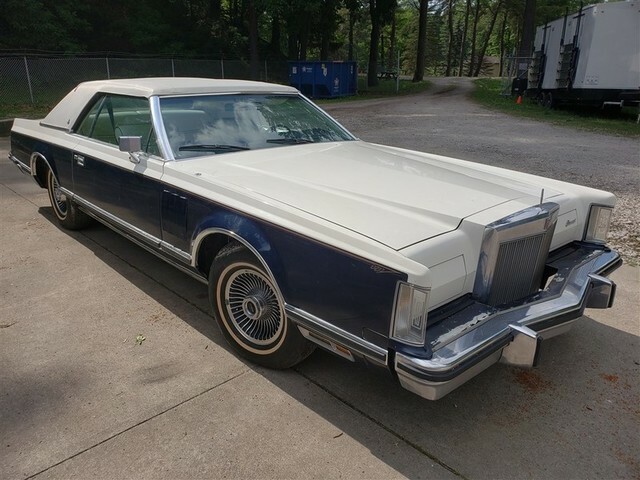 FOR 1979, THE CONTINENTAL MARK V ADDED A COLLECTOR’S SERIES, WITH A CHOICE OF WHITE OR MIDNIGHT BLUE METALLIC PAINT WITH A FABRIC TOP. 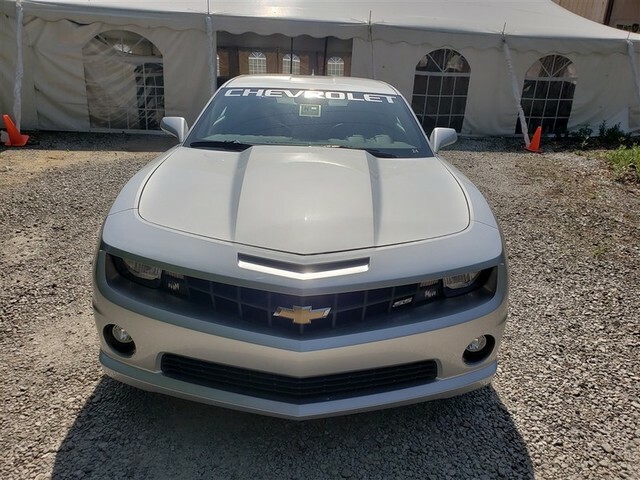 THIS CAR HAS A WHITE TOP. FOUR DESIGNERS SERIES WERE AVAILABLE: BILL BLASS, CARTIER, PUCCI AND GIVENCHY. 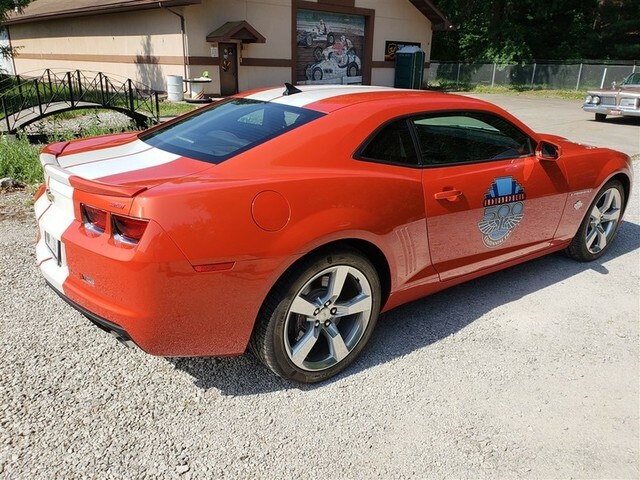 EACH FEATURED A DISTINCT EXTERIOR PAINT SCHEME. THIS IS THE BILL BLASS MODEL. POWER WAS SUPPLIED BY A 400 CUBIC INCH WHEN CAN BE A. FACTORY BASE PRICE OF THE MARK FIVE WAS $13,067. 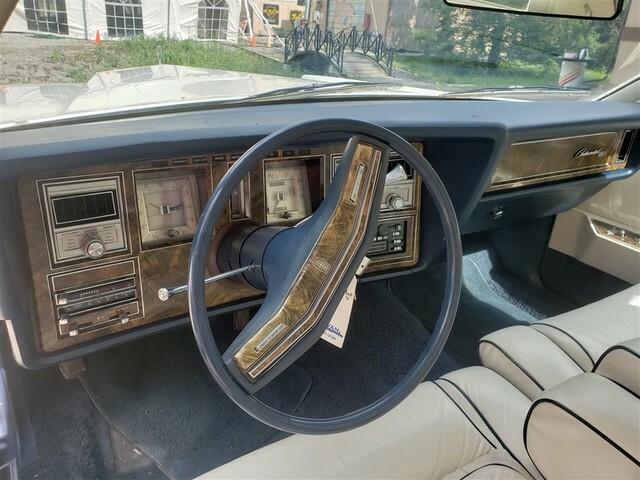 POWER WINDOWS, LOCKS, MIRRORS, CRUISE, LEATHER. 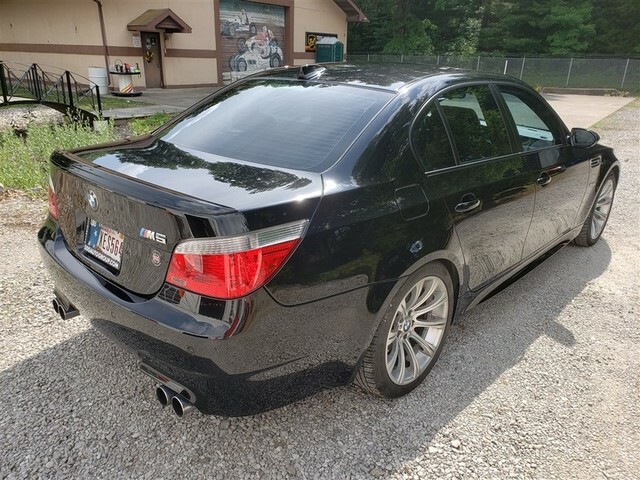 VIN# 1G2AF37R4EP274765, 59,260 MILES. 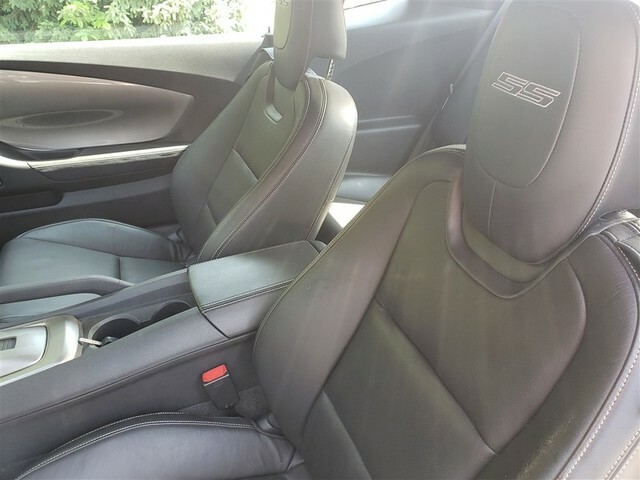 COLOR SILVER WITH BLACK INTERIOR. AS WAS THE FIRST YEAR FOR THE INNOVATIVE NEW FIERO. THIS MODEL IS THE 2M4. 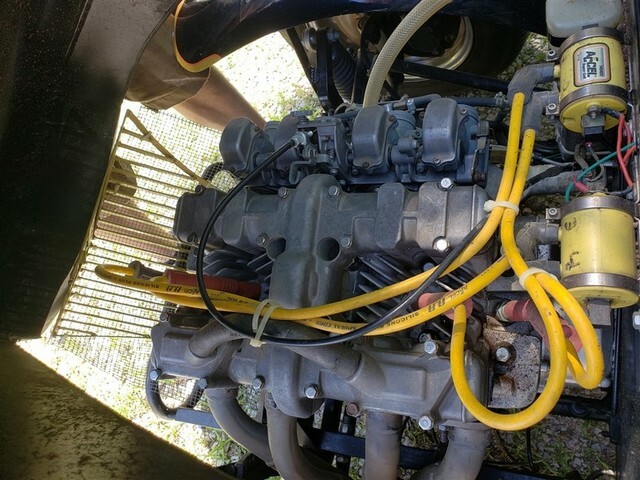 IT IS A TWO SEAT, MID-ENGINE, FOUR CYLINDER AUTOMOBILE. BODY PANELS ARE PLASTIC. FACTORY PRICE $9,599. 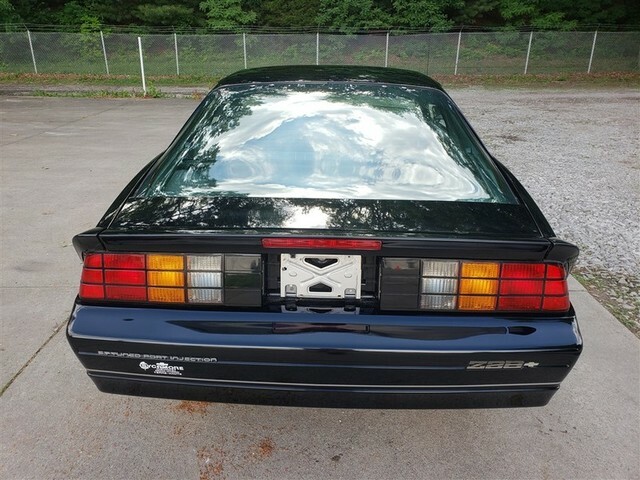 TOTAL PRODUCTION OF THE SE COUPE IN 1984 WAS 67,671. 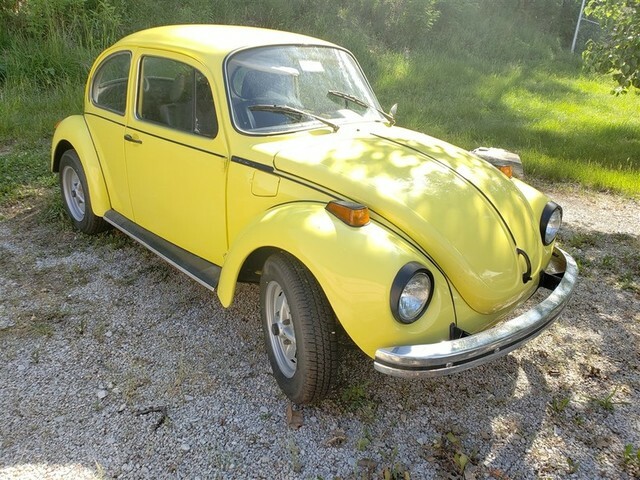 AC/HEAT, POWER WINDOWS, LOCKS, SUN ROOF, 4 CYL. IN-LINE, AUTO TRANS. VIN# 1G6VR3187KU102296, COLOR BLACK. 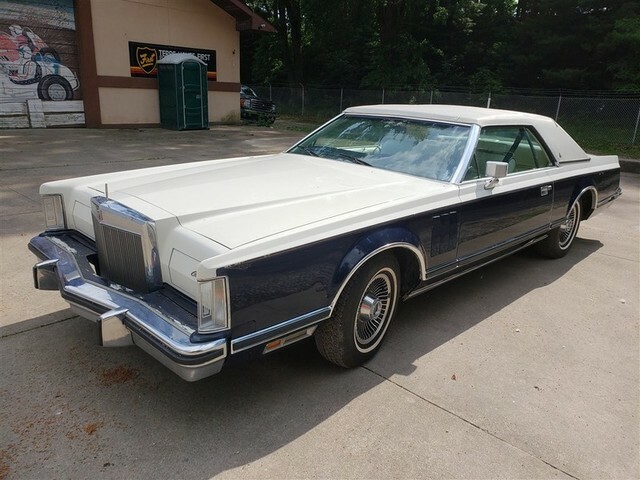 4.5L V8, AUTO TRANS, 79,370 MILES, POWER WINDOWS, LOCKS, MIRRORS, SEATS, LEATHER. VIN# 1G1FP2181HN170073, COLOR BLACK. 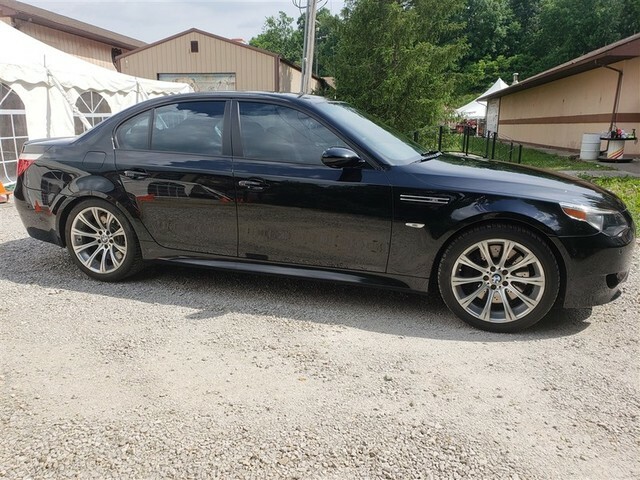 V8, 350 5.7L, AUTO TRANS, 1,109 MILES, POWER WINDOWS, LOCKS, MIRRORS. VIN# 3GCCW80H6H5902172, COLOR BLACK. 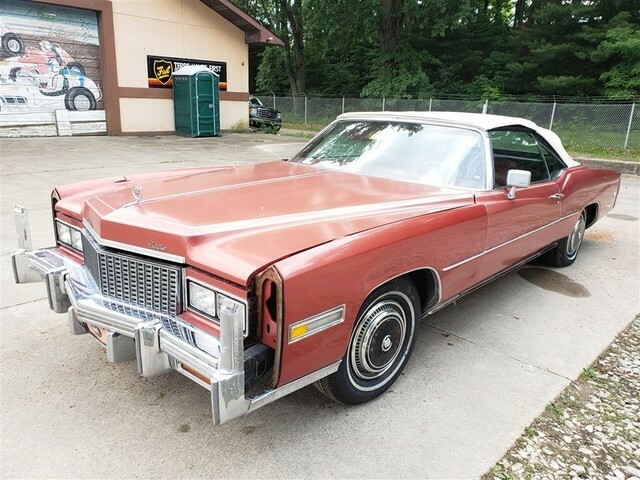 V8, 305, AUTO TRANS, 91,133 MILES, LEATHER, POWER WINDOWS, LOCKS, MIRRORS. VIN# 1G1AY8763B5101120, COLOR BURGANDY. 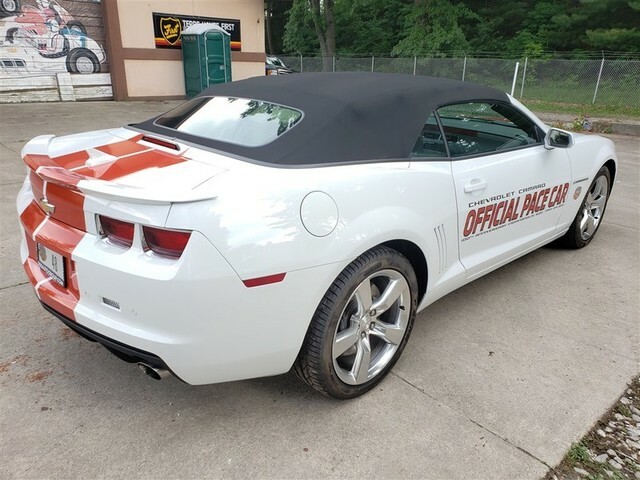 T-TOP, 5.7L V-8, AUTO, 382 MILES, A/C, POWER WINDOWS, LEATHER. BURGUNDY. VIN# SCEDT2676BD006800, COLOR SILVER. 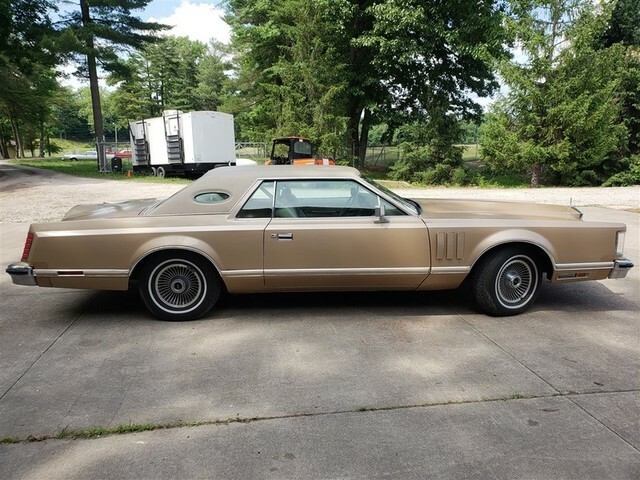 V8, 5.7L, AUTO, 20,014 MILES, LEATHER, T-TOP, POWER WINDOWS, LOCKS, MIRRORS, SEATS, CRUISE. VIN# 1G1YY0780F5100241, COLOR IS BLUE METALLIC WITH BLUE CLOTH INTERIOR. 22,350 MILES. 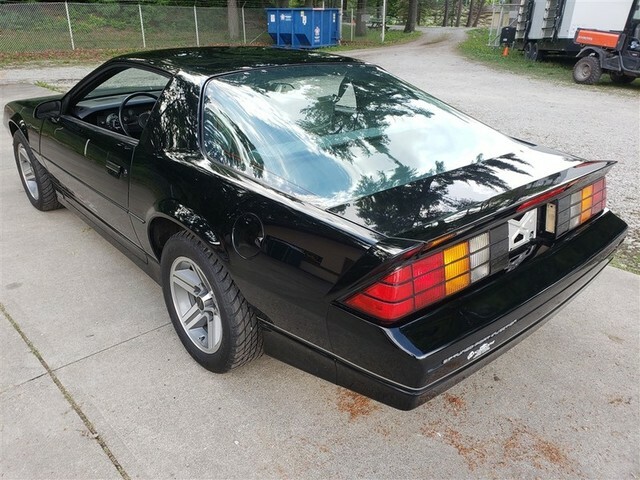 FOR 1985, THE CORVETTE LOOKED VERY MUCH LIKE THE 1984 VERSION, WHICH HAD UNDERGONE A RESTYLING, BUT HAD SOMETHING NEW UNDER THE HOOD; A 5.7 LITER, PORT INJECTED V8 WITH A 230 HORSEPOWER RATING. 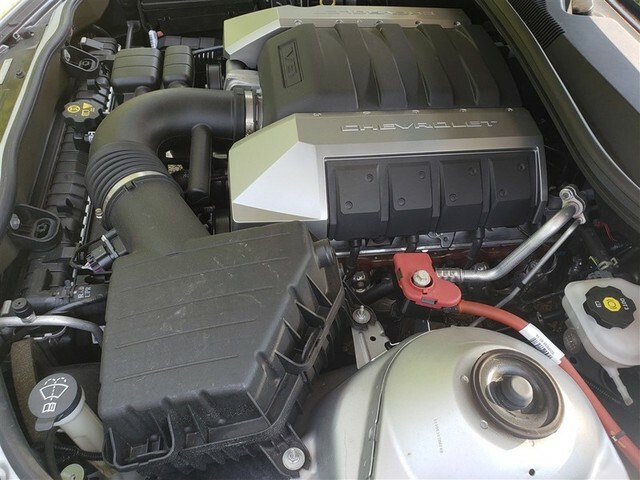 THE COMPANY REDUCED THE CAR’S WEIGHT WITH THE INCREASED USE OF FIBER GLASS AND ALUMINUM. 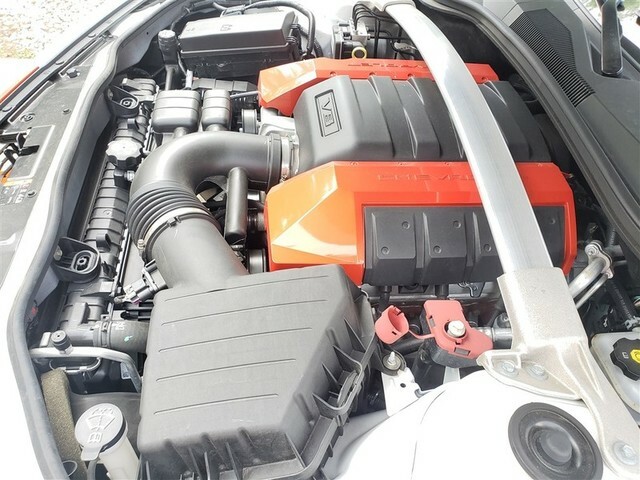 THIS CAR, COUPLED WITH THE NEW ENGINE, REDUCED THE CAR’S 0 TO 60 MPH RATING CONSIDERABLY. 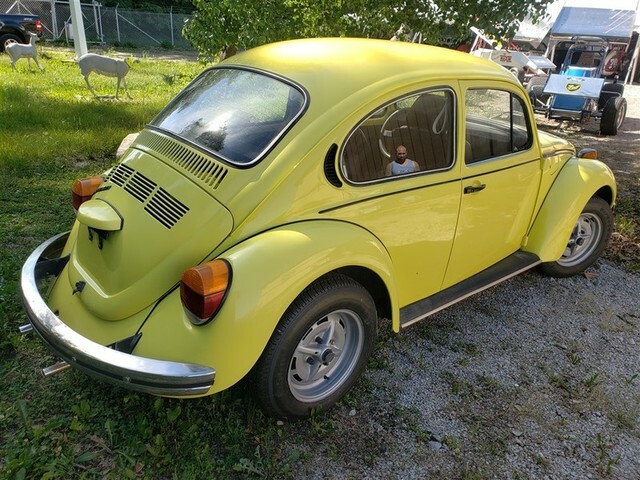 TARGA TOP, POWER WINDOWS, LOCKS, MIRRORS, SEATS FABRIC. VIN ?????? 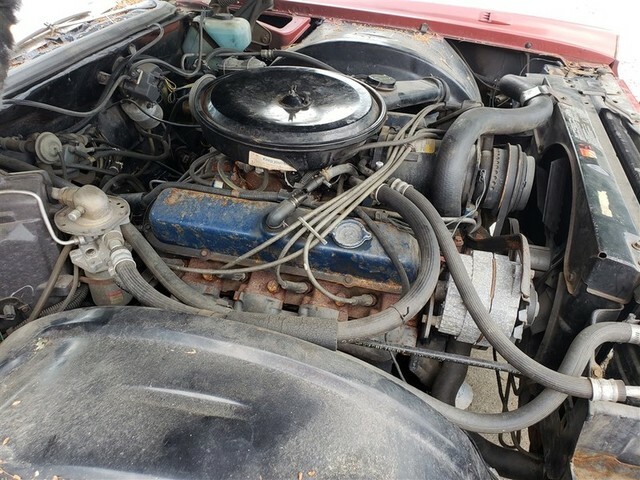 ?, COLOR RASBERRY., V8 427 FORD SMALL BLOCK STROKER, 505 HP, AUTO TRANS, 259 MILES, CORVETTE FRONT AND REAR SUSPENSION, CALFSKIN LEATHER INTERIOR AND TRUCK, SUICIDE DOORS. BUILT BE LEE TAYLOR, CAYUGA, INDIANA. VIN #1C3EW65G72V101514, COLOR YELLOW. 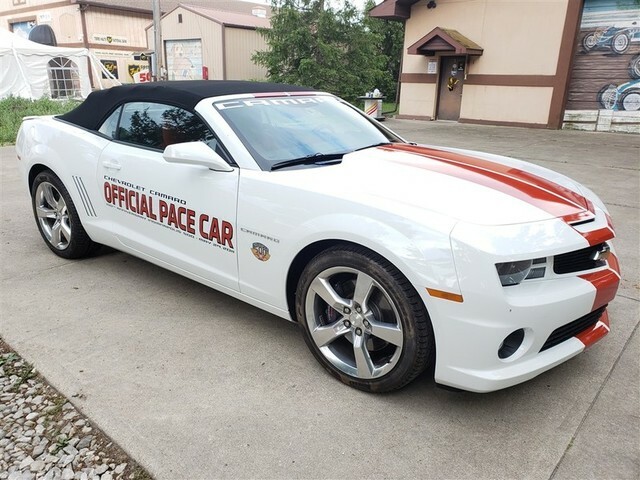 3.5 LITER V-6, 24-VALVE, AUTO TRANS, 1,712 MILES, A/C, CONVERTIBLE, POWER WINDOWS, LOCKS, MIRRORS. VIN #2G1FP32G022157877, COLOR SILVER. 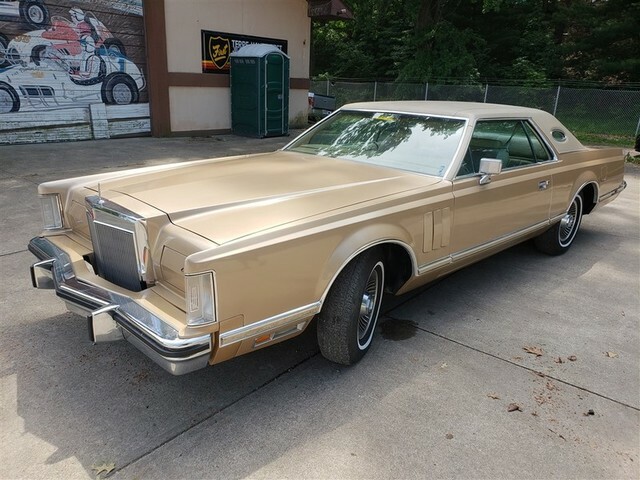 V-8 5.7L, 3-SPEED AUTOMATIC TRANSMISSION, 20,241 MILES, LEATHER, POWER WINDOWS, MIRRORS, LOCKS. VIN# 1G1YZ23J5L5802942, COLOR RED. 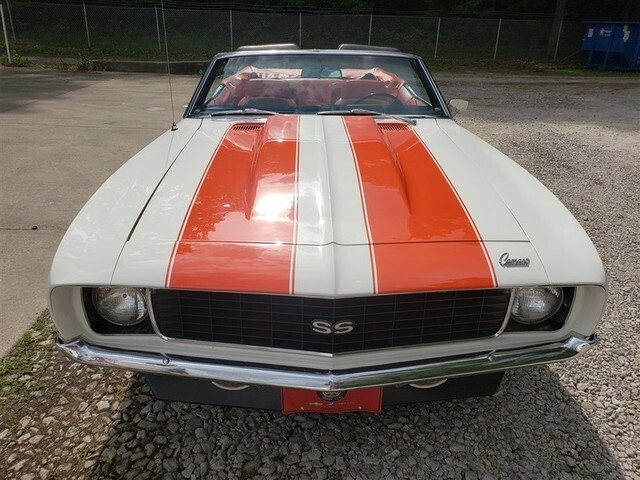 V8, 5.7 4 CAM 32 VALVE, MANUAL TRANS, 5,758 MILES, TARGA TOP, POWER WINDOWS, LOCKS, MIRRORS, SEATS, RIDE CONTROL, LEATHER. VIN# 2G2FV22G012112707, COLOR PEWTER. 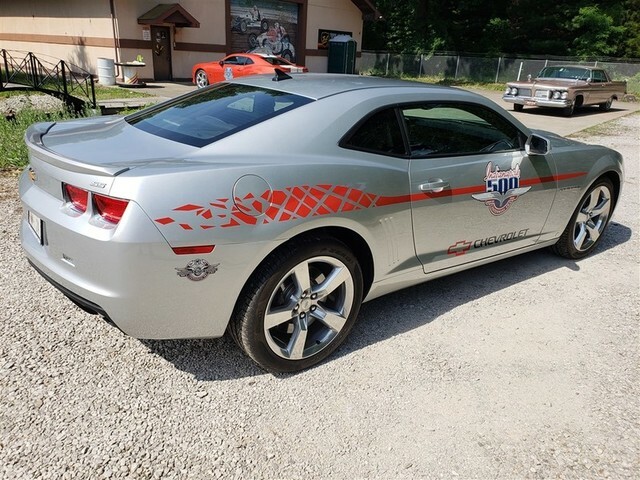 WS6, PERFORMANCE PACKAGE, V8, AUTO, 11,843 MILES, A/C, POWER WINDOWS, LOCKS, MIRRORS, PEWTER W/BLACK LEATHER. VIN 2G2FV22G222109437, COLOR WHITE. 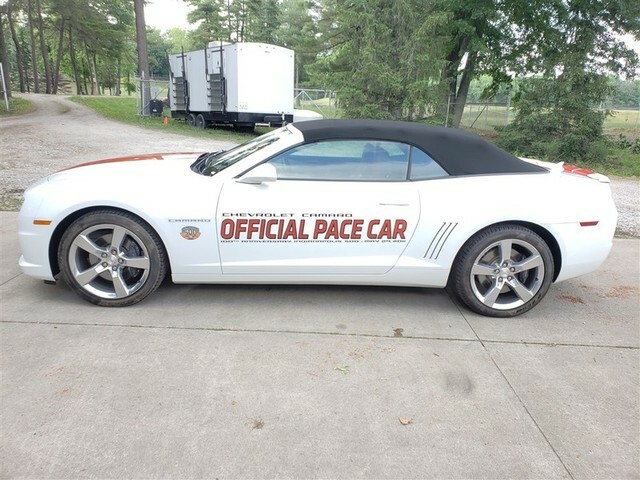 WS6, PERFORMANCE PACKAGE, 5.7L, V8, AUTO, T-TOP, POWER WINDOWS, LOCKS, MIRRORS, WHITE W/BLACK LEATHER INTERIOR, A/C POWER. VIN# 2G1FP22K522109371, COLOR WHITE W/BLACK INTERIOR. 8,813 MILES. 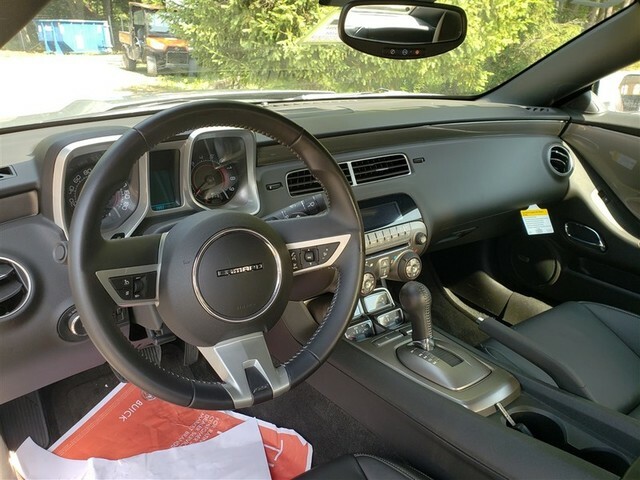 3.6L V6, AUTO TRANS, LEATHER, POWER WINDOWS, LOCKS, MIRRORS, SEATS, CRUISE. VIN# 1B3ER69E4TV100575, COLOR BLUE. 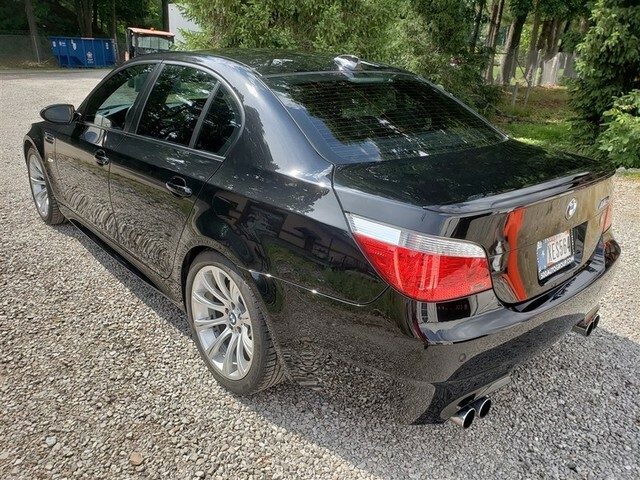 V10, 415 HP, 6 SPEED MANUAL, LEATHER, POWER WINDOWS, LOCKS, MIRRORS. 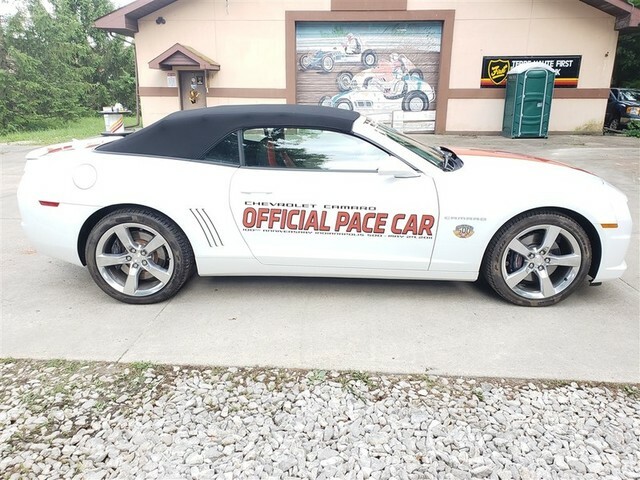 THIS CAR IS ONE OF ONLY THREE BUILT FOR THE INDIANAPOLIS MOTOR SPEEDWAY IN 1996. 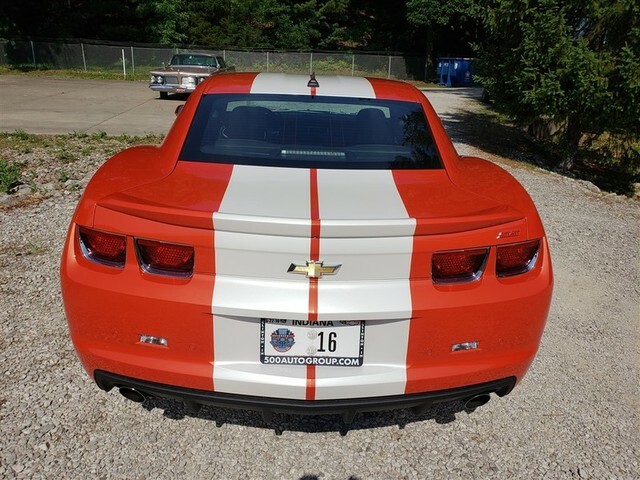 THIS CAR WAS OWNED BY, AND PURCHASED FROM, TONY HULMAN GEORGE. 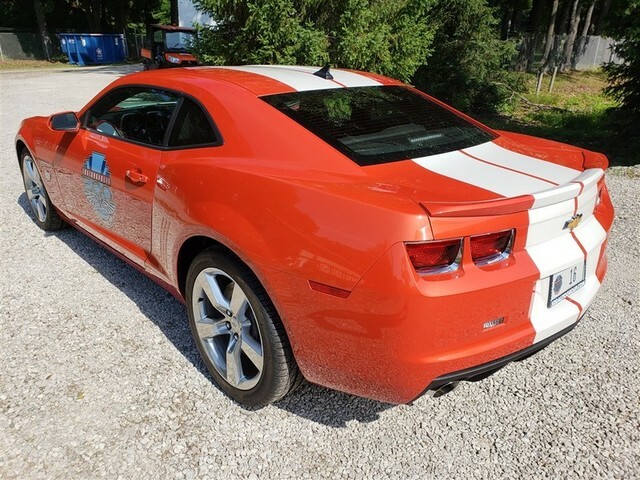 VIN# 124679N616443, COLOR IS WHITE WITH ORANGE ACCENTS, ORANGE INTERIOR. 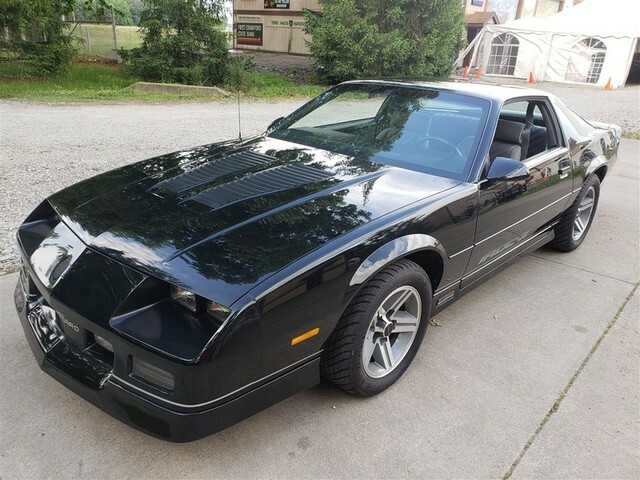 V8, AUTO TRANS, 80,696 MILES, LEATHER/CLOTH INTERIOR. 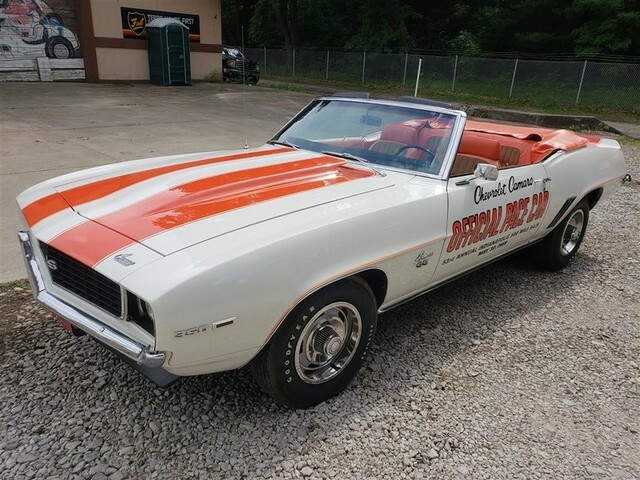 THE 1969 CAMARO IS ONE OF THE MOST SOUGHT-AFTER MUSCLE CARS IN THE WORLD! 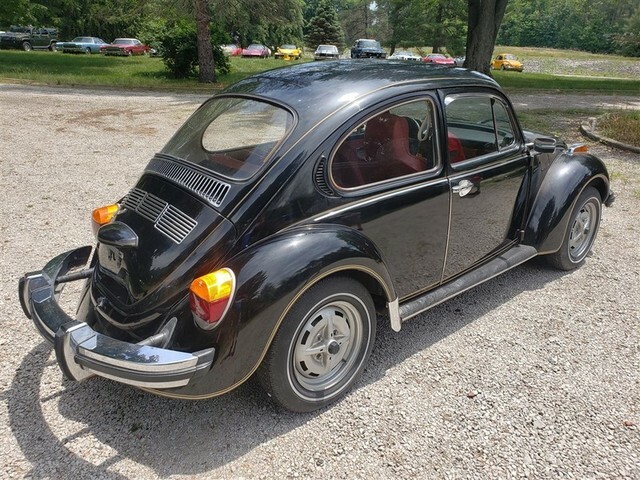 VIN# 2L67S304345548, 67,312 MILES. 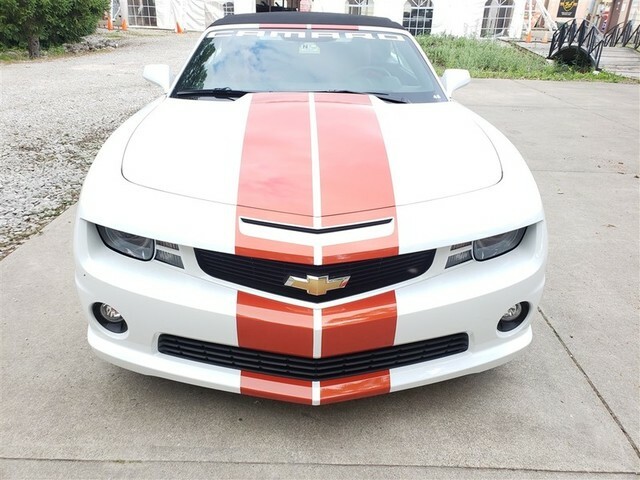 COLOR WHITE WITH RED INTERIOR. 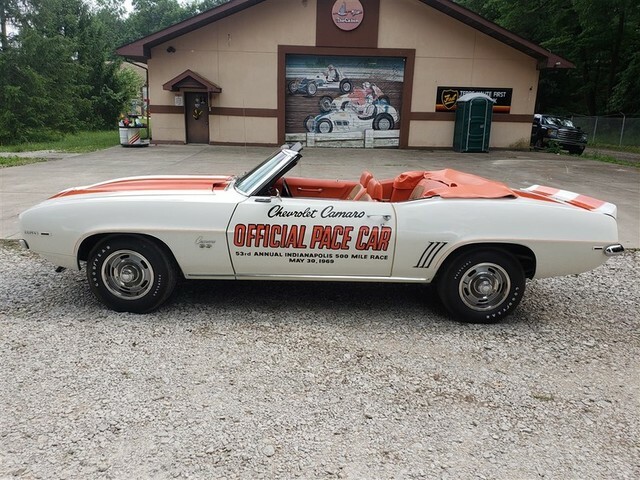 THIS IS A 1973 INDIANAPOLIS PACE CAR. 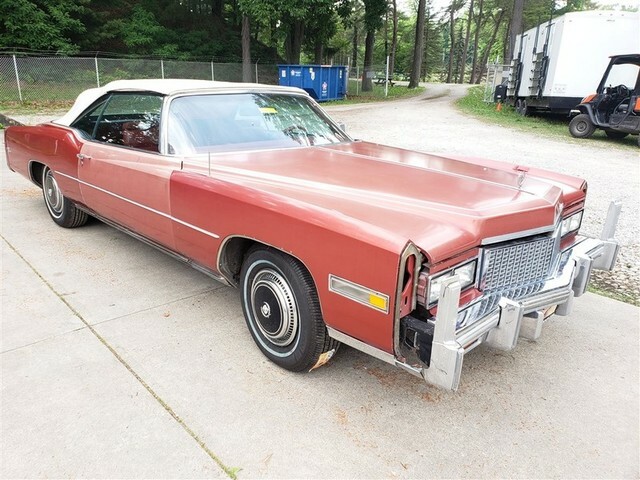 FOR 1973 CADILLAC ELDORADO WAS COMPLETELY REDESIGNED. 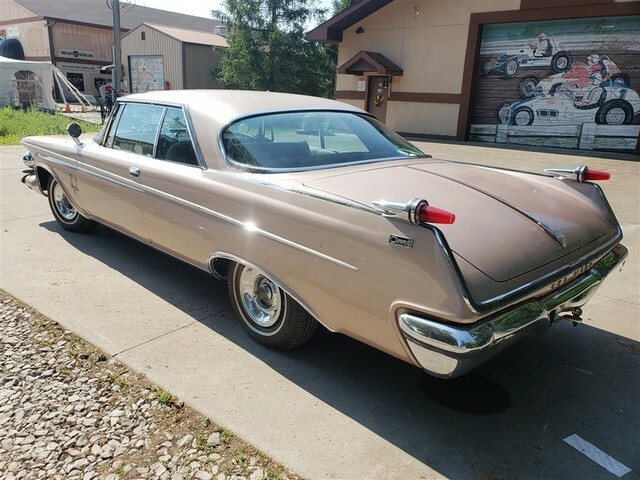 POWERED BY A CADILLAC 500 CUBIC INCH OVERHEAD VALVE V8 ENGINE THAT PRODUCED 365 HORSEPOWER. LOADED WITH OPTIONS. WHITE EXTERIOR, RED INTERIOR. FACTORY PRICE WAS $7,681.00. 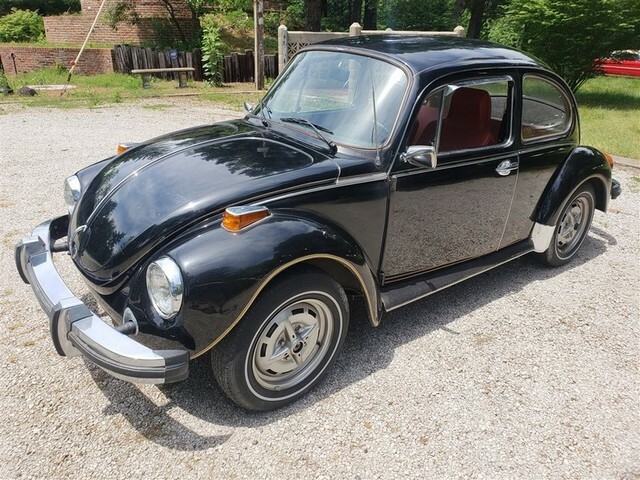 AUTO TRANS, LEATHER, POWER WINDOWS, LOCKS. 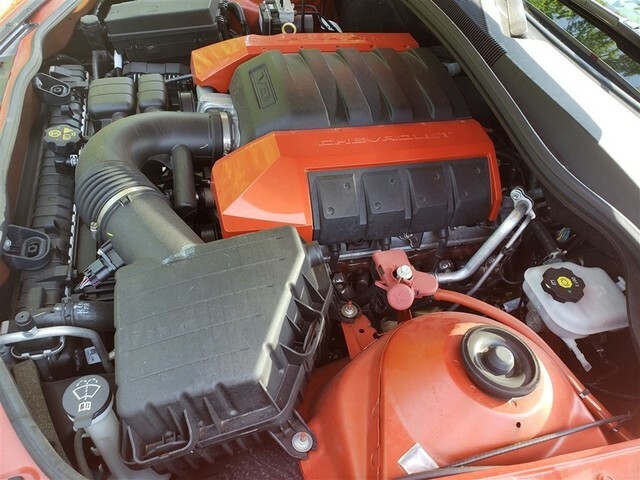 VIN# 2G1FK1EJ2A9210711, COLOR IS ORANGE. 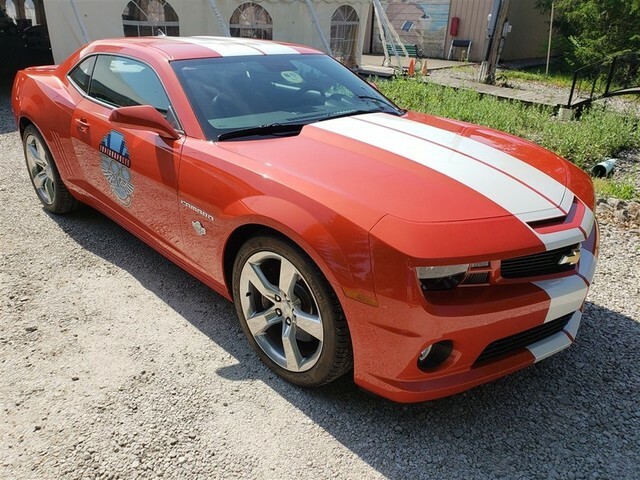 V8 6.2L, LEATHER, POWER WINDOWS, LOCKS, MIRRORS, SEATS. VIN# 2G1FK1EJ6A9000757, COLOR IS SILVER. 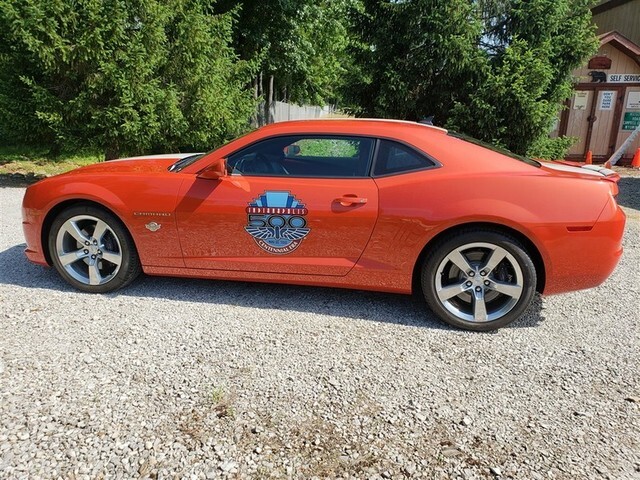 V8, 6.2L 400 HP, AUTO TRANS, LEATHER, POWER WINDOWS, LOCKS, MIRRORS, SEATS. VIN# 1G1YY26W485124444, COLOR IS BLACK/SILVER. 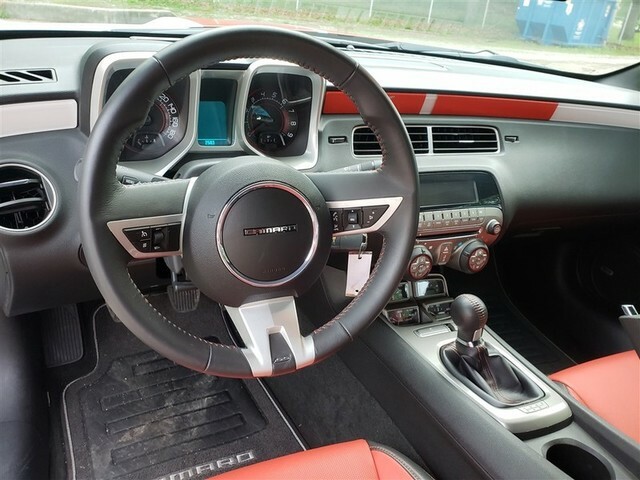 V8, 436 HP, 6 SPEED TRANS, LEATHER, POWER WINDOWS, LOCKS, MIRRORS. VIN# 1G1YY36UX75140330, COLOR IS ORANGE. 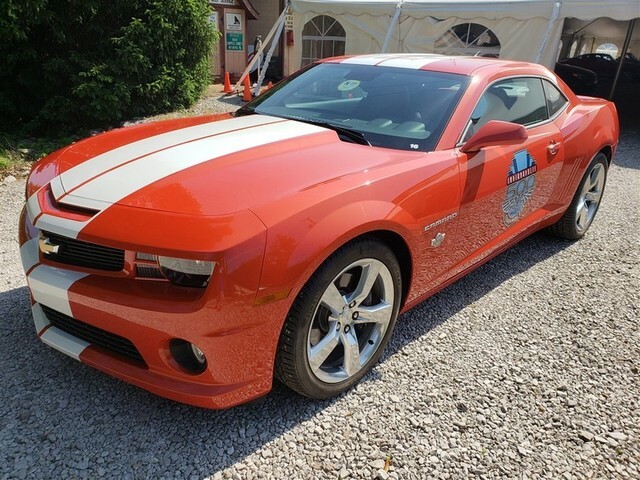 V8, AUTO TRANS, 400 HP, LEATHER, POWER WINDOWS, LOCKS, MIRRORS, 1 OF 500. 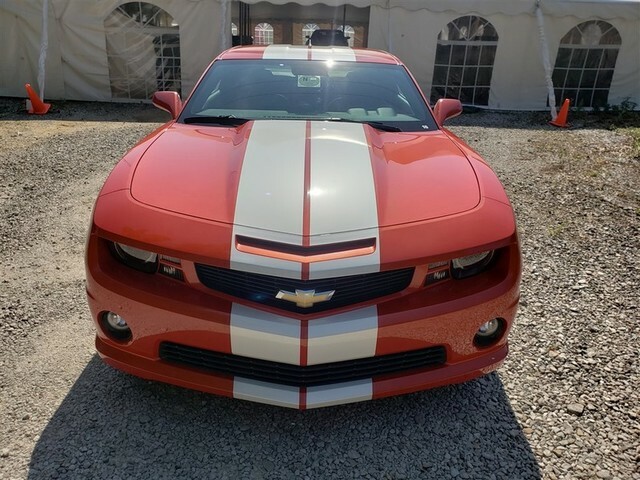 VIN# 1GYY34U955128038, COLOR IS RED V8 6L, MANUAL TRANS, LEATHER, POWER WINDOWS, LOCKS, MIRRORS. VIN# 1G1YY32G845127300, COLOR IS BLUE. 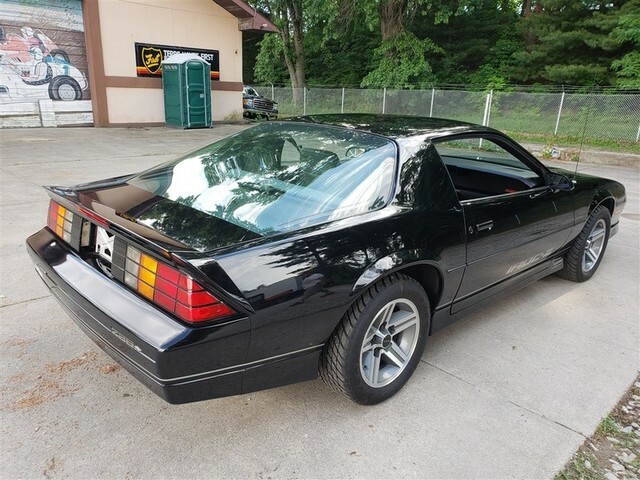 V8, AUTO TRANS, LEATHER, POWER WINDOWS, LOCKS, MIRRORS. VIN# 1G1YY32G0W5116018, COLOR IS PURPLE. 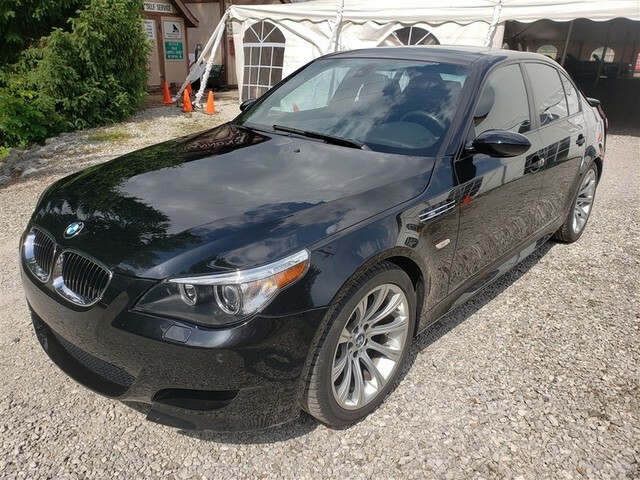 V8, AUTOMATIC TRANS, LEATHER, POWER WINDOWS, LOCKS, MIRRORS. VIN# 1G1YY32P6S5111299, COLOR IS MAROON W/WHITE TOP. 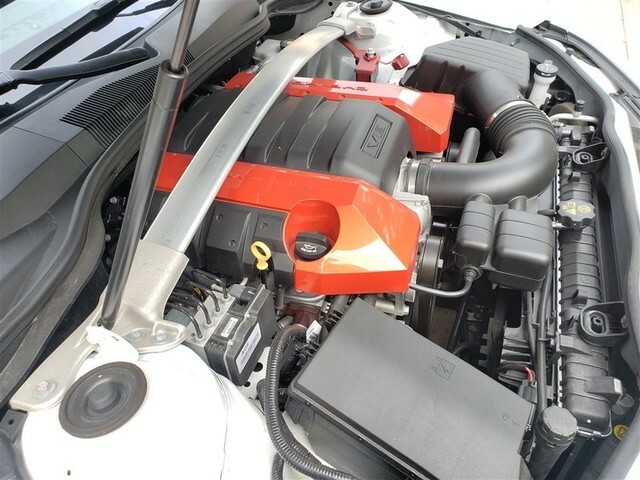 5.7 LITER, AUTO TRANSMISSION. 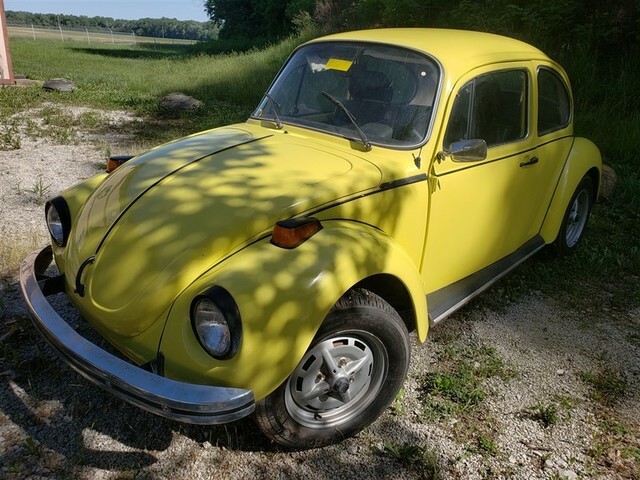 VIN# 1G1YY6785G5900506, COLOR IS YELLOW V8, AUTO TRANS, 12,108 MILES, LEATHER, POWER WINDOWS, LOCKS, MIRRORS. VIN# 1G4AZ5ZY1DE441157, COLOR TAN & BEIGE. 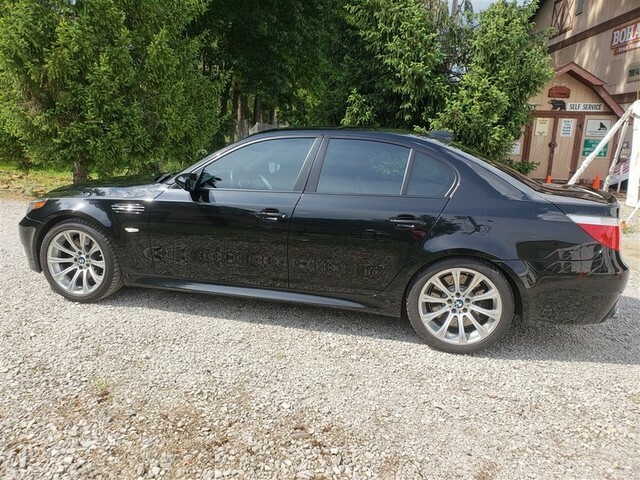 V6, AUTO TRANS, LEATHER/CLOTH, POWER WINDOWS, LOCKS. 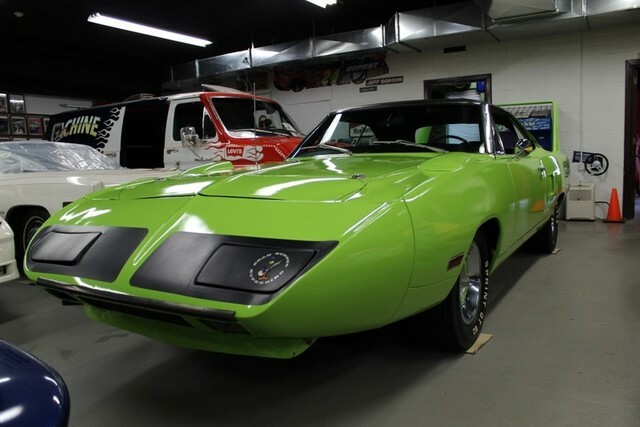 THIS CAR IS A ONE OF A KIND. 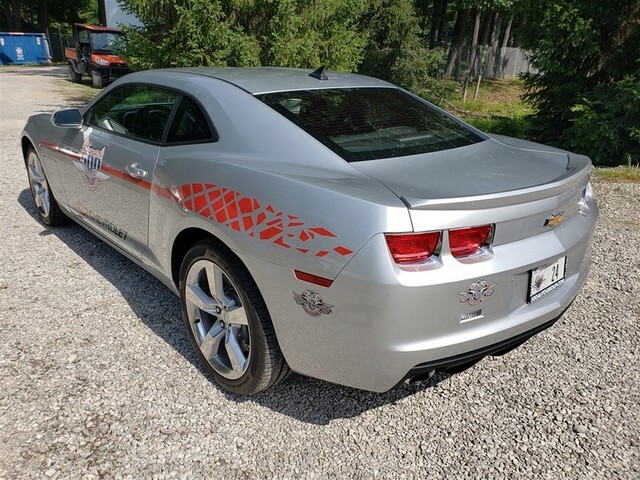 IT WAS BUILT FOR A GM EXECUTIVE WITH EXCLUSIVE COLOR SCHEME. 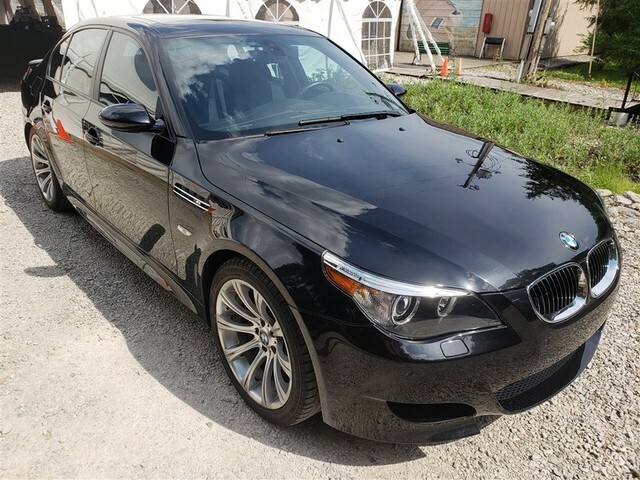 VIN# 1287L85904624, COLOR IS BLACK/SILVER V8, AUTO TRANS, 2,424 MILES, LEATHER, POWER WINDOWS, LOCKS, MIRRORS. VIN# 2G1WX12X5S9121193, 102,258 MILES. 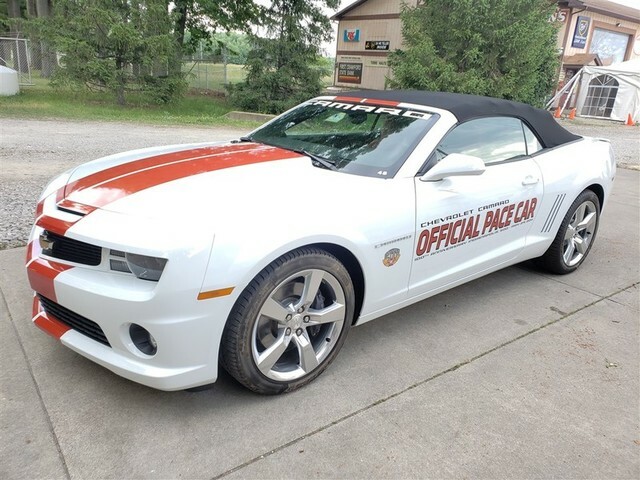 REPLICA OF THE OFFICIAL BRICKYARD 400 PACE CAR, FIRST YEAR, SIGNED BY JEFF GORDON, THE WINNER OF THE INAGURAL RACE. 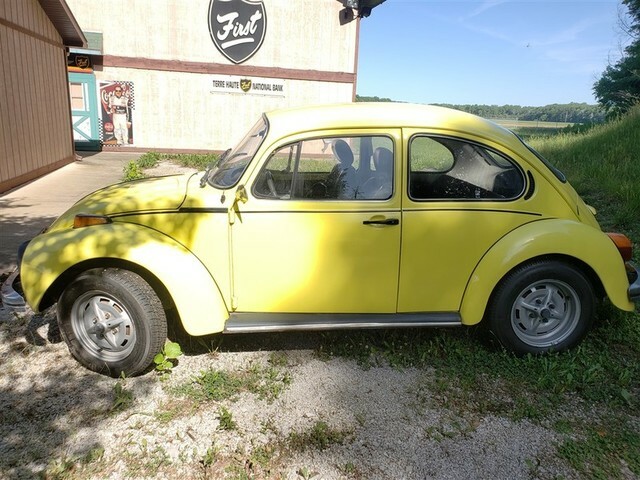 BUILT IN 06/94, 3.4L, V6, AUTO TRANS, LEATHER, POWER WINDOWS, LOCKS, MIRRORS, SEATS. VIN# 1S87L9N557610, 3,664 MILES. 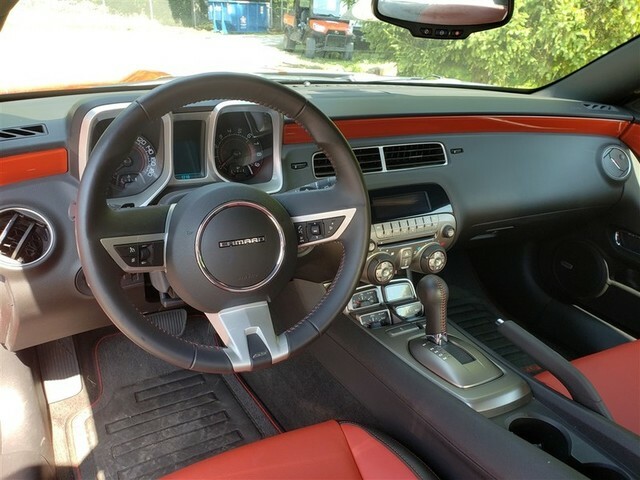 COLOR BLACK WITH RED TRIM, BLACK/RED INTERIOR. THIS IS A ONE-OFF PROTOTYPE BUILT FOR FASHION DESIGNER JOHN WEITZ, BY MALLALIEU MOTORS OF ABBINGTON, OXFORDSHIRE, ENGLAND, BASED ON A 1979 CHEVROLET CAMARO Z28. BODY WORK IS ALL ALUMINUM. 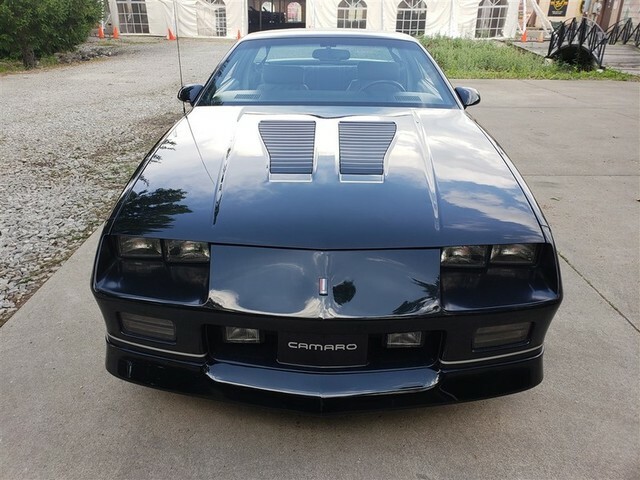 THE CHASSIS IS ESSENTIALLY A CAMARO Z28. 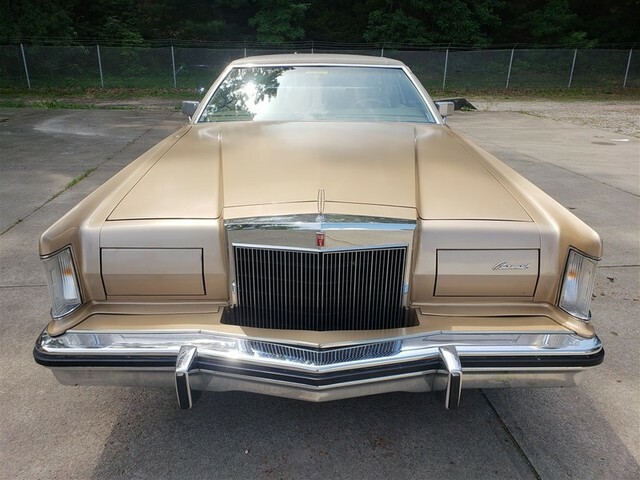 THIS CAR RECEIVED THE CARTIER AWARD OF EXCELLENCE IN DESIGN AT PALM BEACH FLORIDA IN 1981. 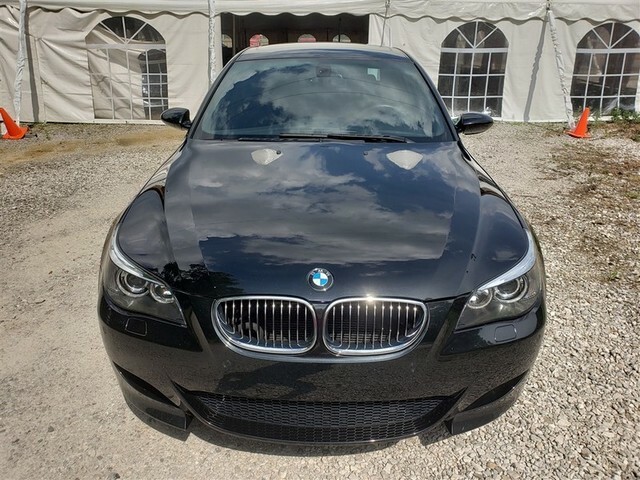 UNLIKE OTHER CARS WITH FASHION DESIGNER NAMES ON THEM—GUCCI, CARDIN, BILL BLASS — THE X600 WAS STYLED FROM THE GROUND UP BY WEITZ. 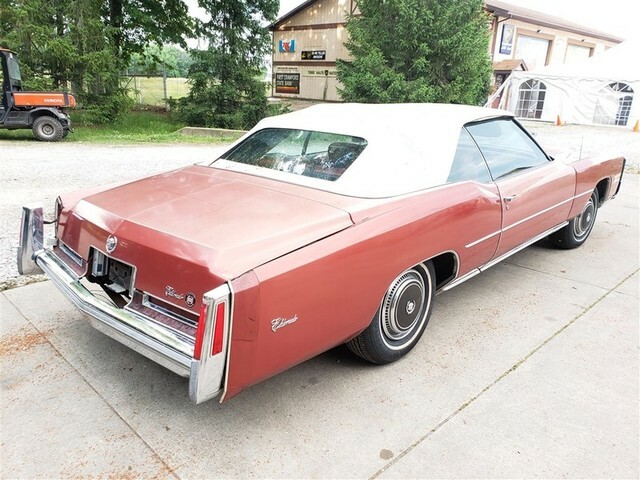 THE DESIGNER CADILLACS AND CONTINENTALS HAVE ONLY PAINT, UPHOLSTERY AND BADGES TO DISTINGUISH THEM FROM THEIR MASS-PRODUCED COUNTERPARTS. 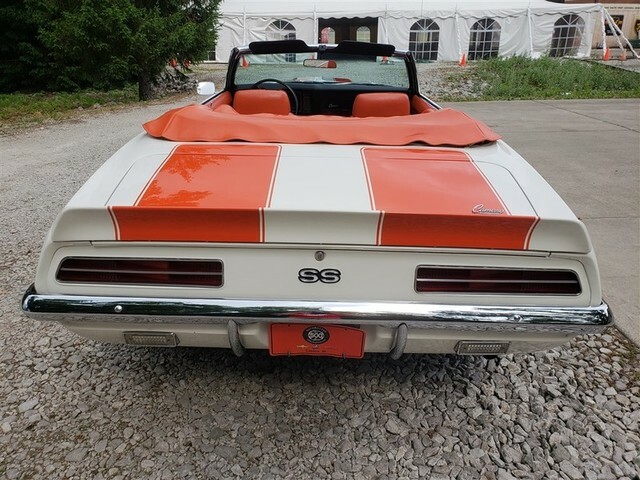 IT WAS SOLD TO DON SMITH BY JOHN MECOM, JR., FORMER OWNER OF THE NEW ORLEANS SAINTS FOOTBALL TEAM. 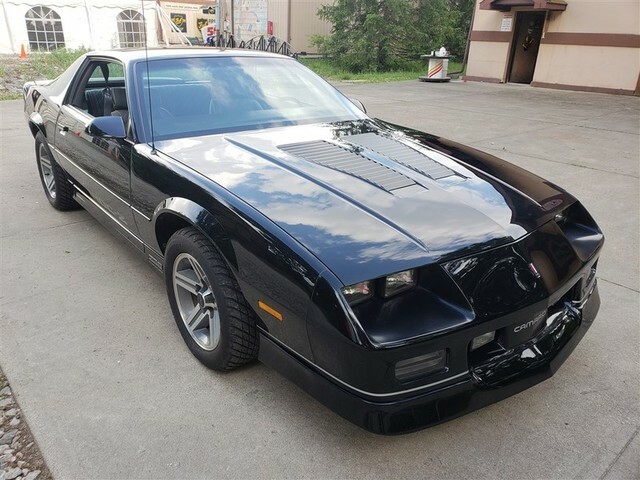 IT IS TITLED AS A 1979 CHEVROLET CAMARO. 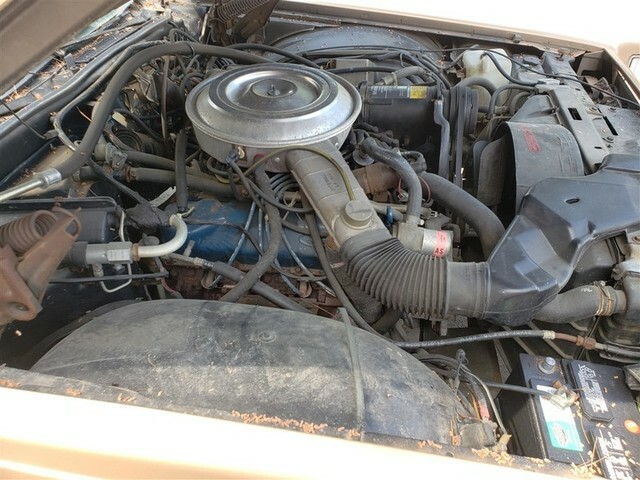 5.7L 350, AUTO TRANS, LEATHER. VIN# ZFFXA20A8H0073257, COLOR WHITE. 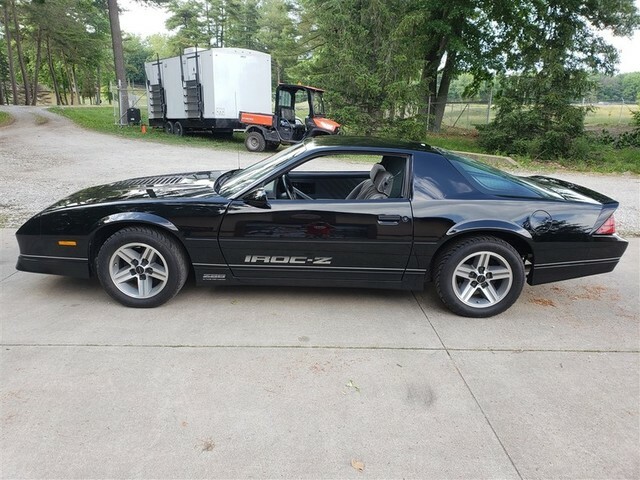 3.2L 32-VALVE V8 SOHC, MANUAL TRANS, 13,375 MILES, TARGA TOP, POWER WINDOWS, LOCKS, MIRRORS, CD. 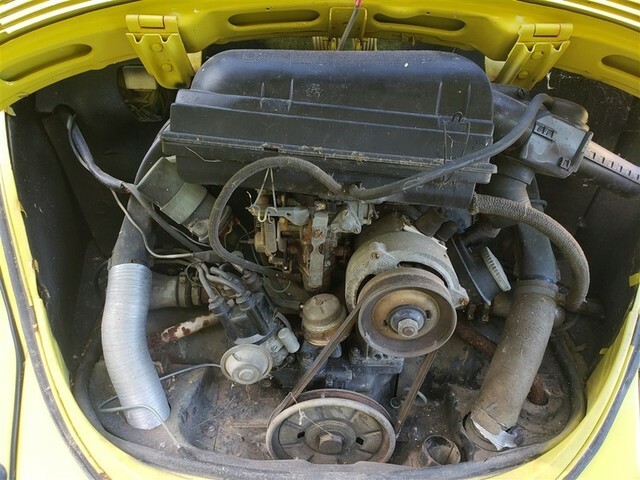 VIN# 1332743780, COLOR YELLOW. MANUAL TRANS, 88,589 MILES. MUCH MORE NOT LISTED! FULL CATALOG COMING SOON! Terms of Payment: Payment of the purchase price is due immediately upon the auctioneer’s declaration of sale. All payments must be in the form of cash or certified funds unless other arrangements have been approved in advance. Cash payments will be reported according to U.S. Federal government requirements. Should a bidder default on payment in any manner whatsoever, without limiting any recourse Gallivan Auctioneers may have, bidder agrees to pay Gallivan Auctioneers all lost auction fees (which is the maximum published rates for (a) the bid price, (b) the Buyer’s premium, and (c) the sales tax). This amount is due and payable without relief. Bidder will also be liable to seller for its damages. Bidder hereby authorizes Gallivan Auctioneers to deduct these lost auction fees from bidder’s cash deposit, or to charge this amount to bidder’s credit card provided. Bidder agrees not to dispute this charge with the credit card company at any time. Bidder agrees to also pay Gallivan Auctioneers costs of collection, including attorney fees and cost. Risk of Loss: Bidder is responsible for all risk of loss or damage immediately upon purchase of vehicle or item, which occurs at the time of sale when the bidder is declared by the auctioneer to have the successful bid. 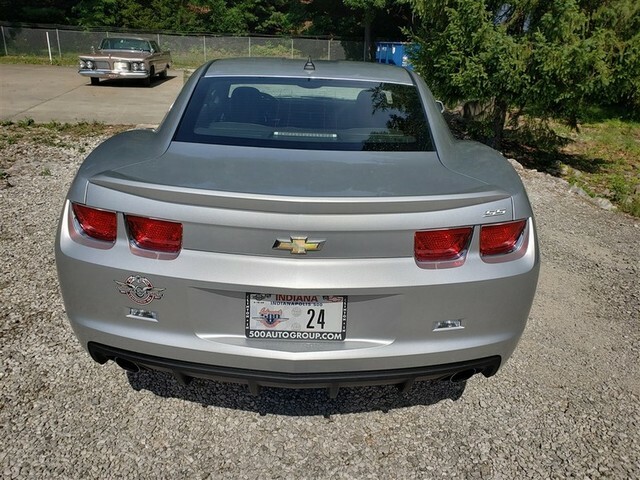 All vehicles or items purchased must be removed from the auction site at the bidders’ expense within fourteen (14) days following the sale. 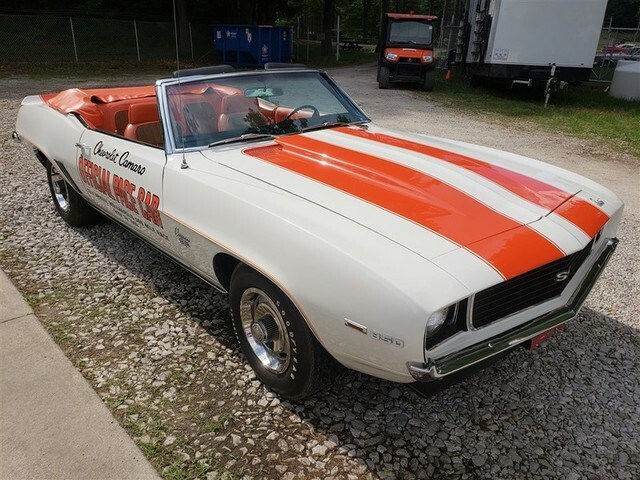 If not removed by the fourteenth day following the sale, Gallivan Auctioneers will charge a storage fee of $50.00/day or remove the vehicle or item with all costs of moving and storage to be paid by the bidder. There will be no removal on preview or auction days. Firearms Terms: All transfers of firearms will be handled by a licensed Federal Firearms Licensee (FFL) and subject to a $30/gun transfer fee. No firearms will be transfered the day of the sale. Firearms can be picked up starting Monday, June 18th at 10:00 AM. Firearms can only be picked up at Top Guns (5050 S. 7th St., Terre Haute, IN) or transferred through them. You must have a current and valid state or federally issued photo ID. Your address must be correct on your license for it to be valid. Arrangements must be made within ten (10) days of the end of auction. After that date, there will be a $20 per day storage fee per firearm. Items not picked up after three (3) months will become the property of Top Guns. Shipping for firearms will be $35 for two day air for pistols ($10 for each additional pistol), and $35 ground for long guns ($10 for each additional long gun). Insurance may be purchased for 1.12% of total value of item being shipped. We are not responsible for lost or stolen items. Firearms Transfer Fee: All firearms will be charged a $30 transfer fee per firearm due upon payment of the firearm. Black Powder and percussion firearms will not be charged a transfer fee and may be picked up on any of the removal days. ONCE COMPLETED, SEND THIS ACKNOWLEDGEMENT TO: getinfo@njgallivan.com or fax to (317) 227-3725. This letter will serve as your notification that (Bank Name) will irrevocably honor and guarantee payment of any check(s) written by, or wire transfers sent by (Customer’s Name), to Norman J. Gallivan, Inc. (Norman J. Gallivan, Inc. Escrow Account) up to the amount of ($_______________________) and drawn on Account Number (last 4 digits of the Account Number). 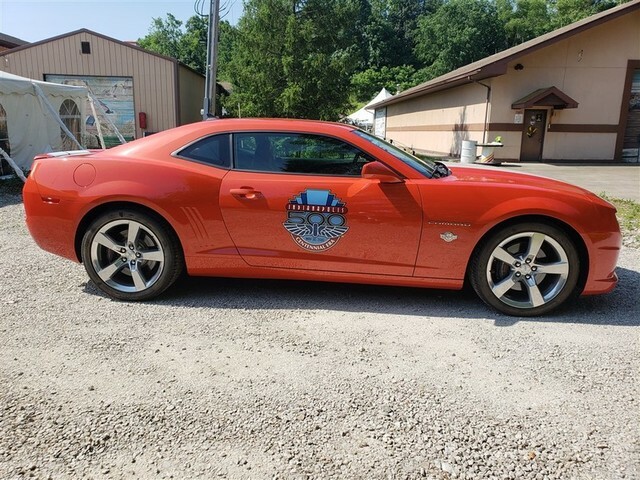 PARKING IS AT THE TERRE HAUTE REGIONAL AIRPORT (KHUF), LOCATED AT 581 S. AIRPORT ST, TERRE HAUTE, IN 47803. FREE SHUTTLE SERVICE WILL DEPART EVERY 20-25 MINUTES BEGINNING AT 7:30 AM.